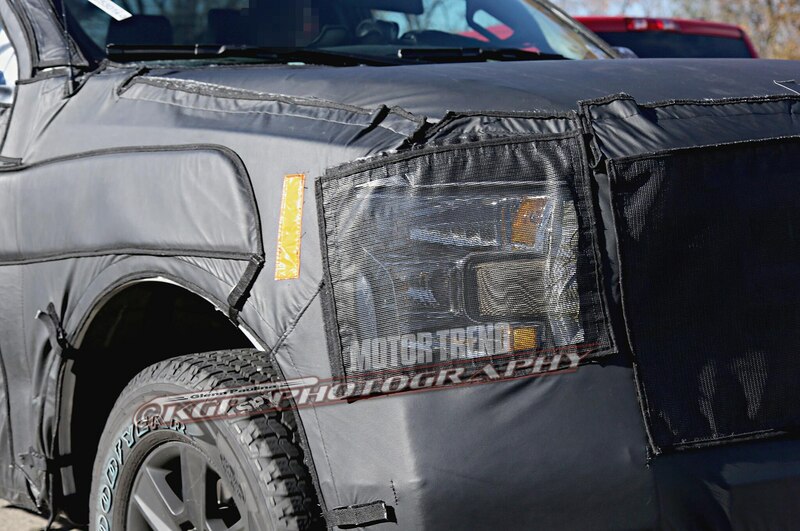 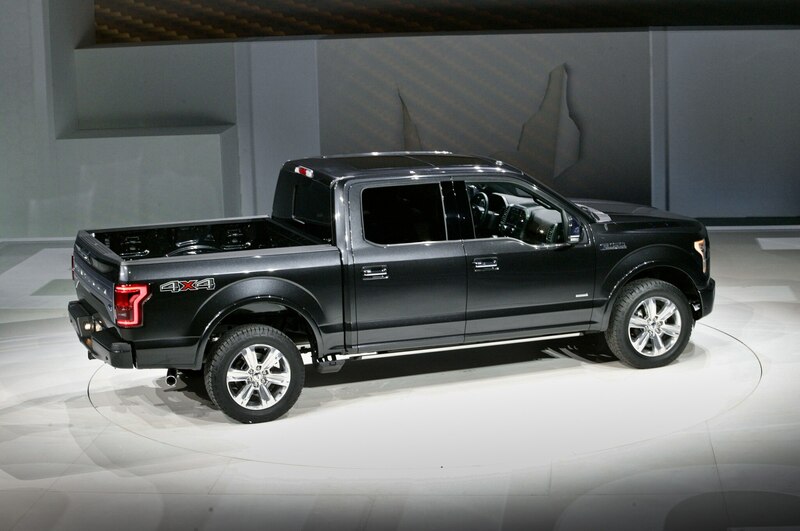 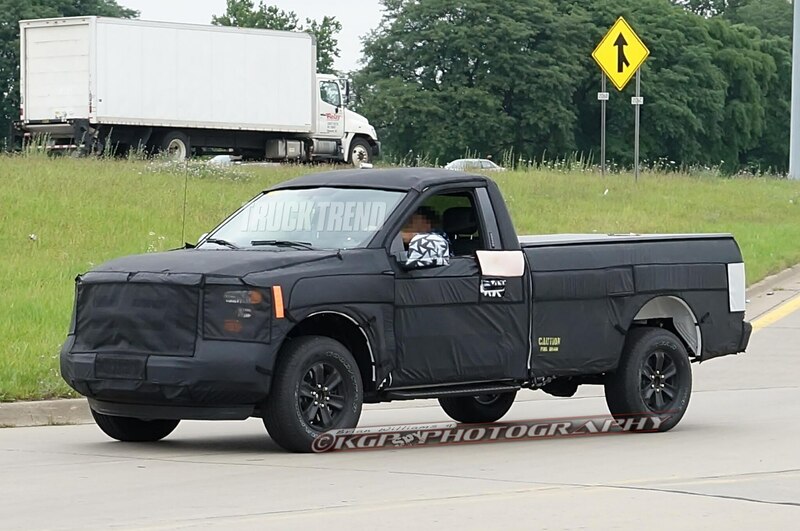 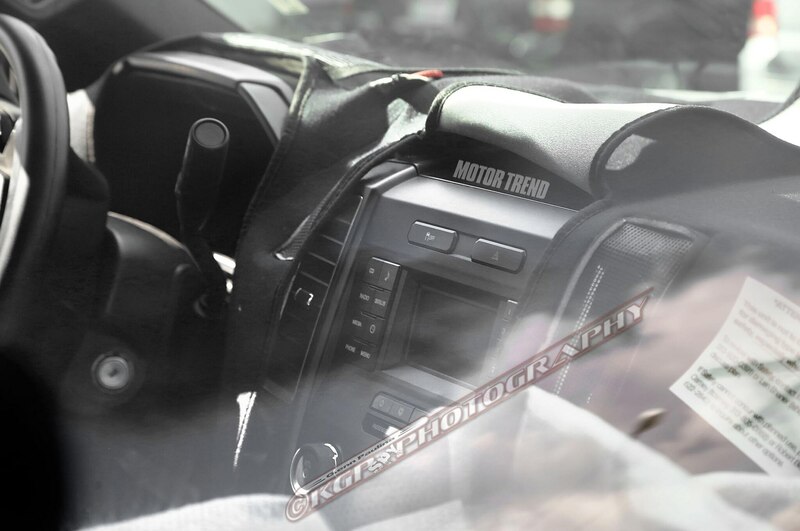 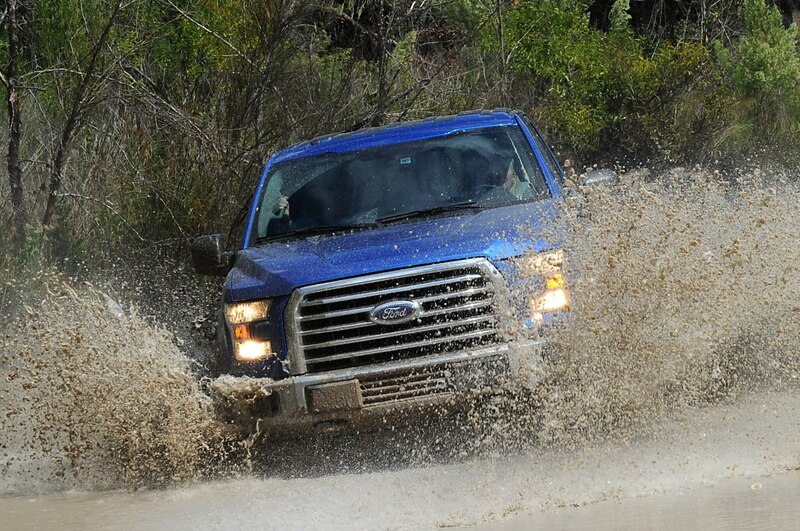 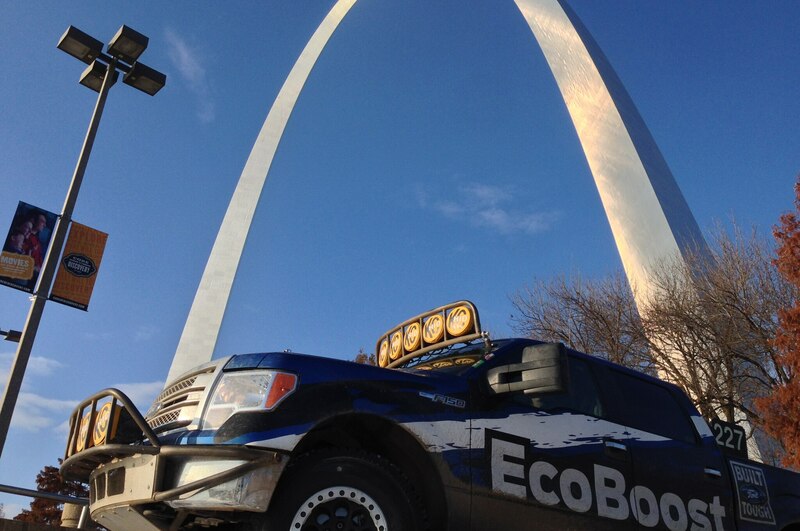 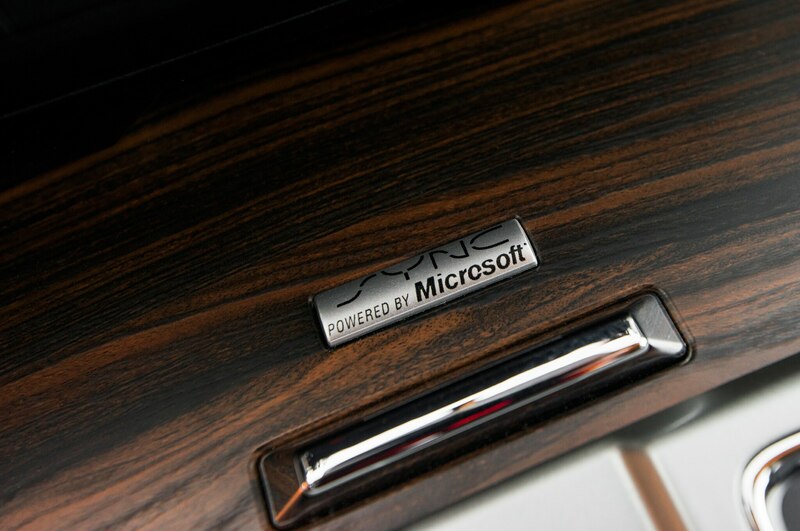 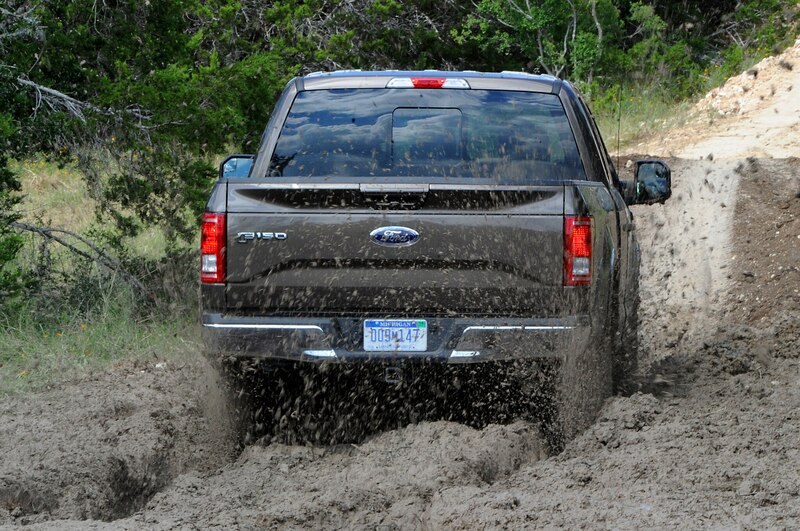 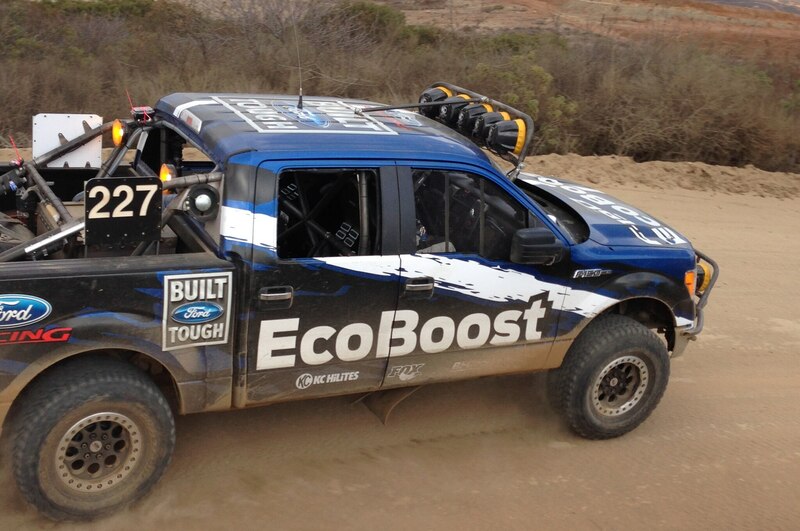 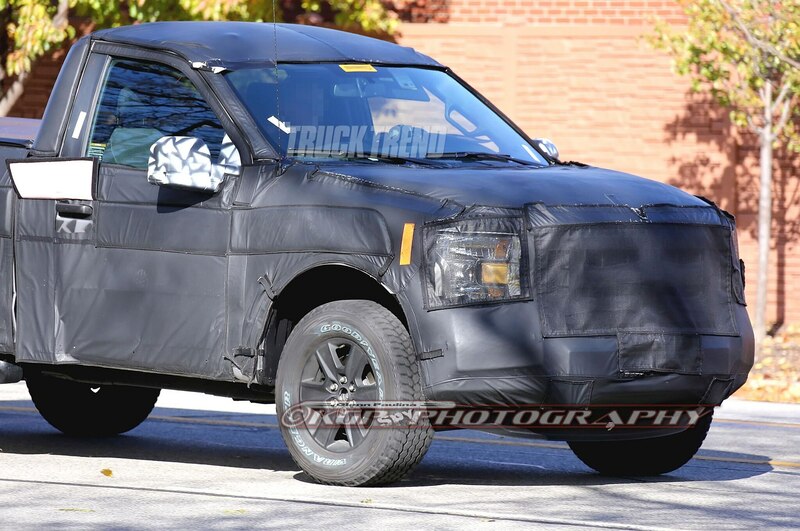 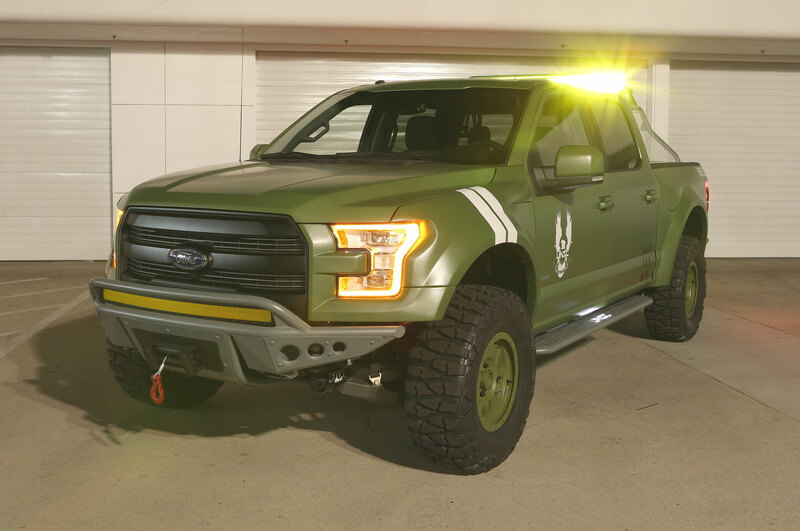 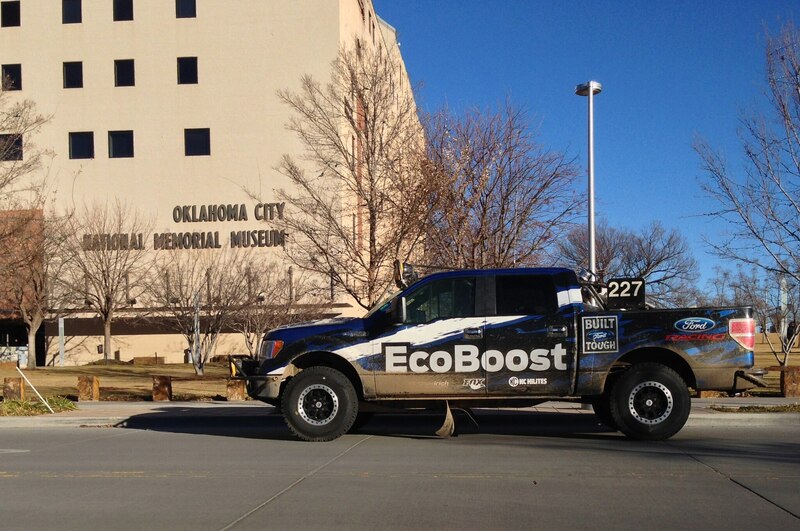 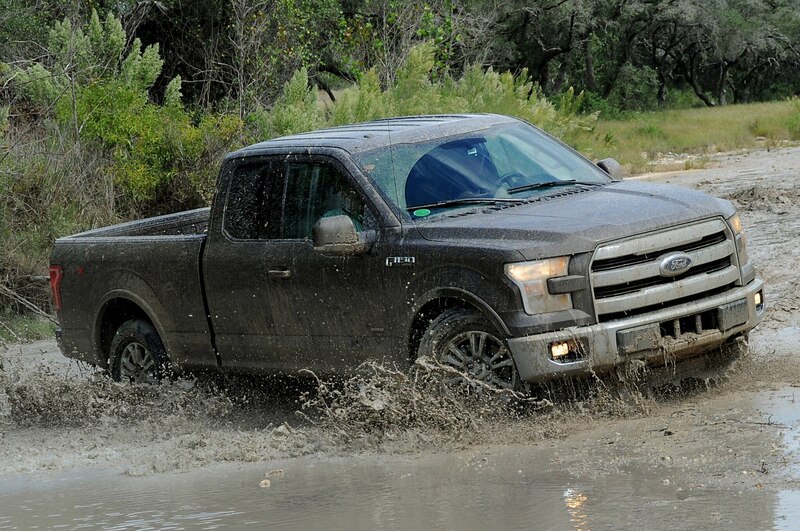 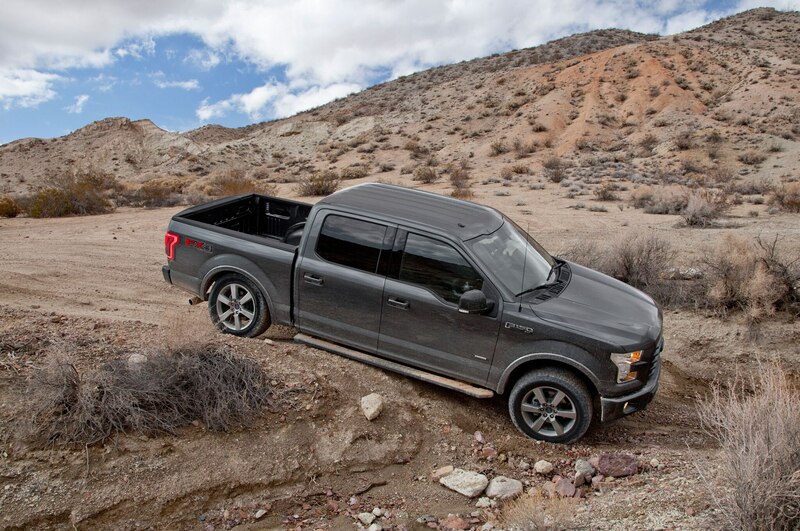 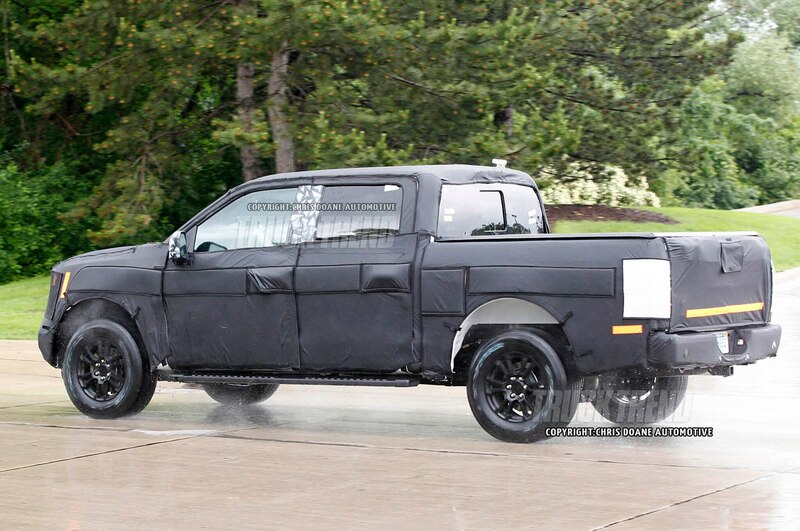 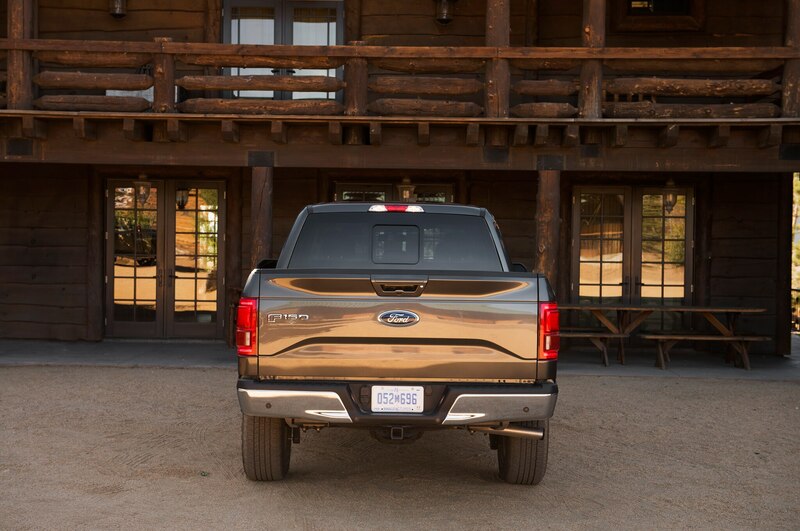 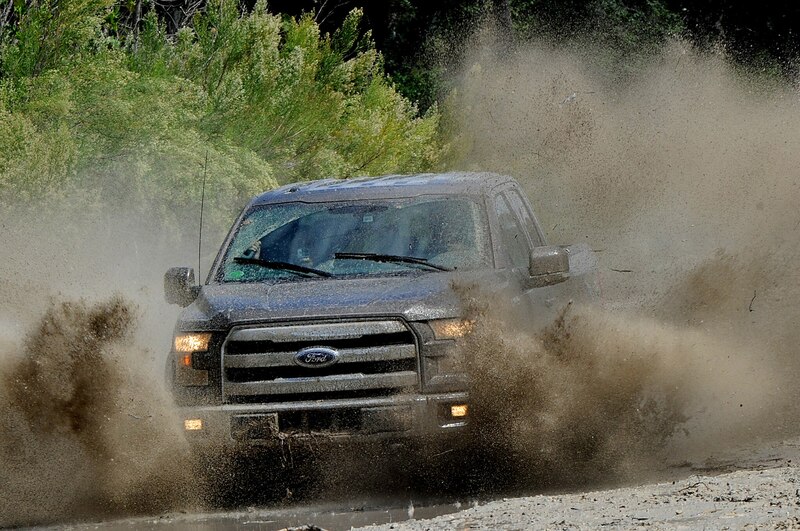 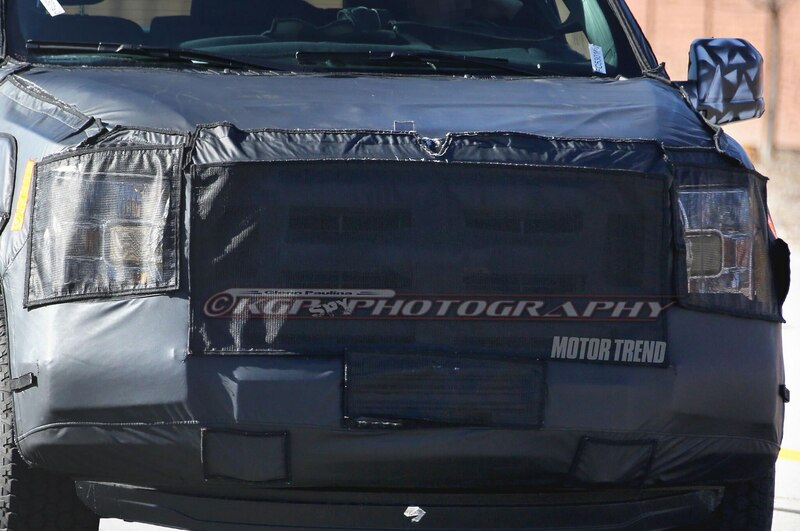 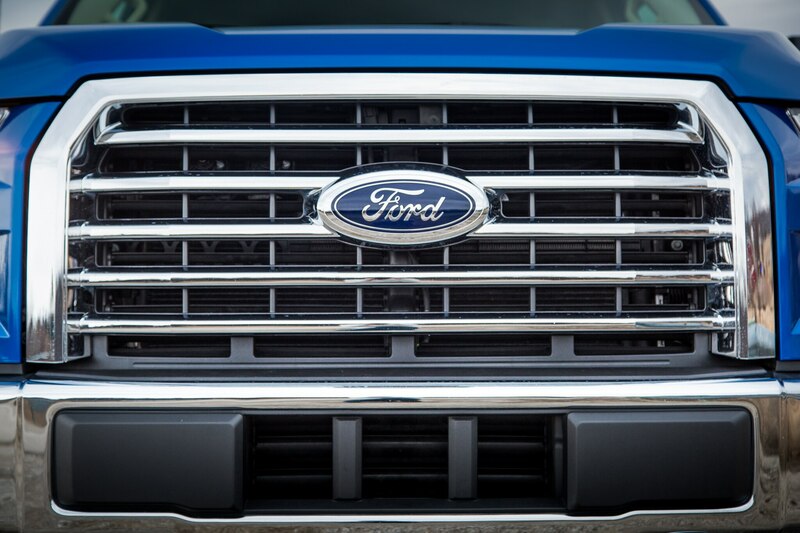 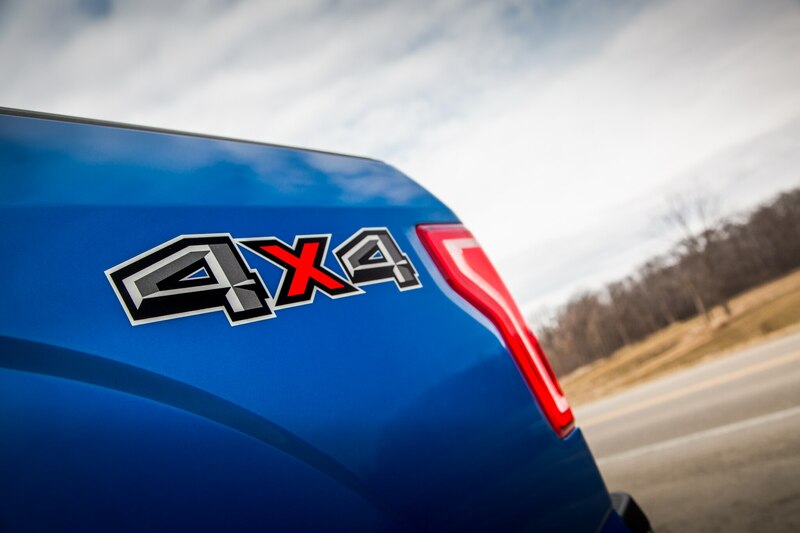 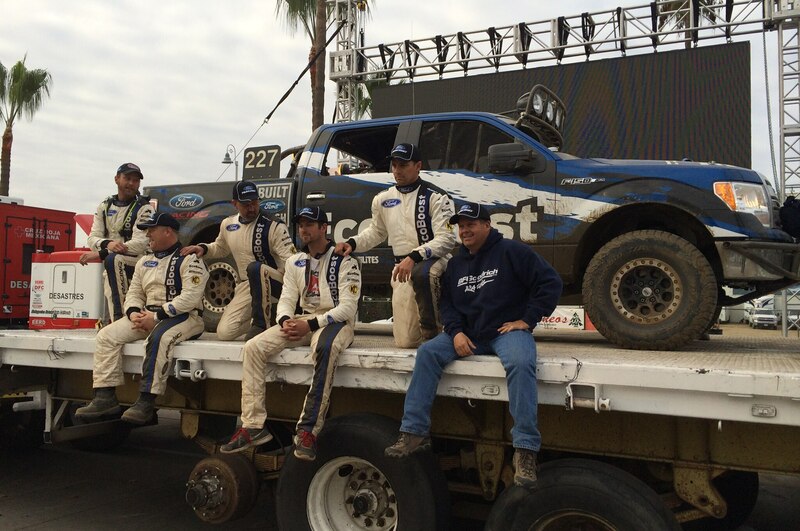 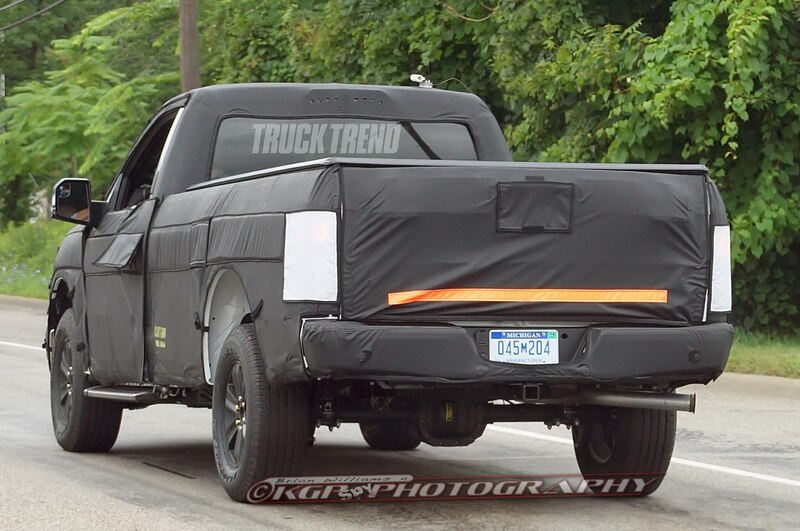 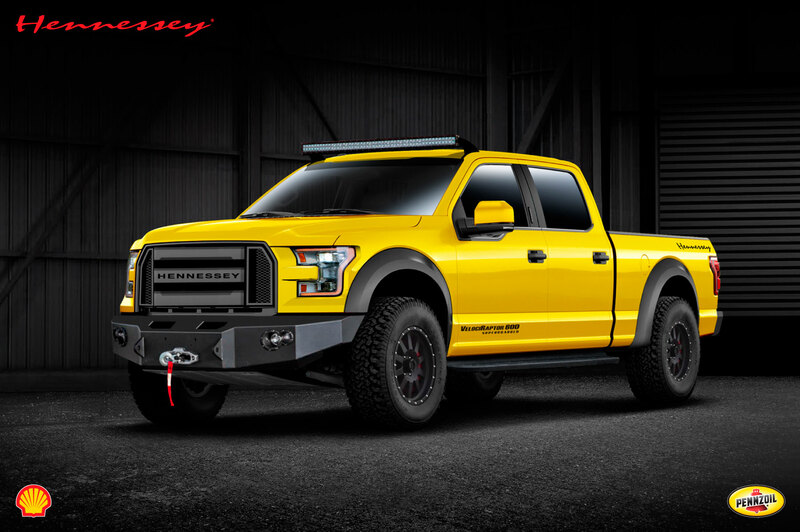 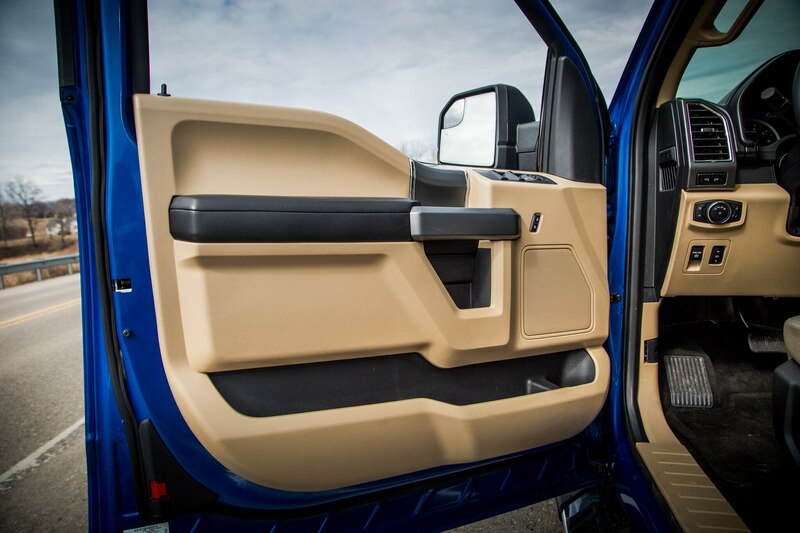 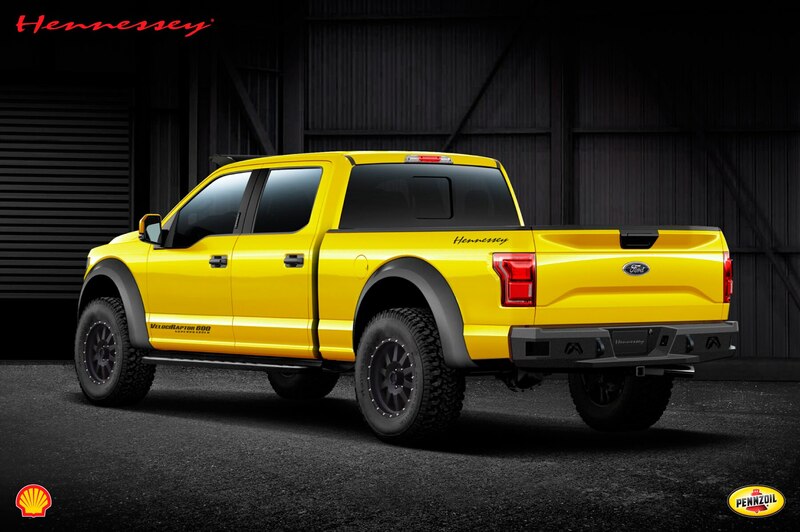 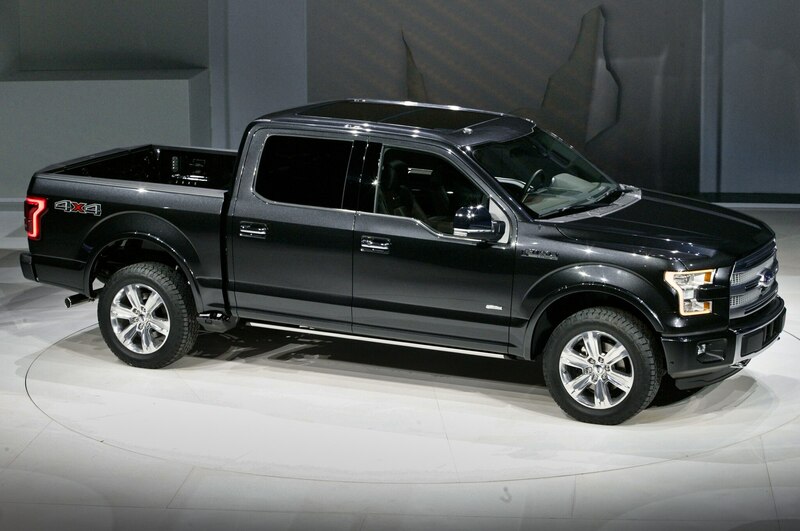 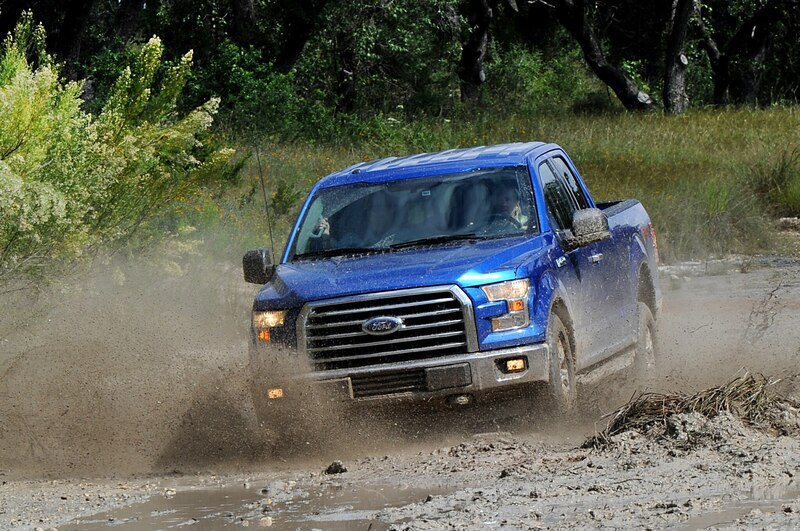 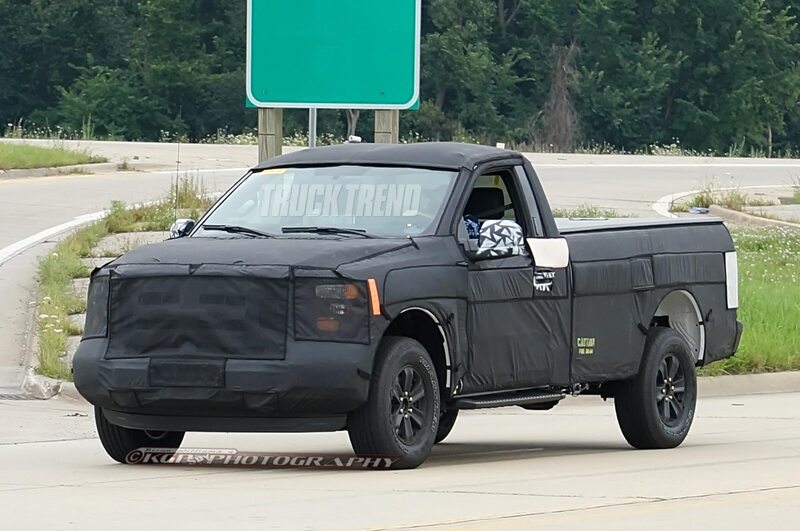 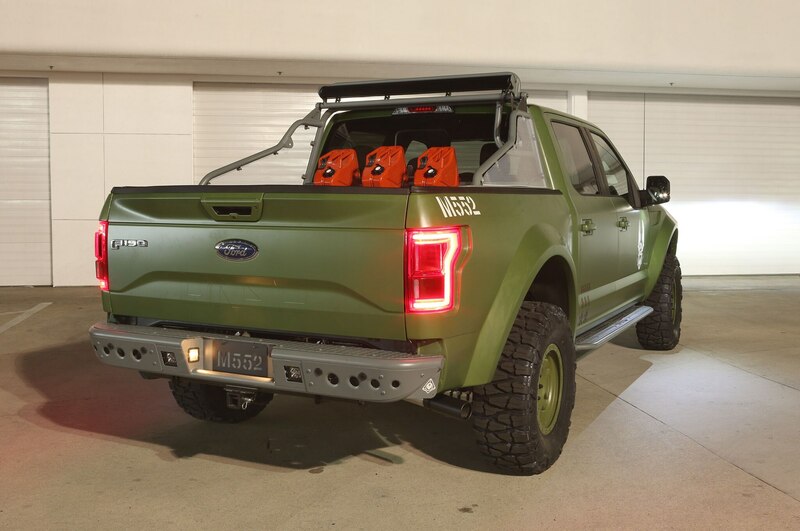 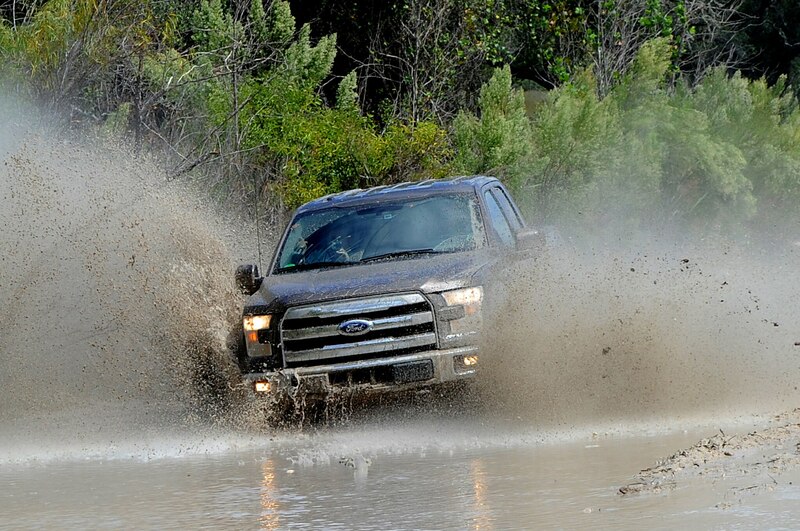 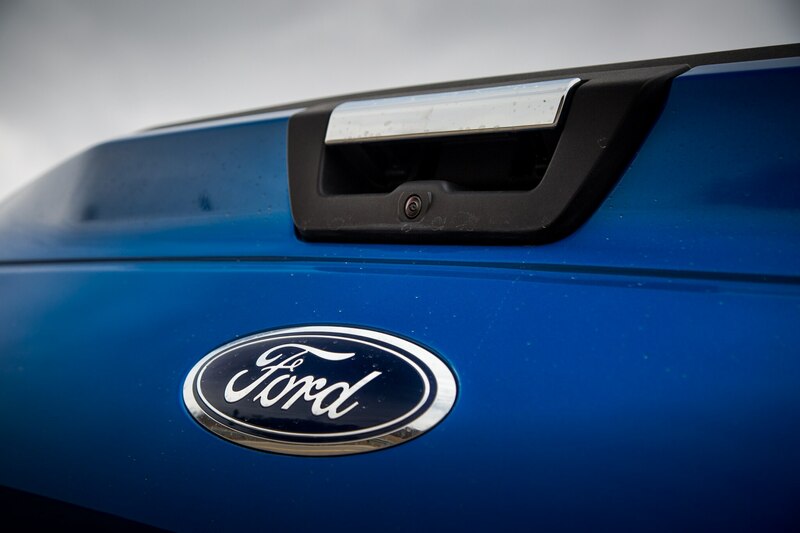 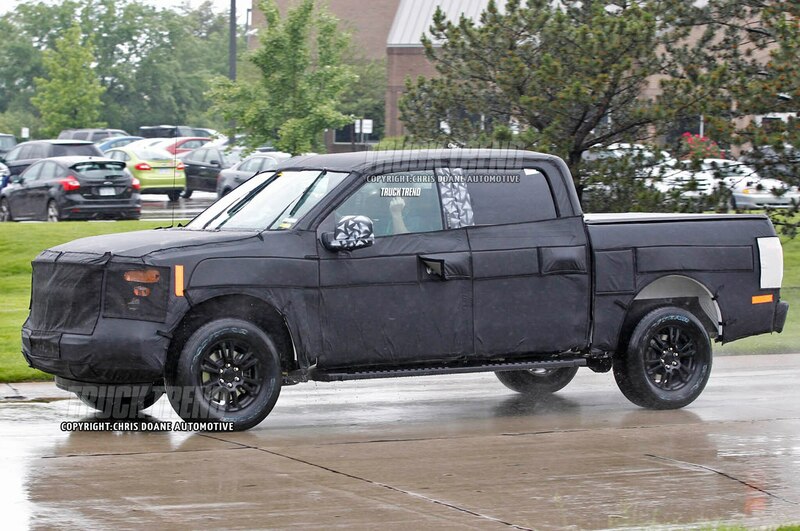 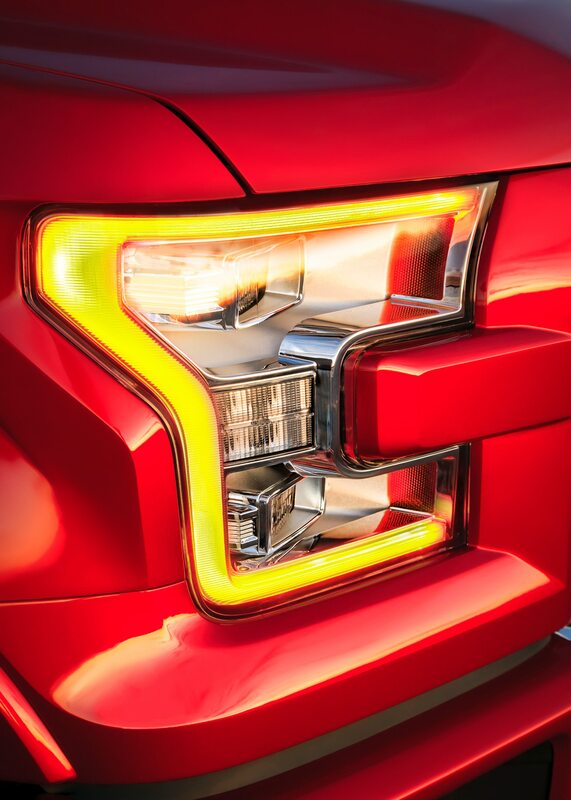 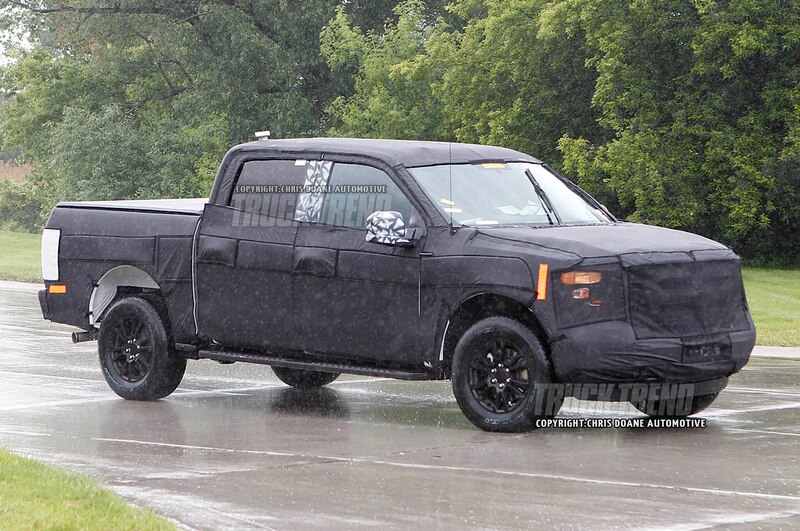 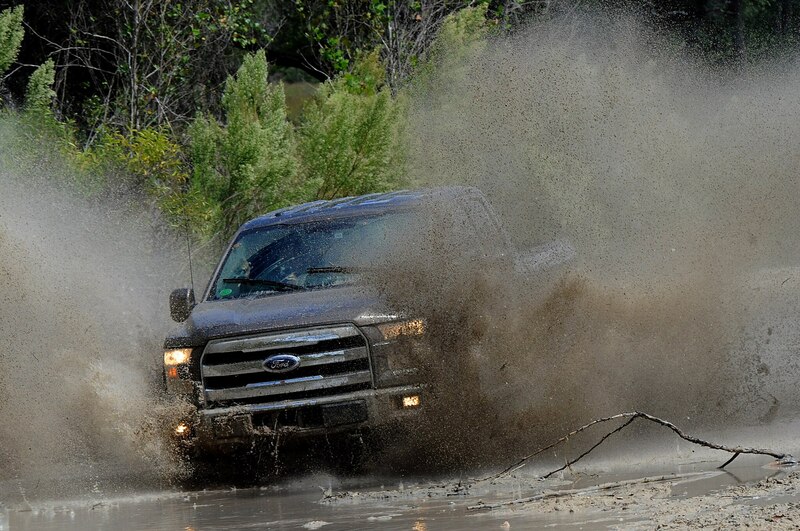 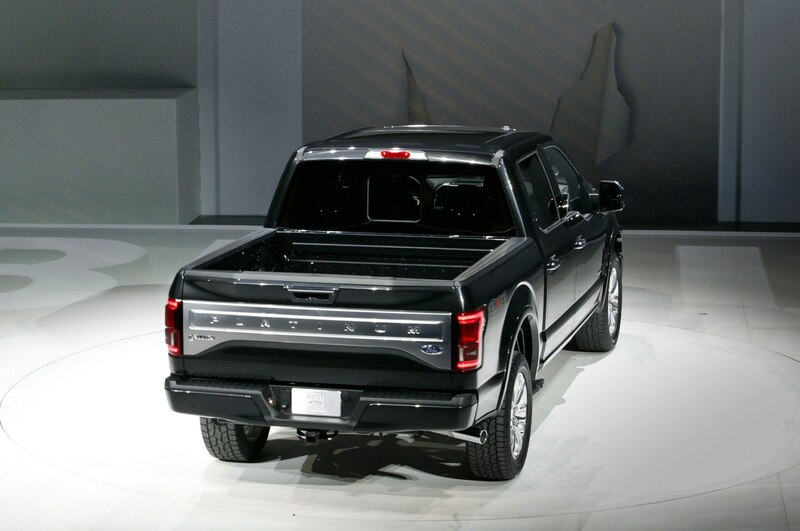 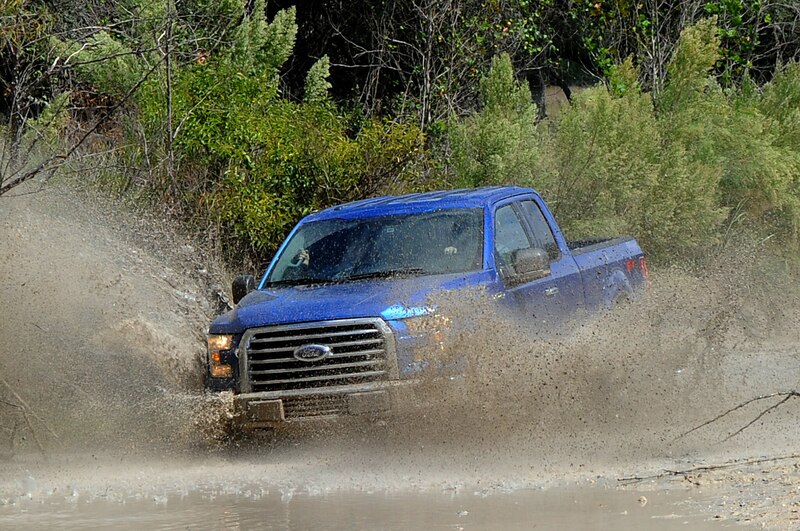 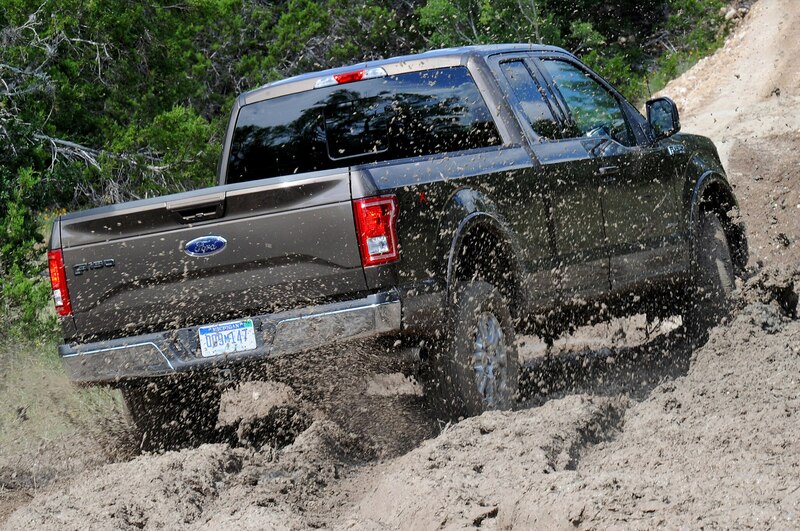 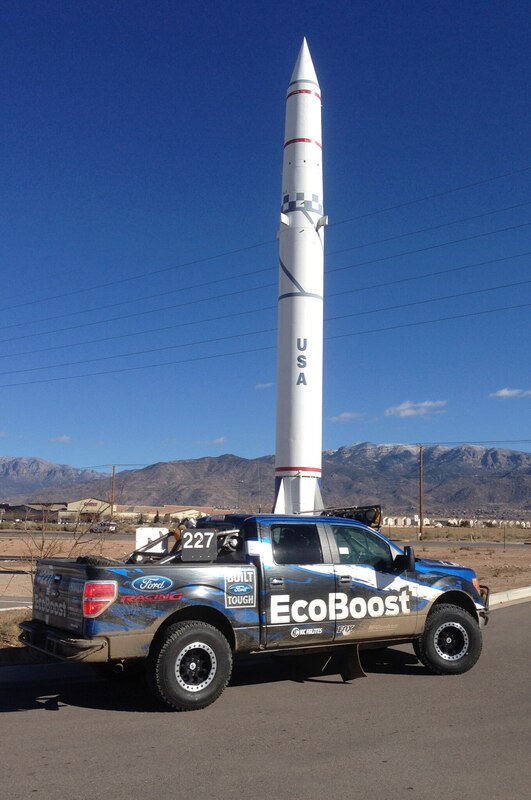 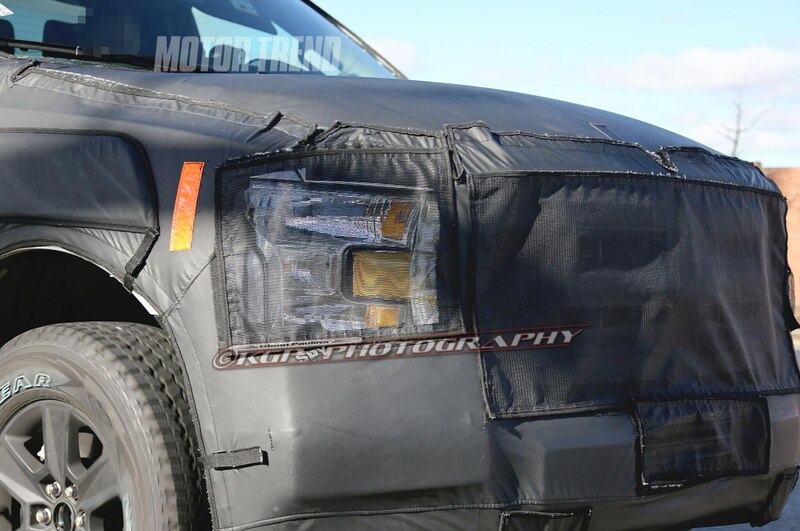 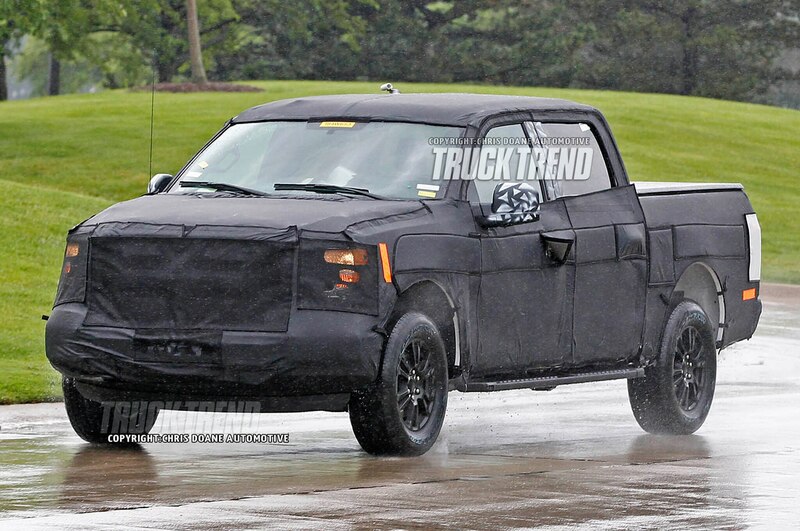 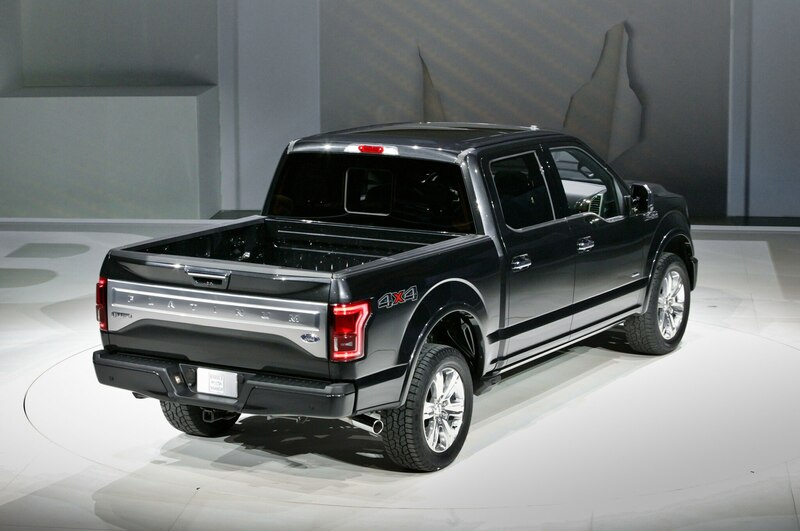 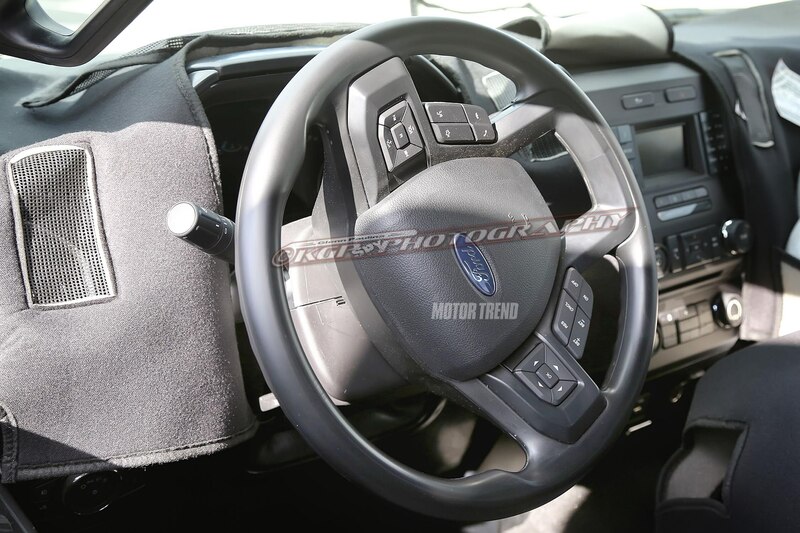 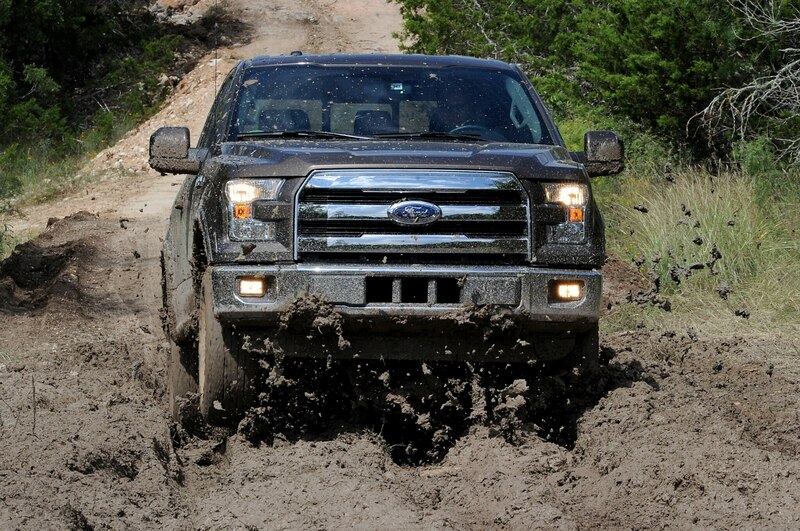 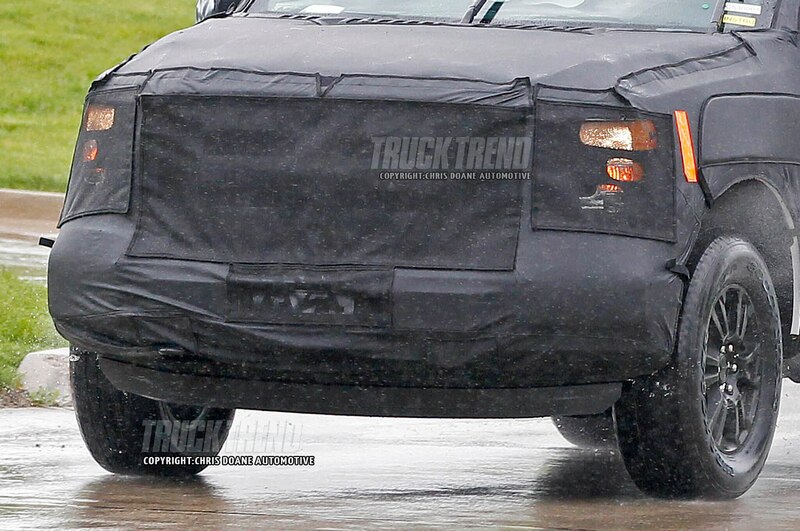 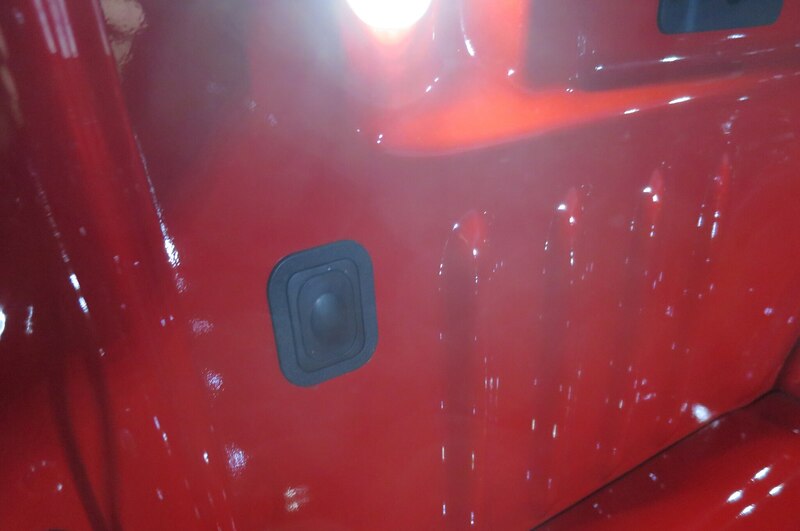 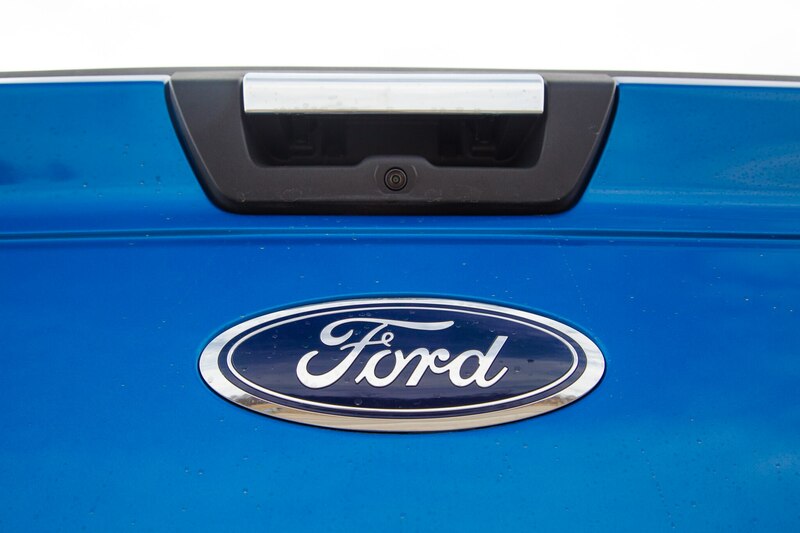 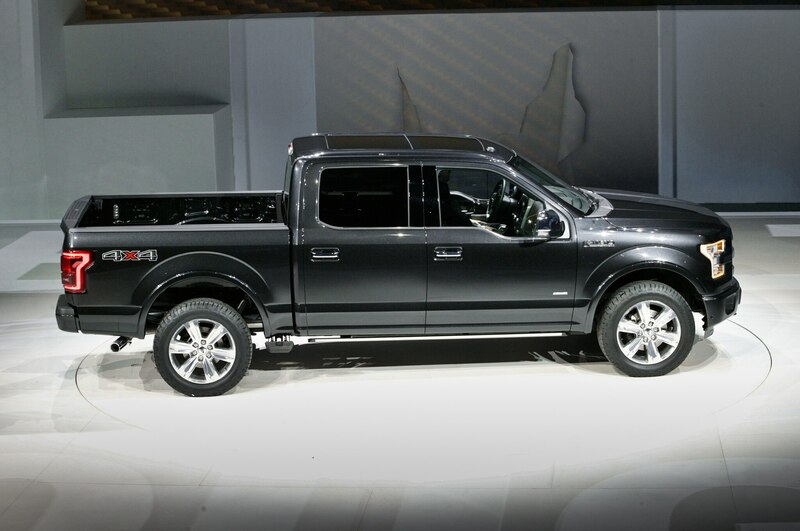 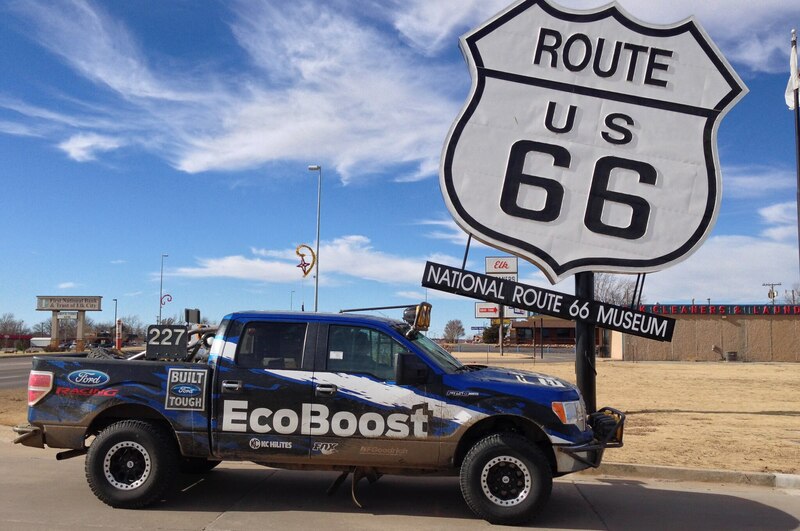 What if Ford revolutionized the great American pickup truck and nobody noticed? 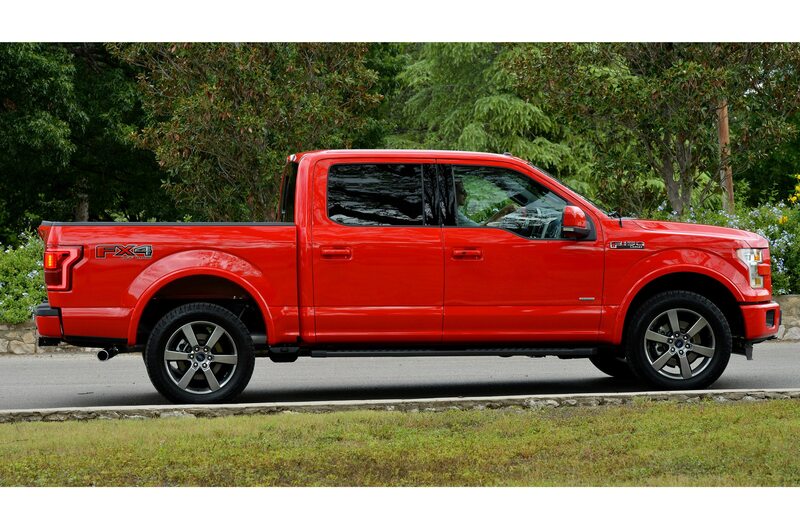 After our first experience with the equally revolutionary (for a big truck) 2.7-liter EcoBoost V-6 option in an aluminum 2015 Ford F-150 XLT Supercab 4×4, we wonder whether its maker went too far trying to make the truck look, feel, and perform too much like its steel predecessor. 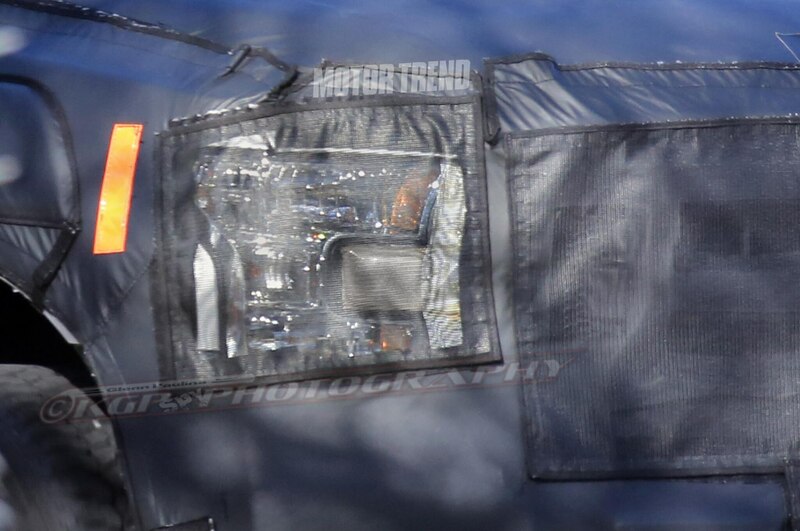 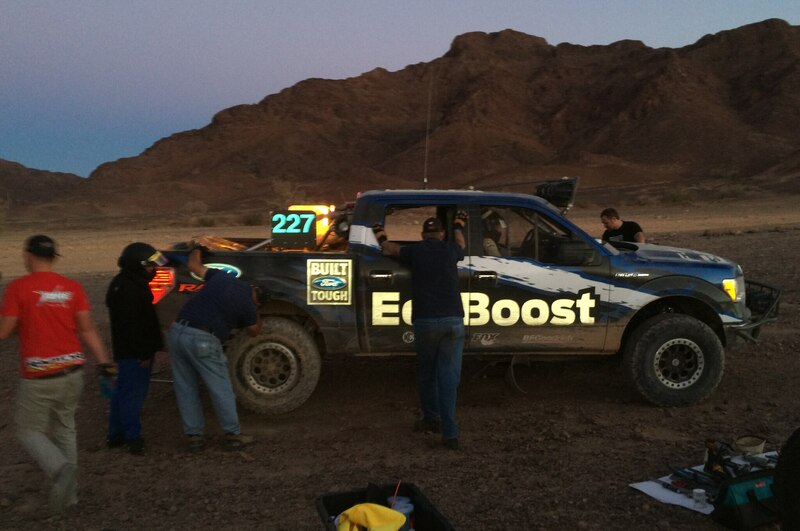 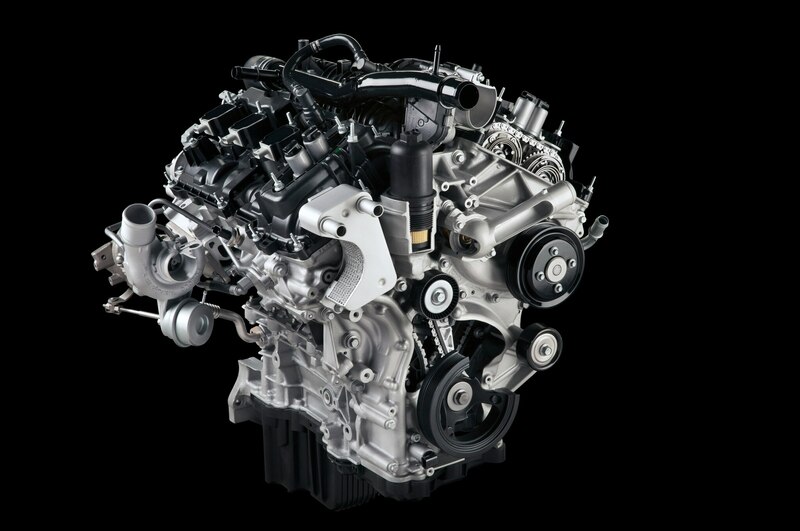 At least the smaller turbo engine is familiar in a good way; it performs like a work truck V-8. 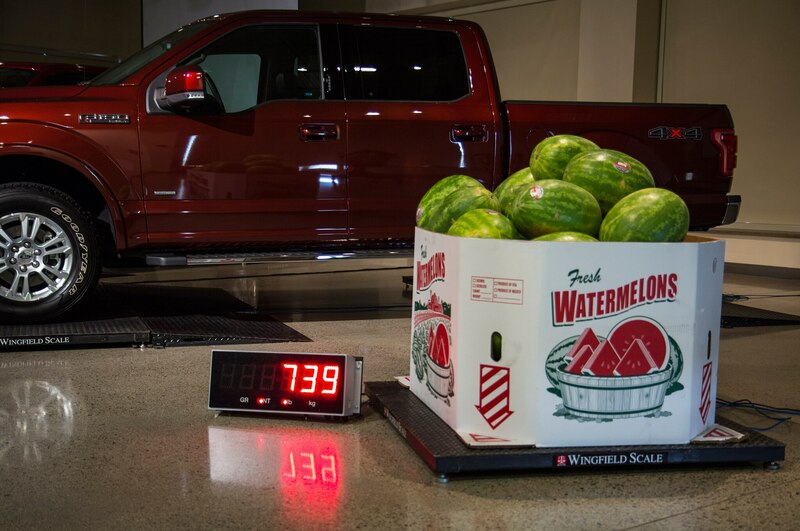 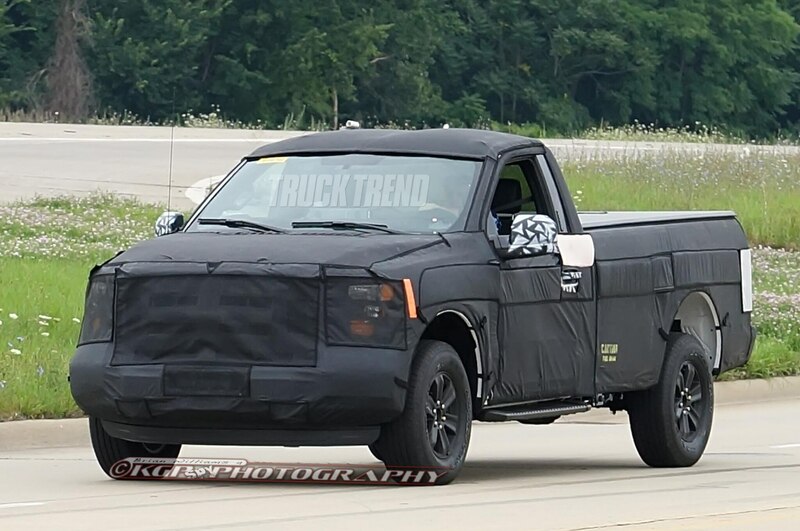 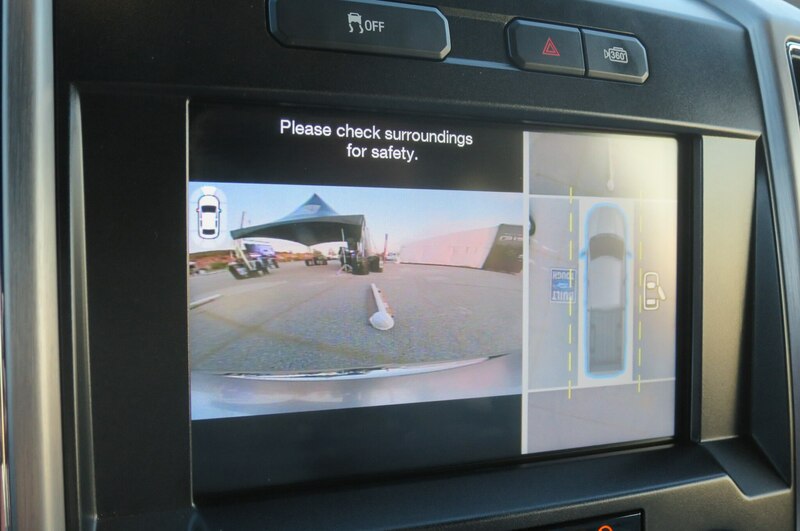 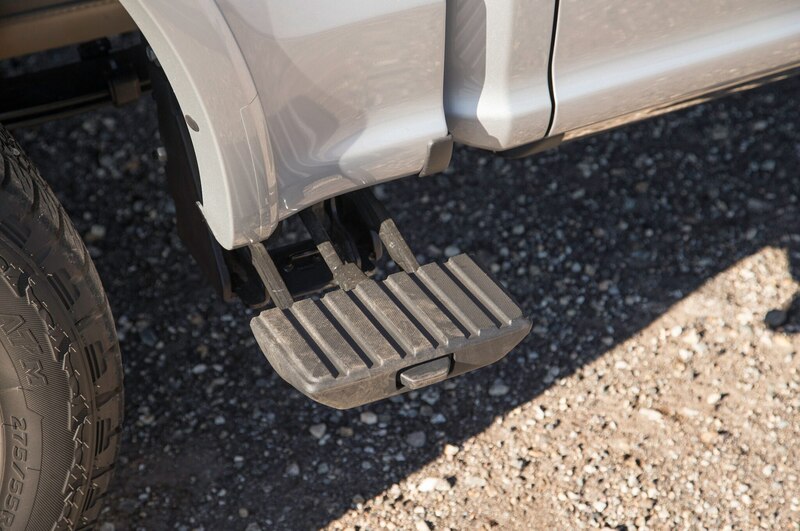 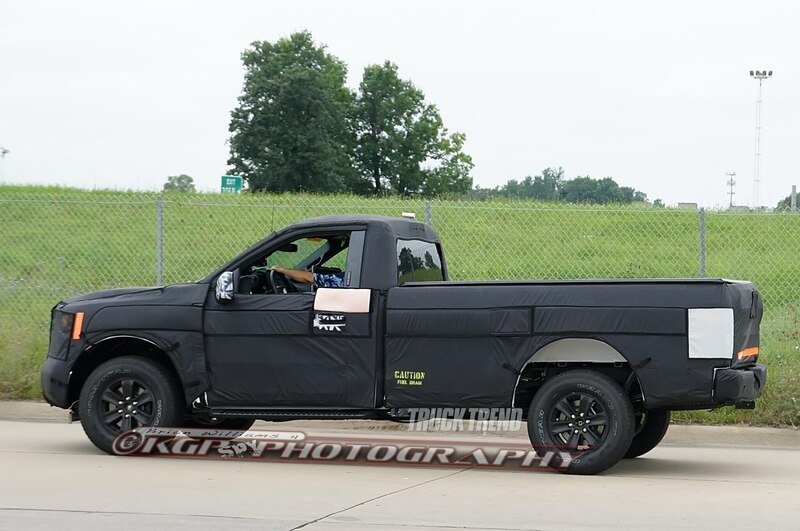 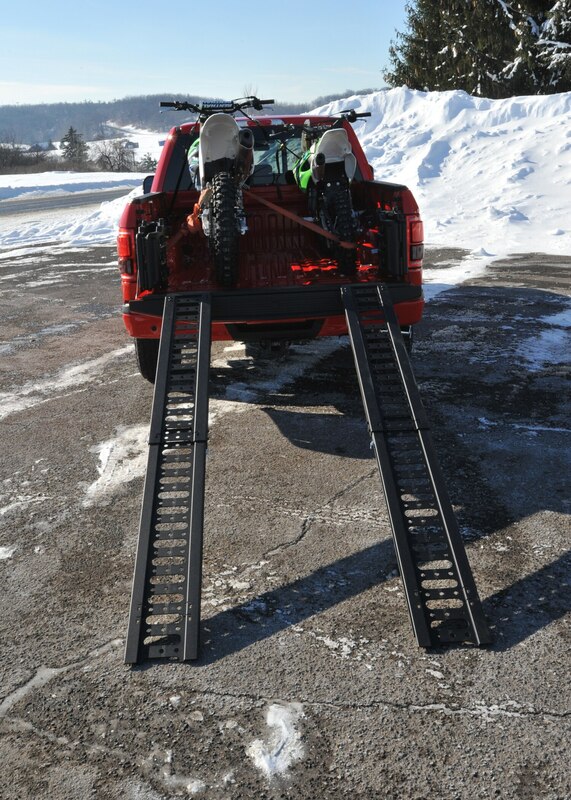 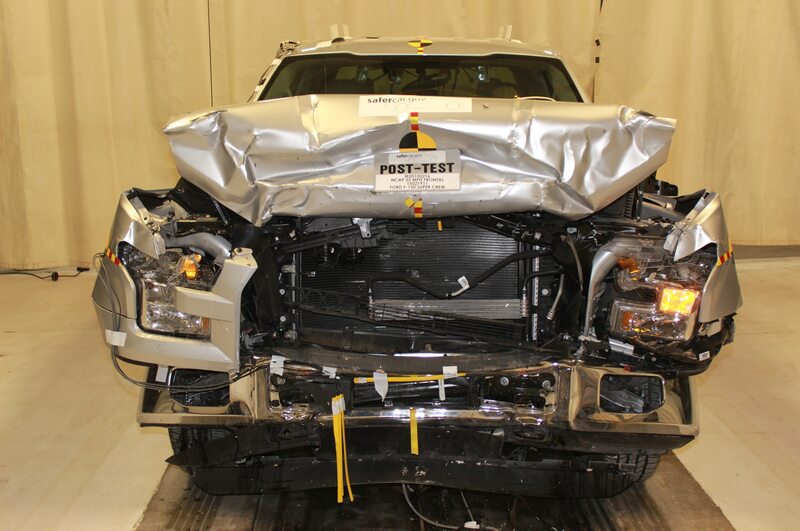 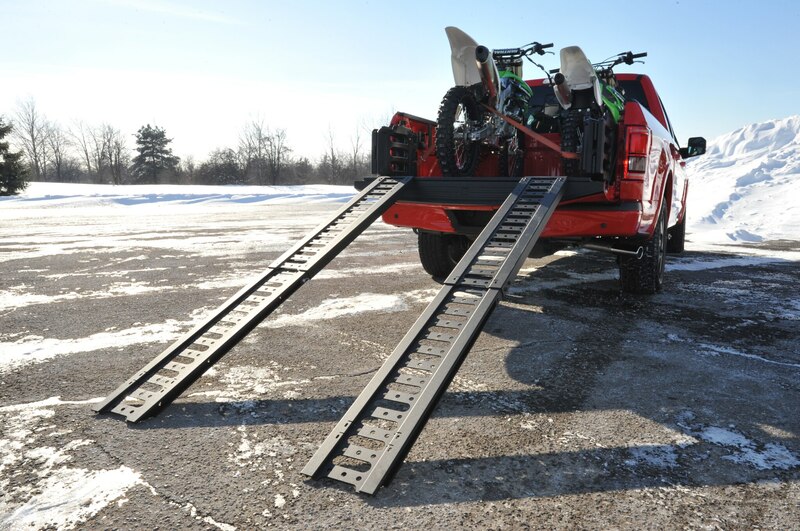 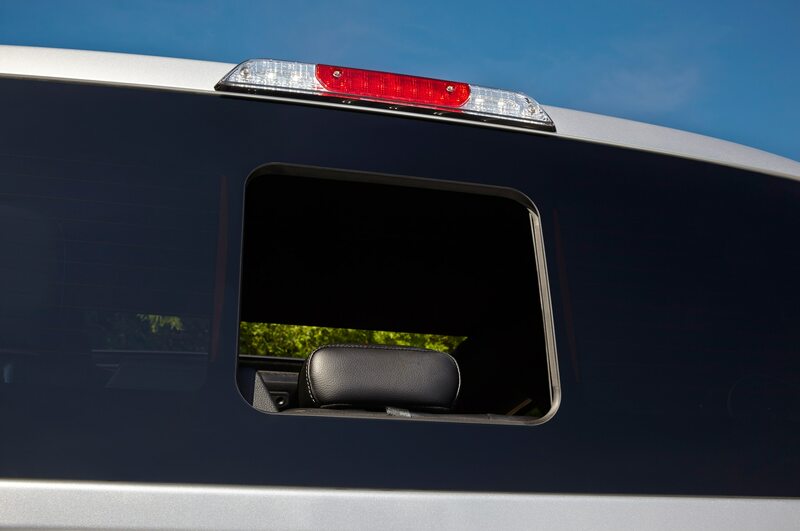 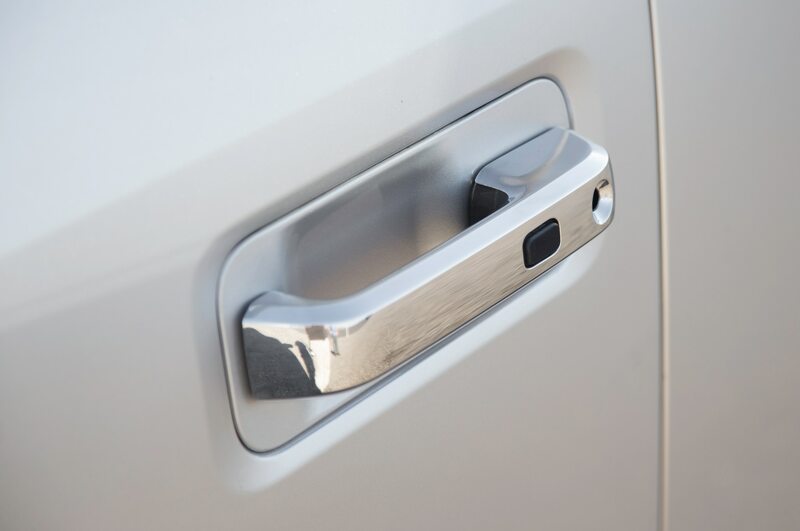 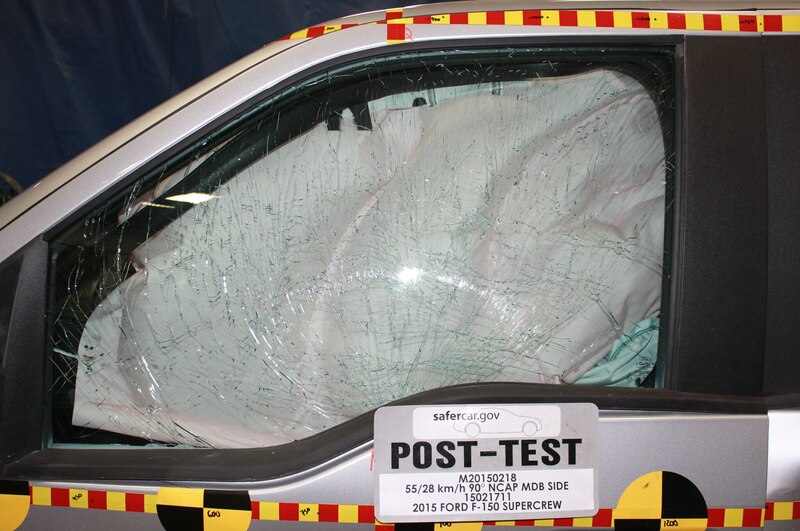 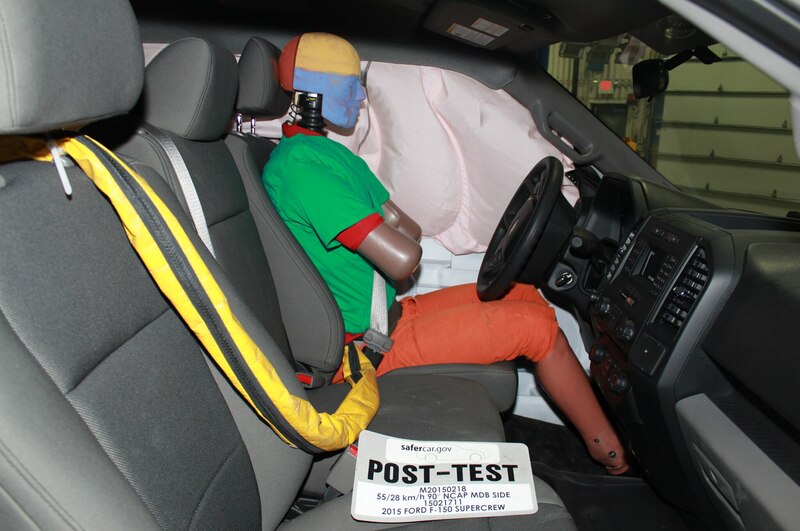 And taking up to 700 pounds out of the big truck (traditionally, it has been a couple hundred pounds heavier than similarly equipped Chevrolet/GMC and Ram rivals) has improved handling, braking and maneuverability. 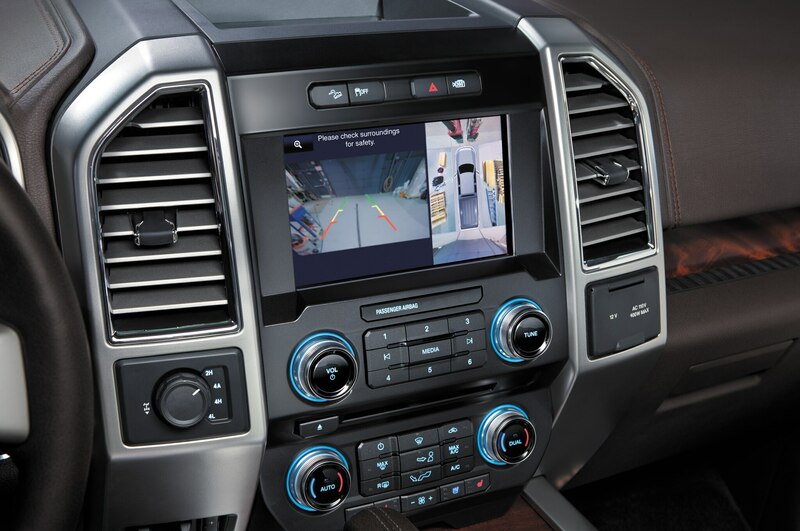 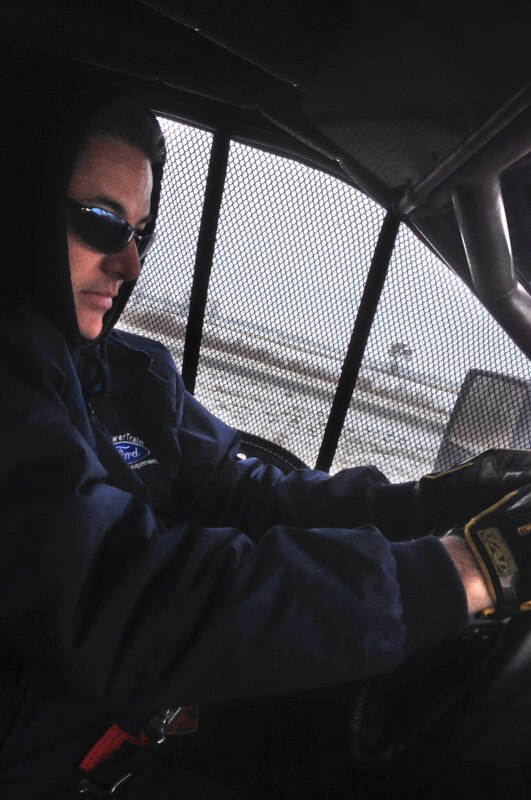 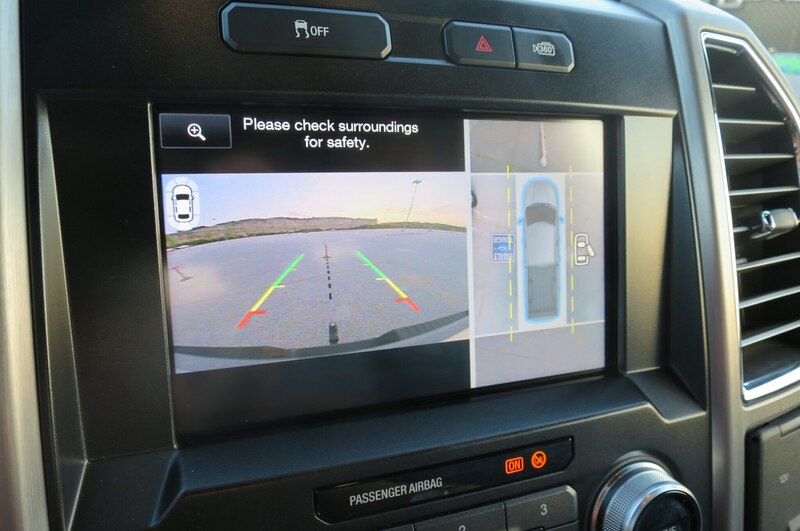 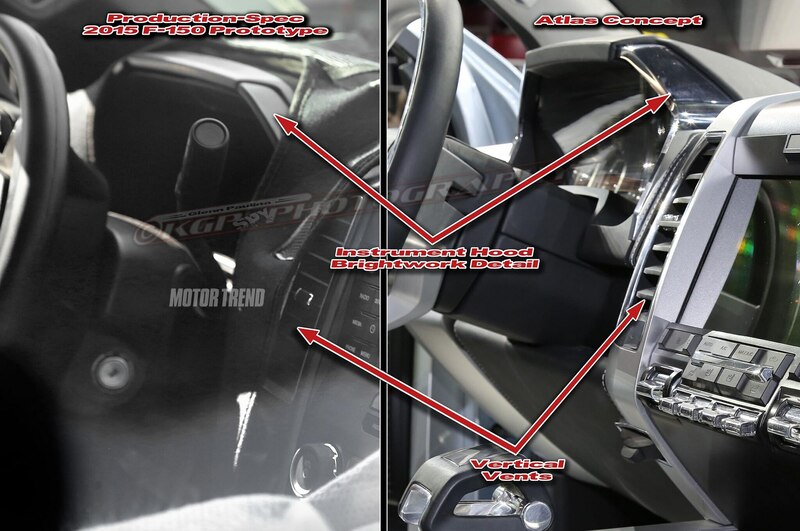 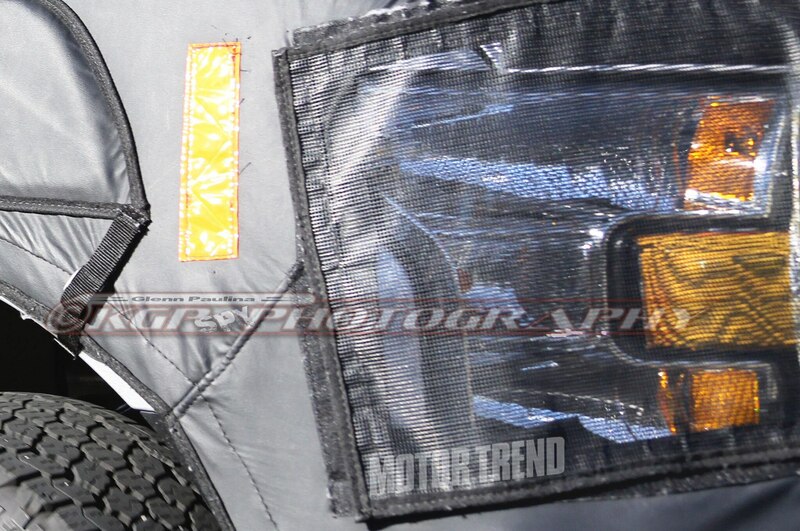 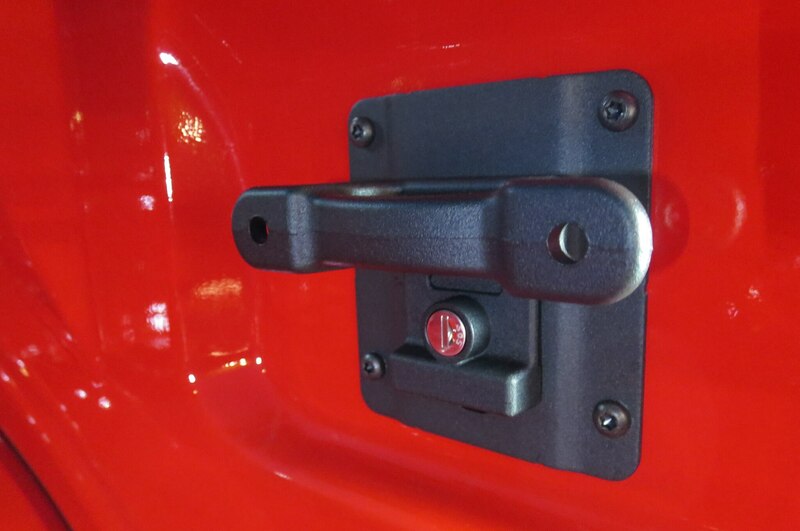 “It changes direction, stops, and accelerates in a livelier manner than the last truck,” Holmes says. 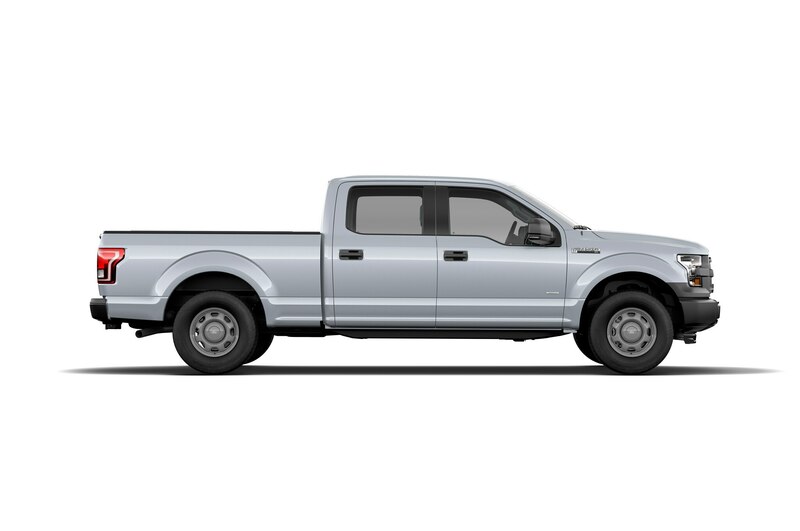 Save for hauling furniture a mile between two houses, we drove the Ford pickup unladen, as most suburban cowboys would. 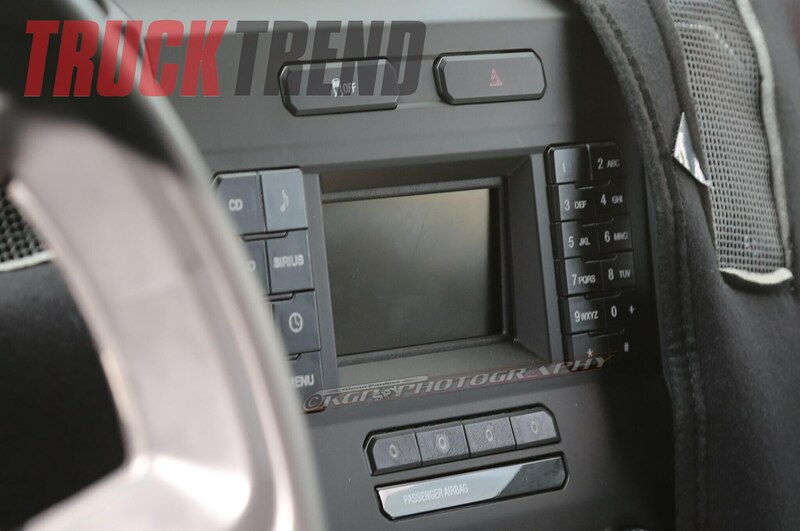 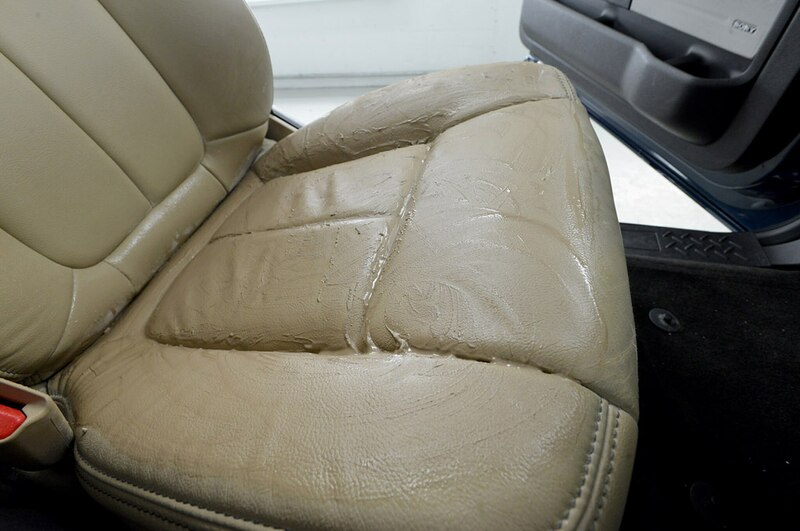 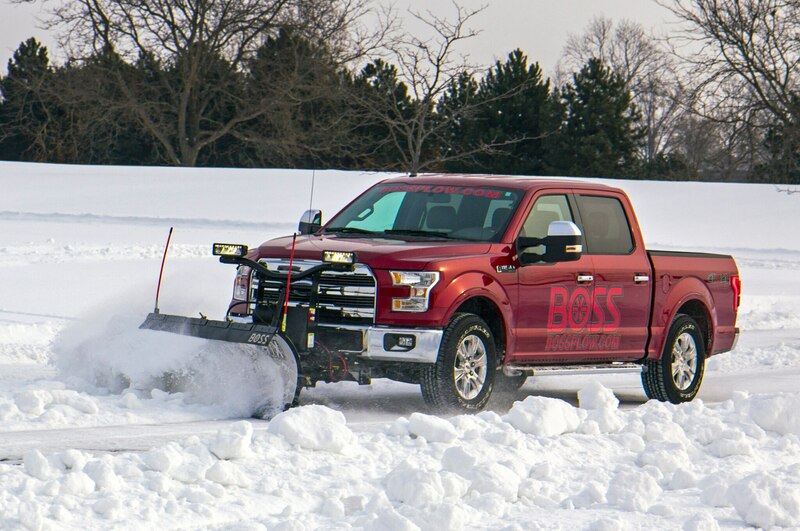 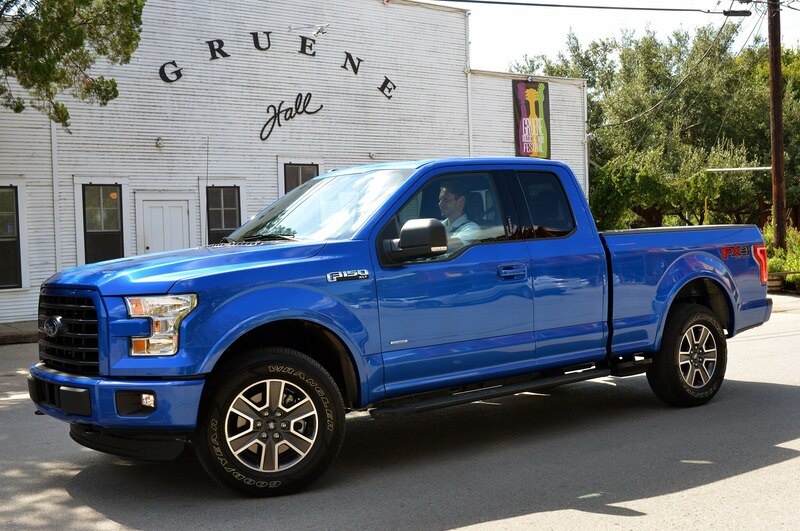 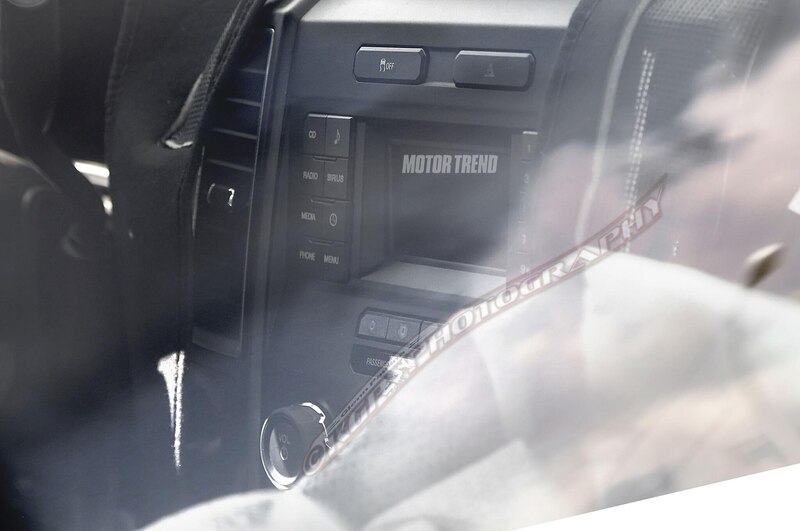 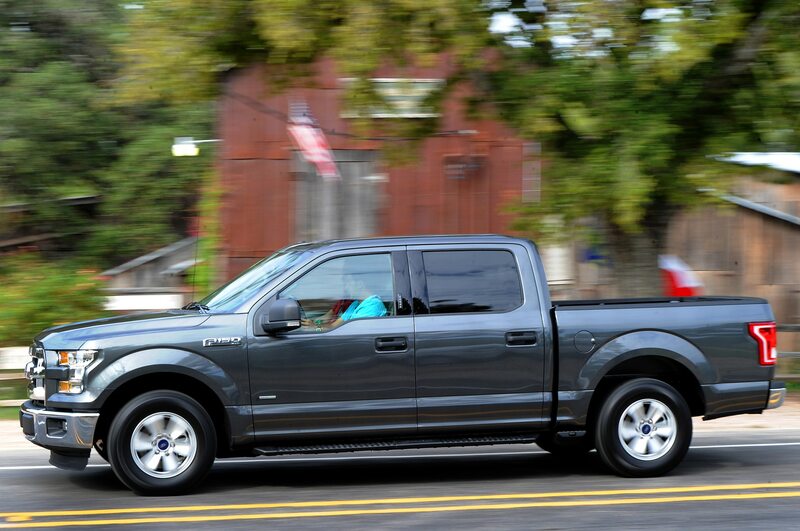 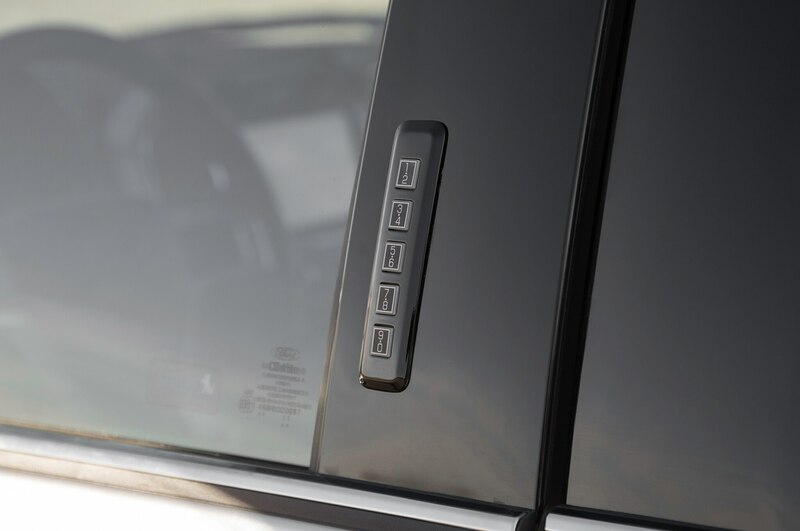 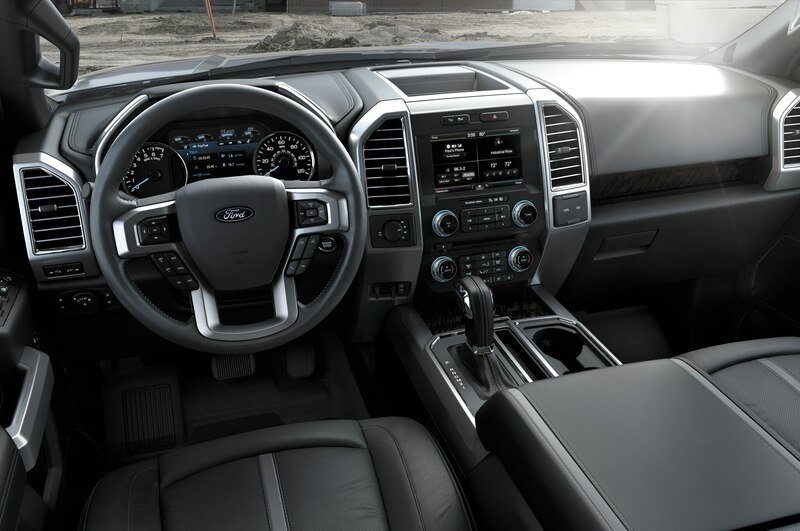 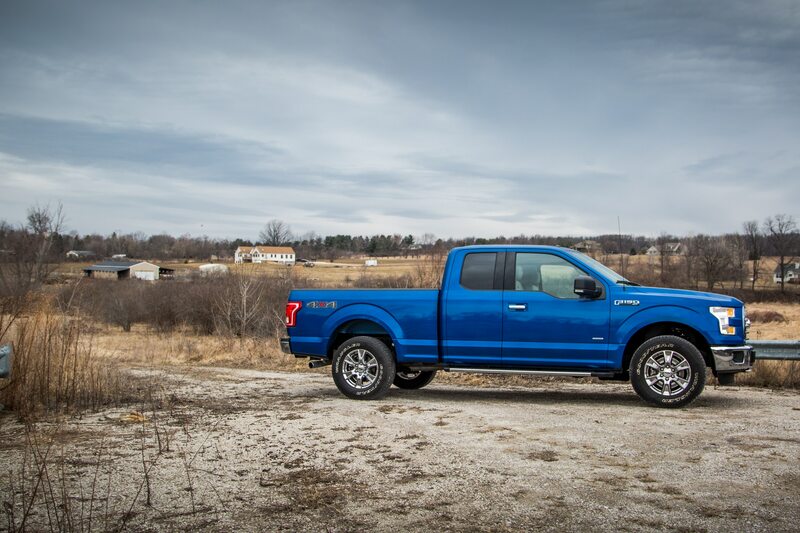 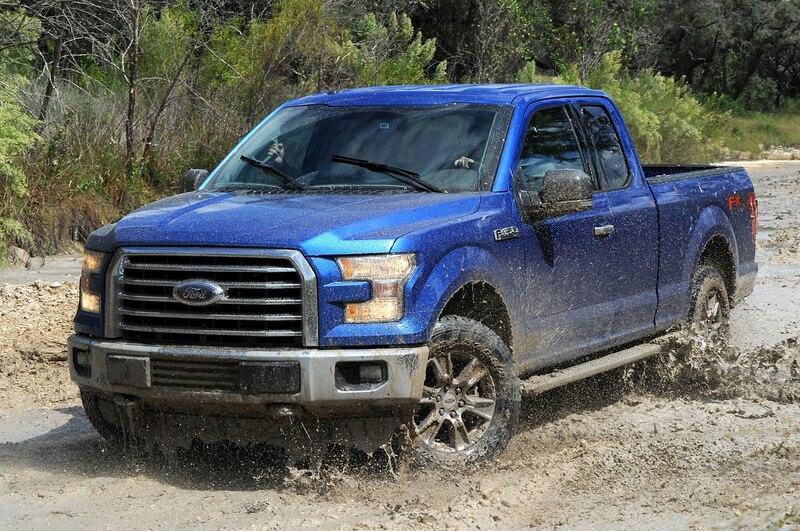 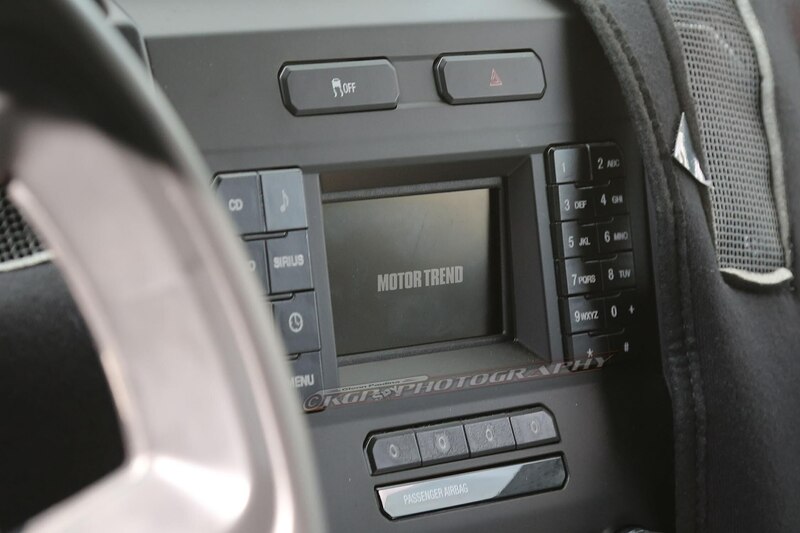 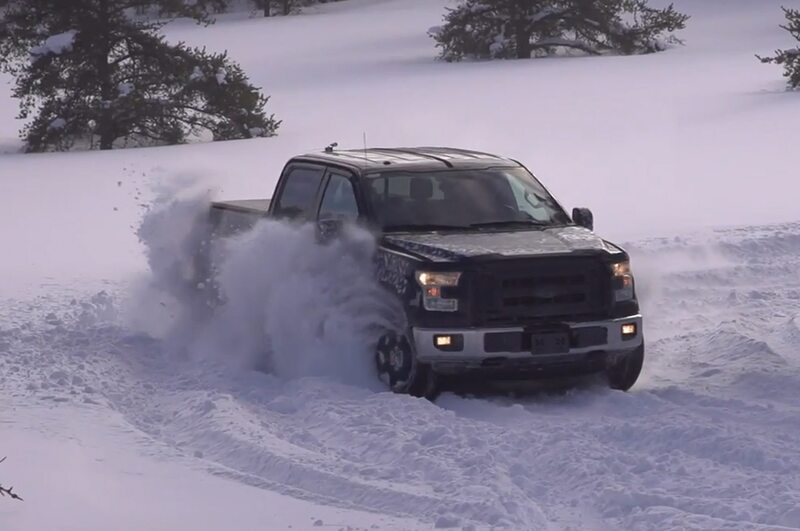 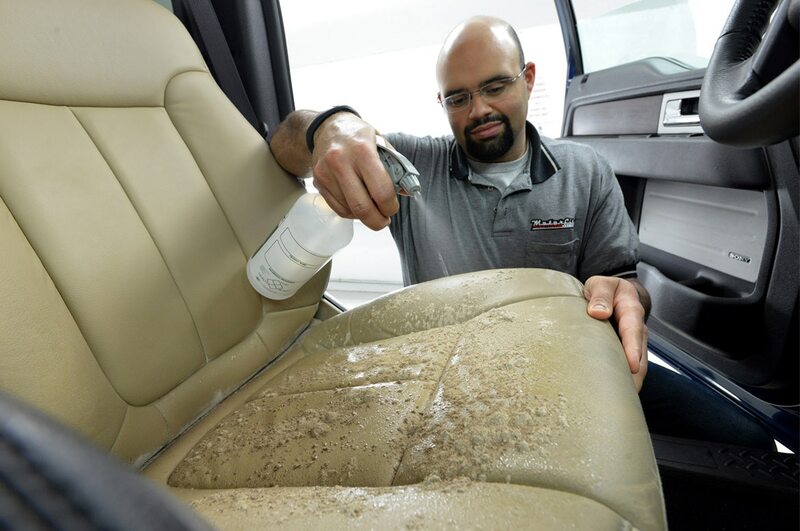 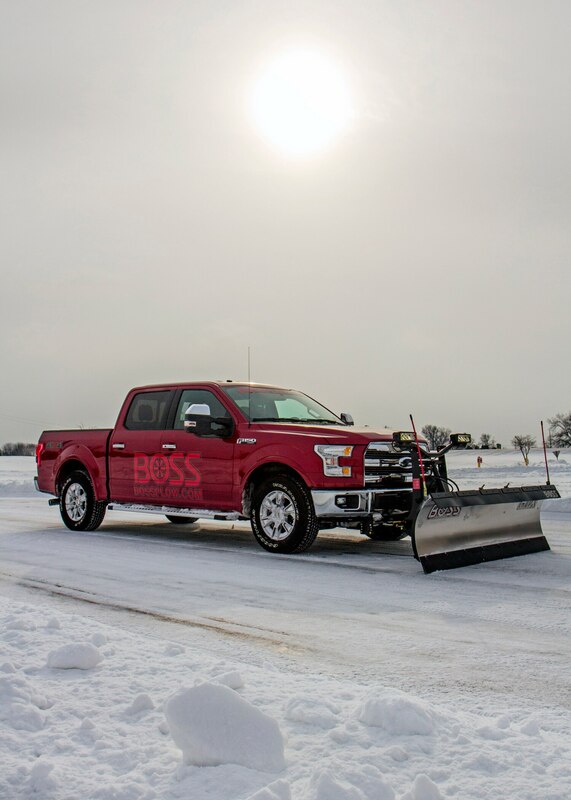 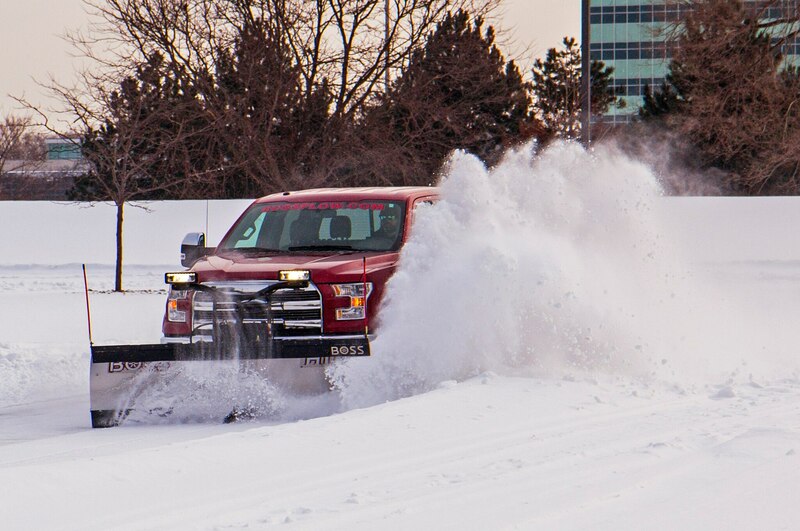 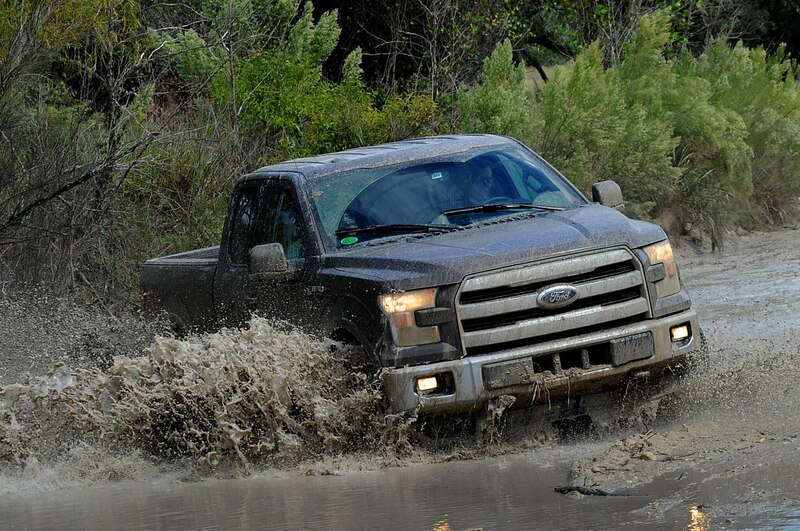 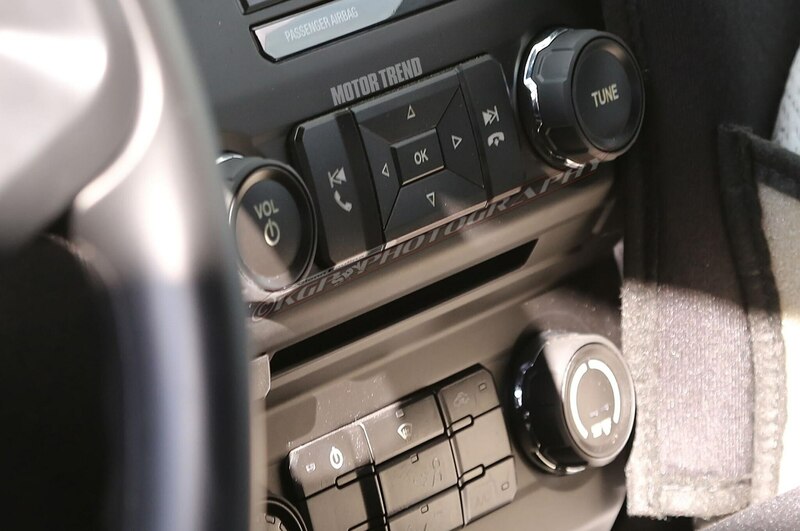 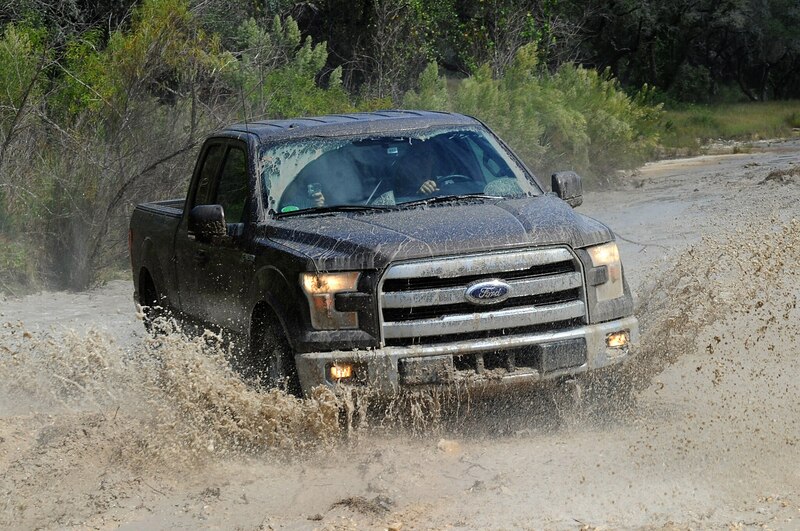 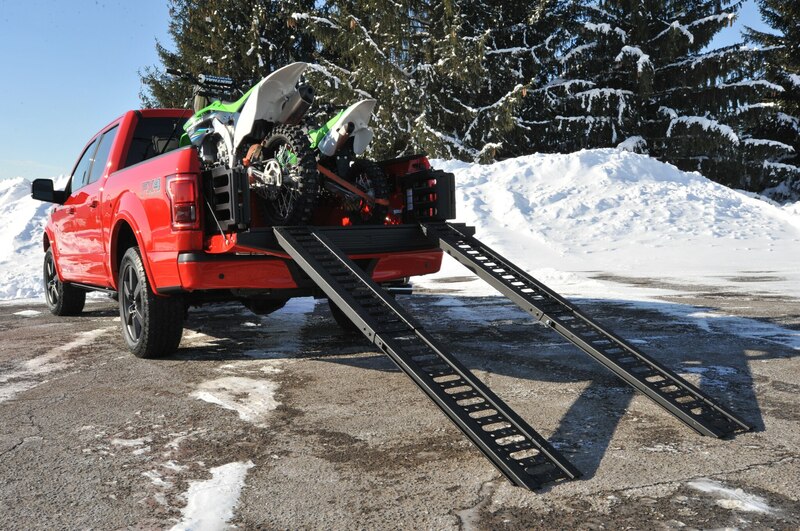 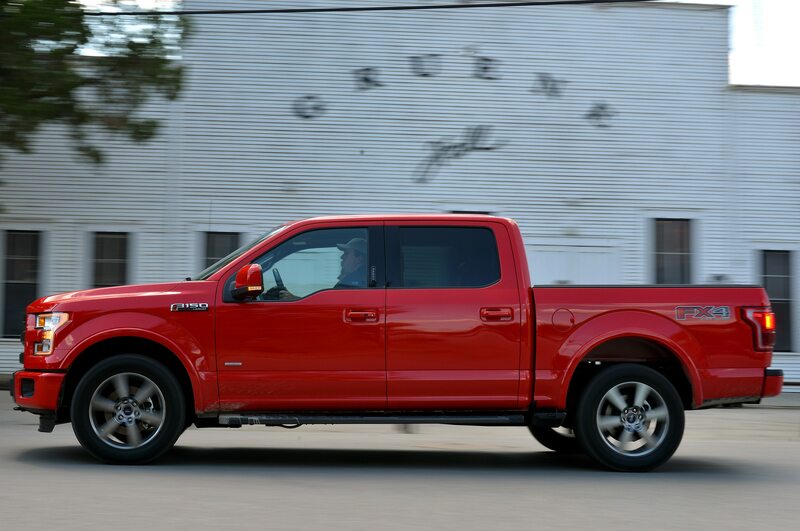 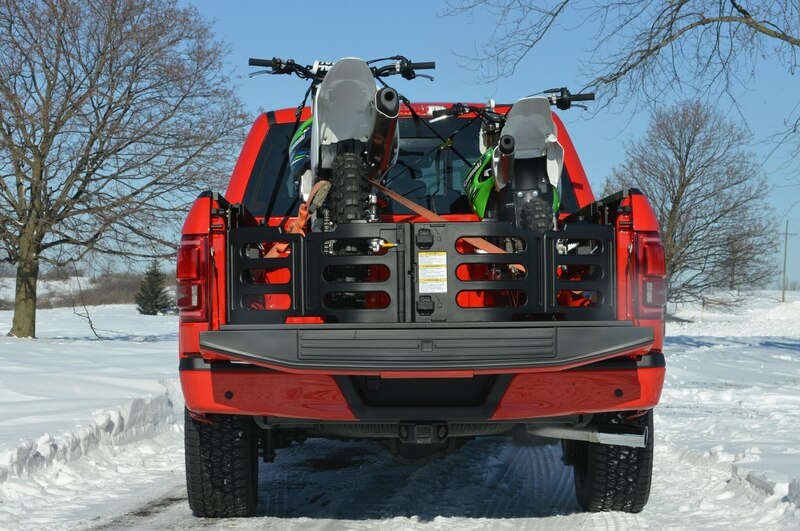 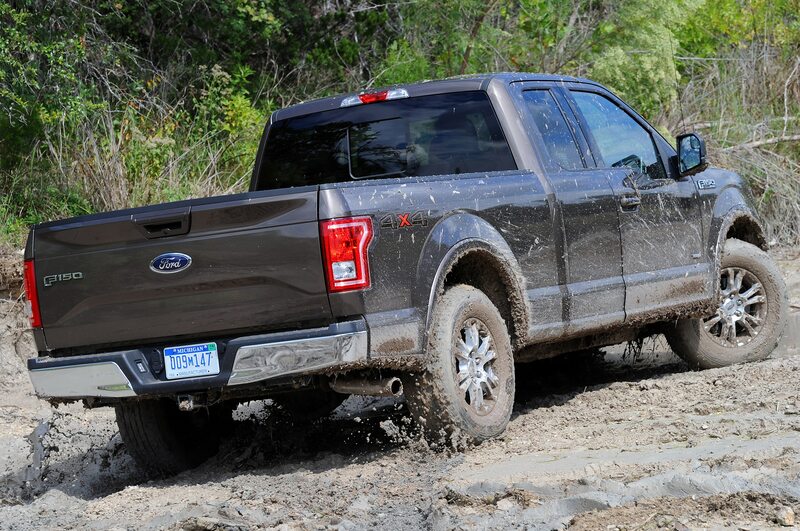 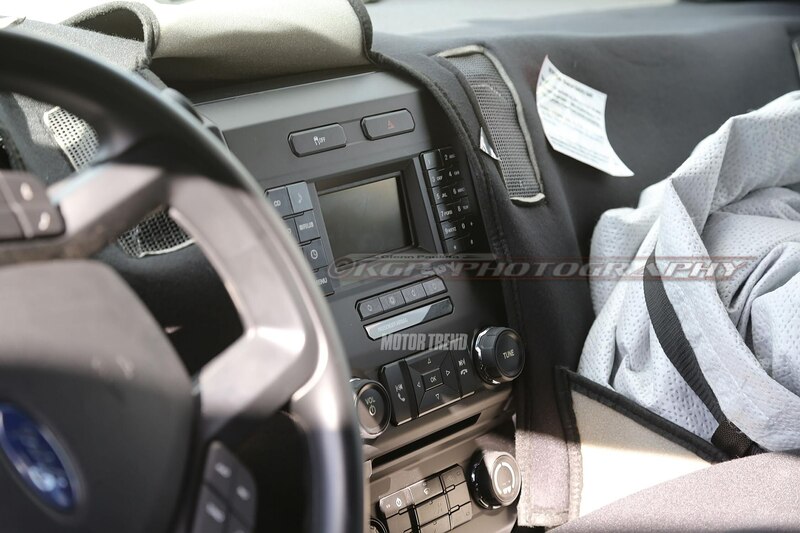 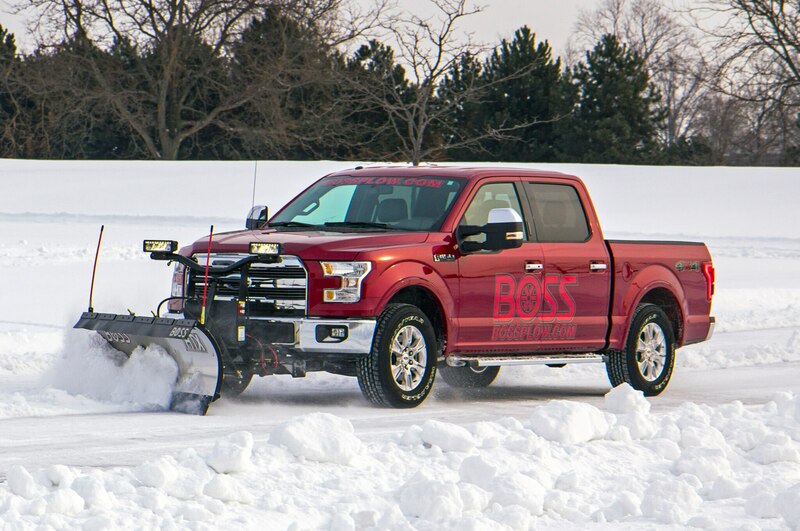 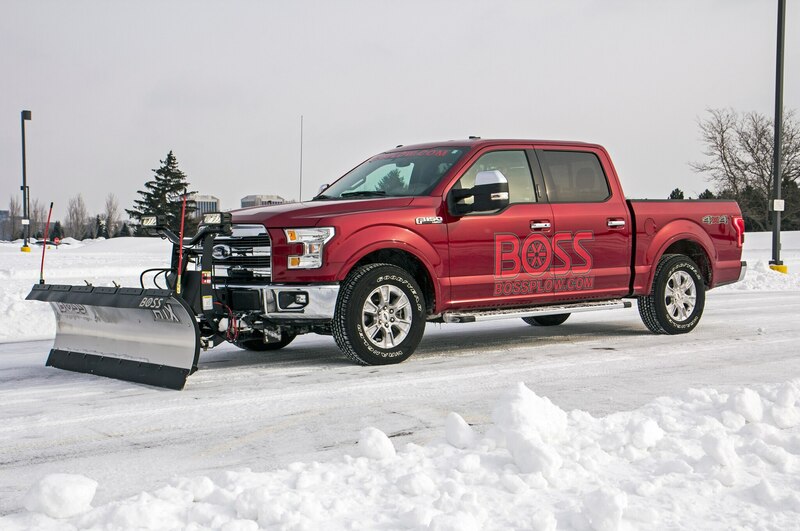 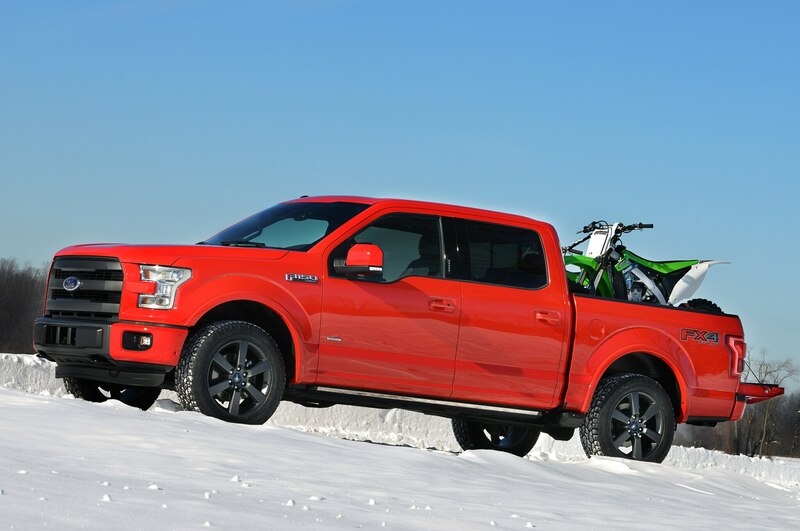 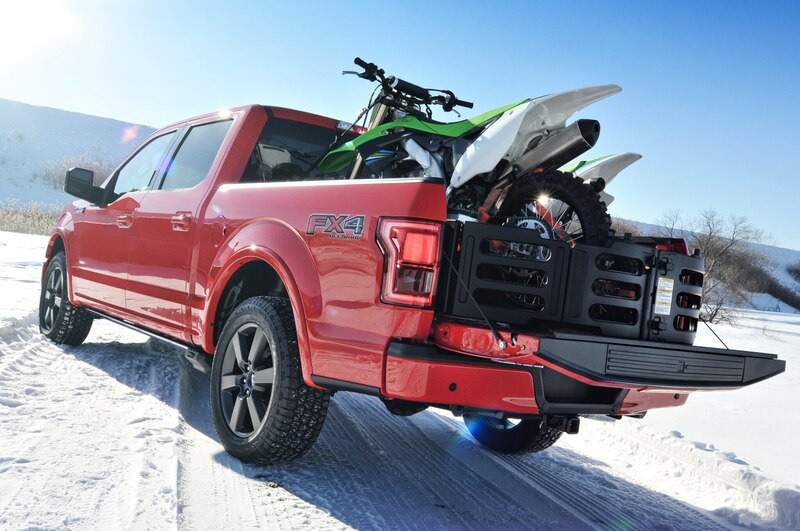 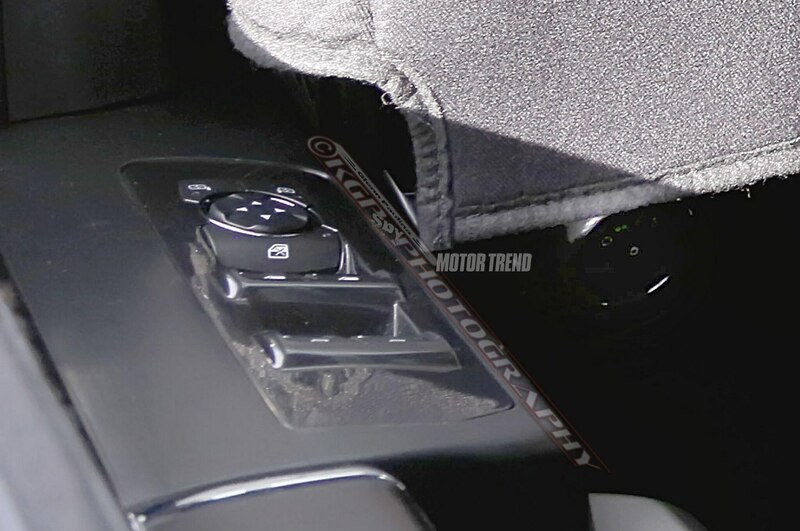 But with nothing in the bed, the truck feels like its spring and shock rates haven’t been eased up for the considerable weight reduction, so the ride is harsher than the F-150’s rivals over harsh metro Detroit pavement. 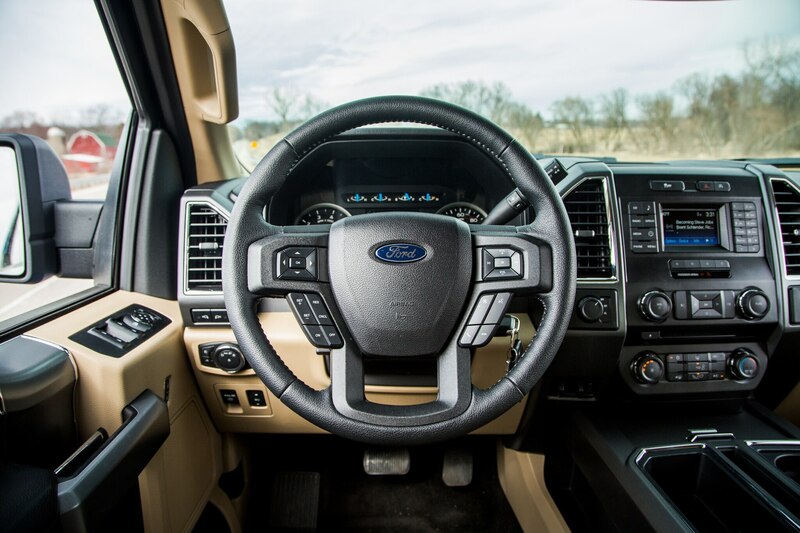 “Steering feel is vague and directional stability is very poor, and the ride is choppier and more brittle than what you get in a Ram or a GM truck,” Holmes adds. 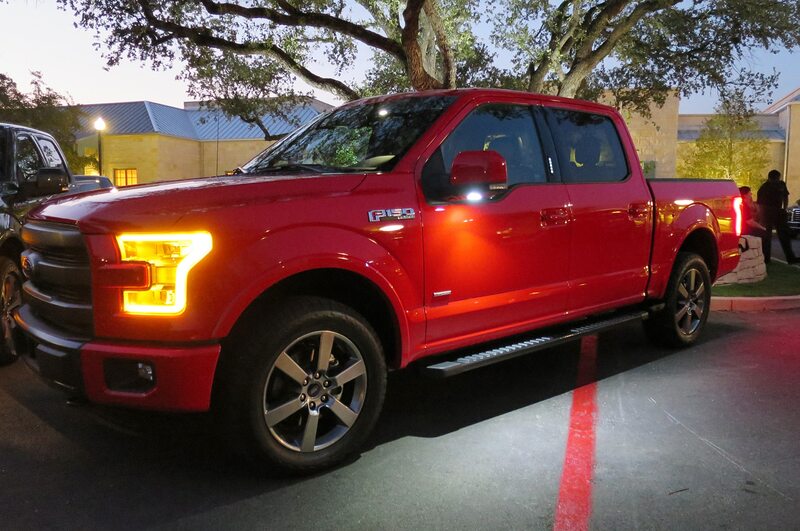 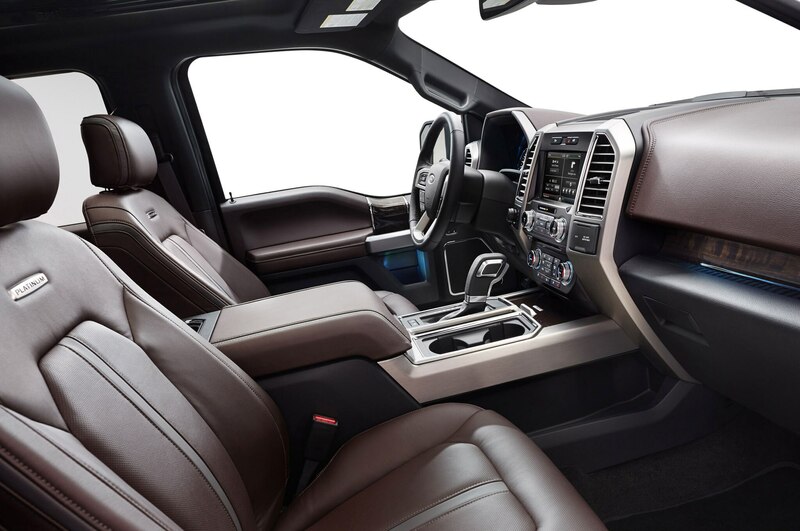 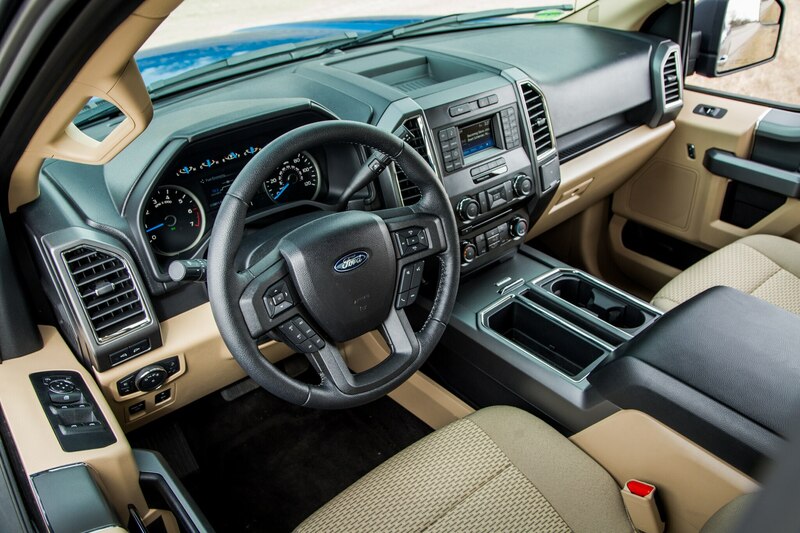 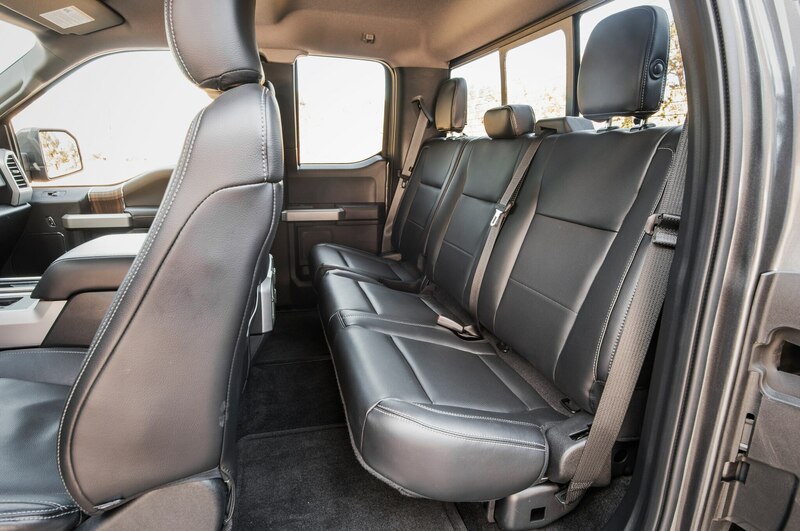 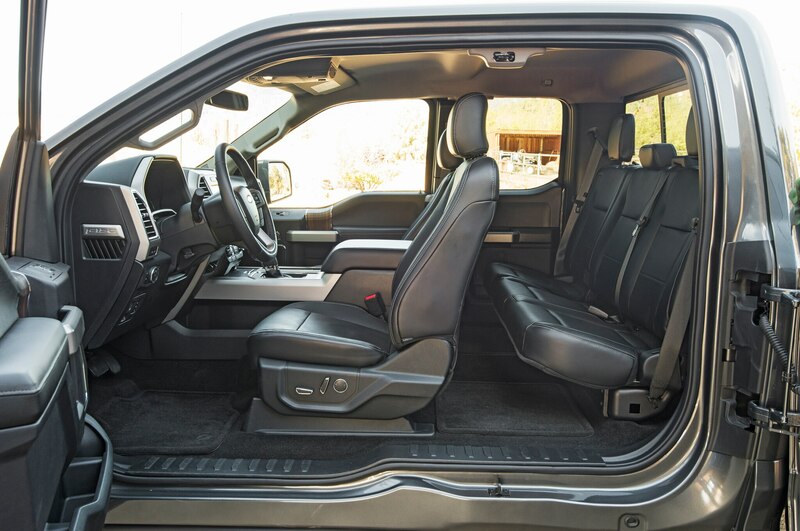 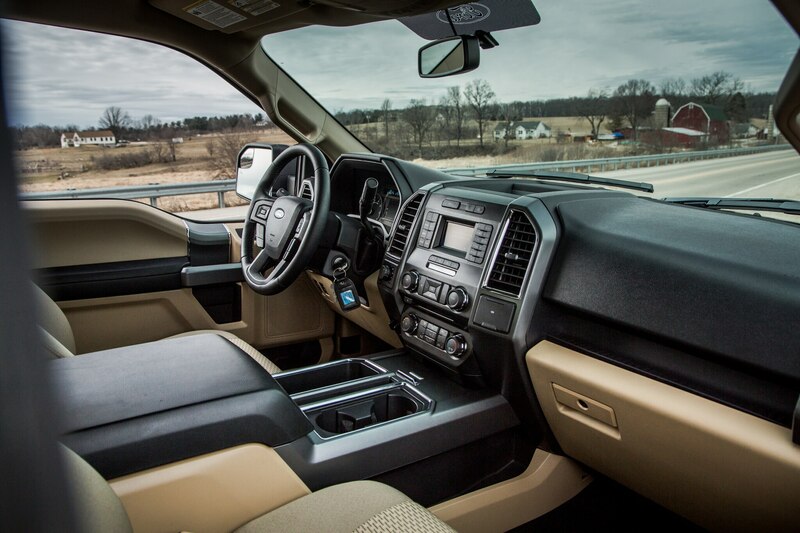 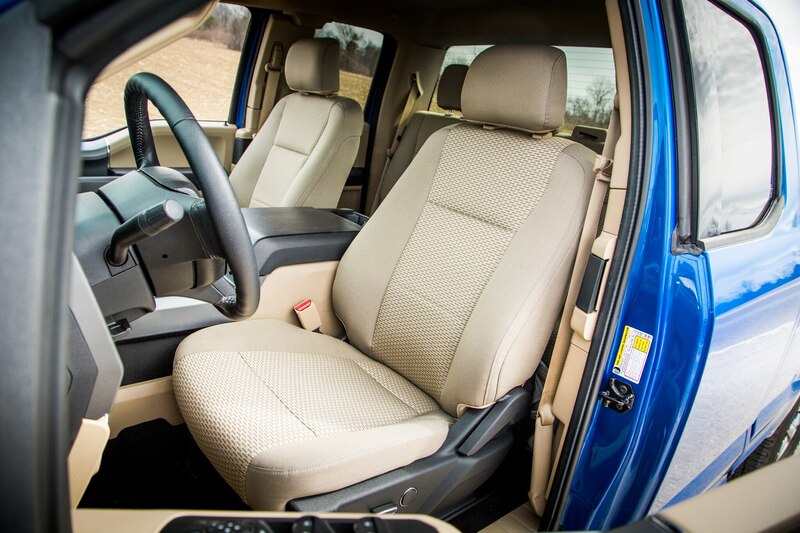 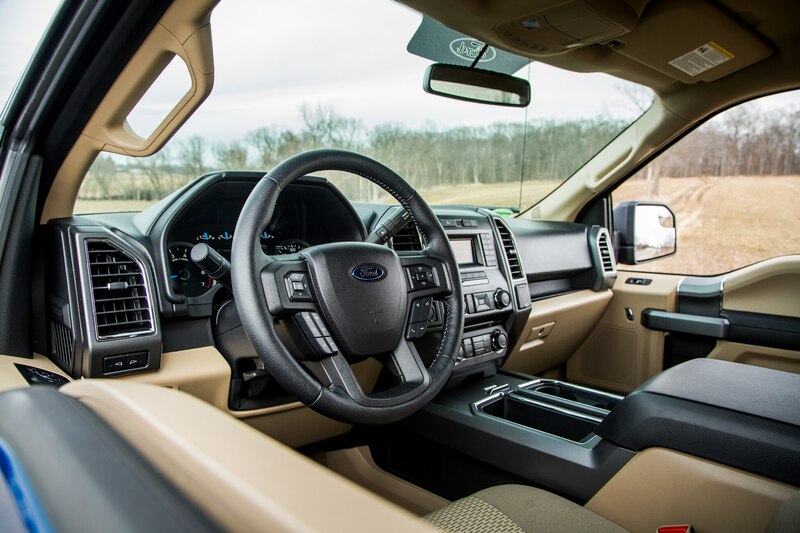 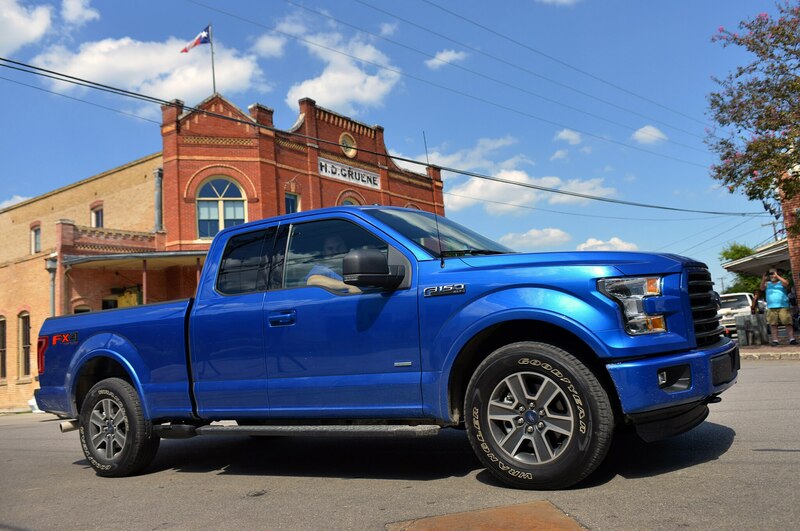 The Monroney’s bottom line for this 2015 Ford F-150 comes to a healthy $44,850, even though this is an honest-to-Willie Nelson work truck, with cloth seats and no fussy tonneau cover. 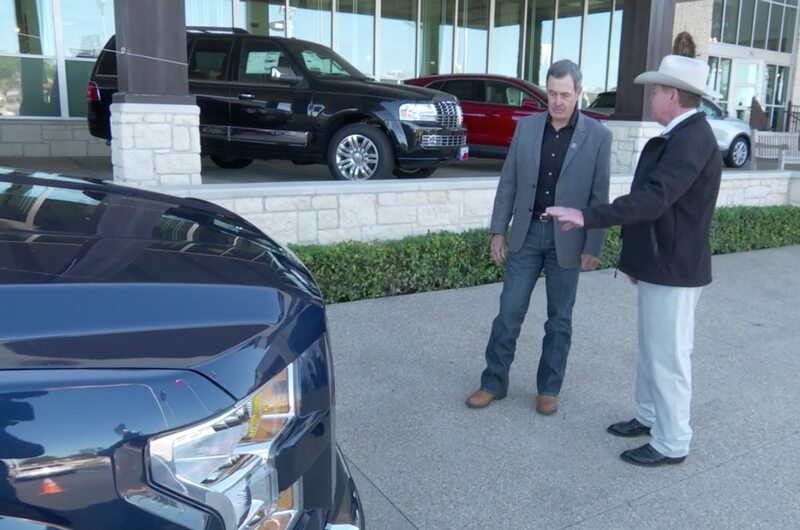 Meanwhile, our time in it overlapped with a Ram Laramie Longhorn that fell only a “Yellow Rose of Texas” horn option short of $55,000. 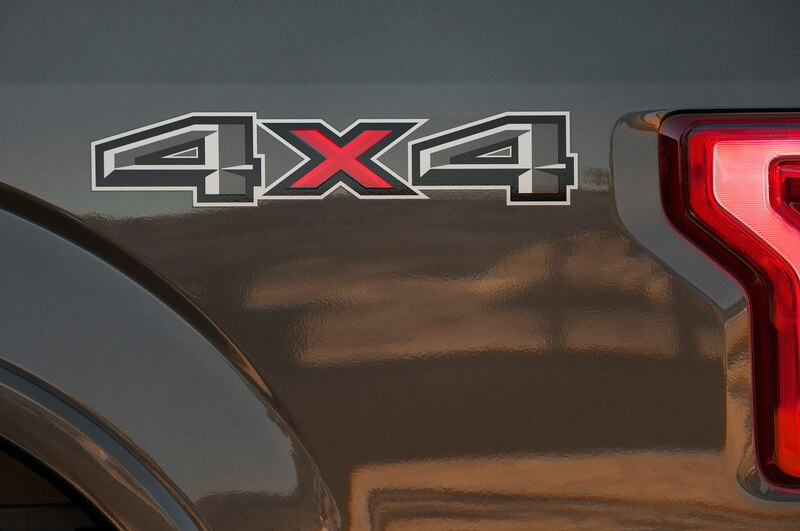 While that Ram came with a Hemi V-8, the EPA says a Ram 1500 4×4 with the 3.6-liter V-6 and eight-speed automatic gets 16/23 mpg city/highway. 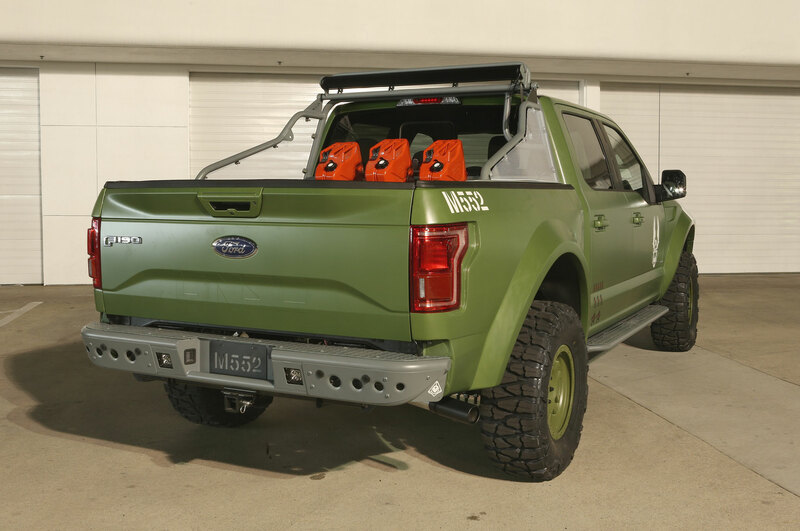 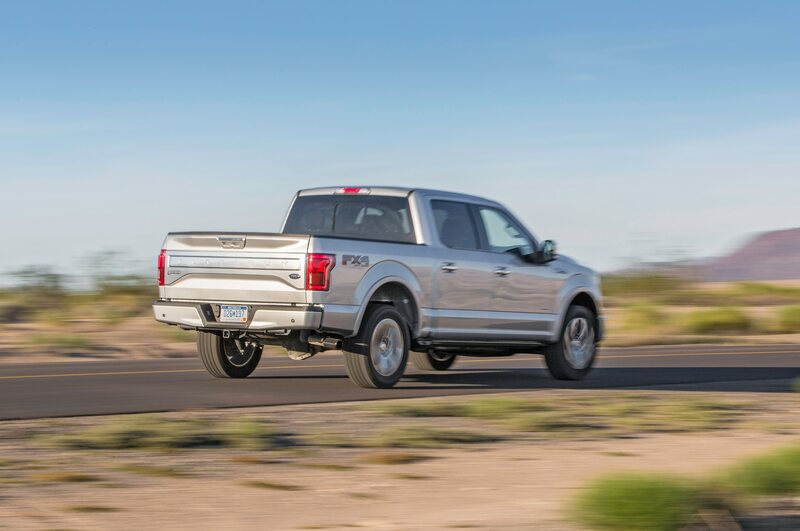 That’s just 2-mpg shy of the city number for the Ford F-150 4×4 with 2.7-liter turbo V-6 and six-speed automatic, and matches the Ford on the highway. 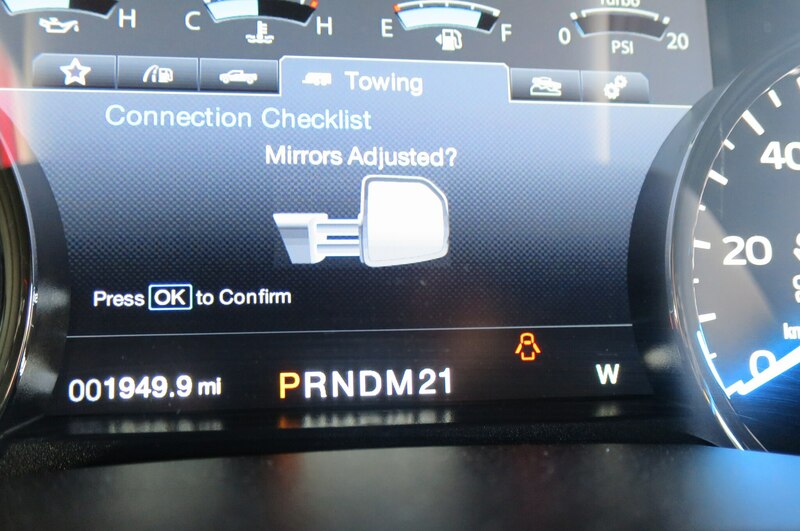 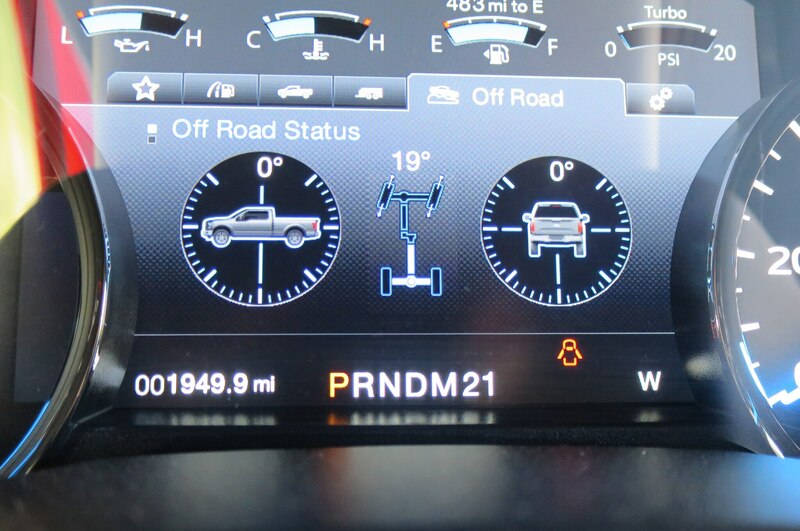 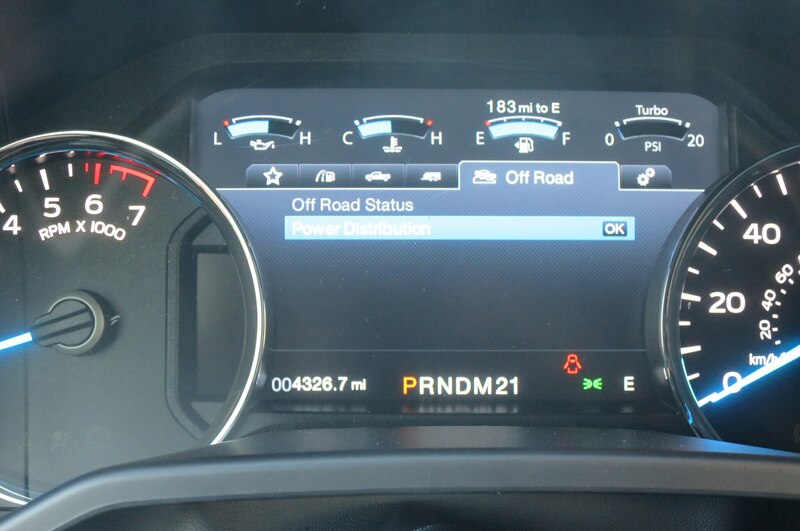 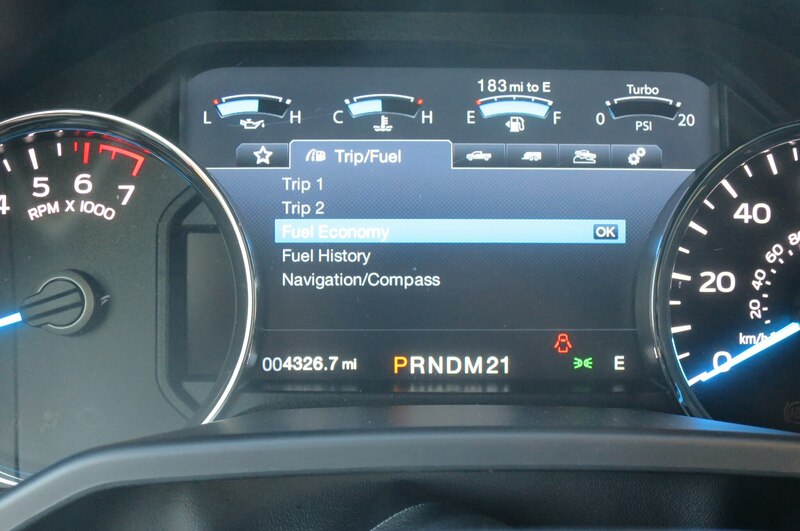 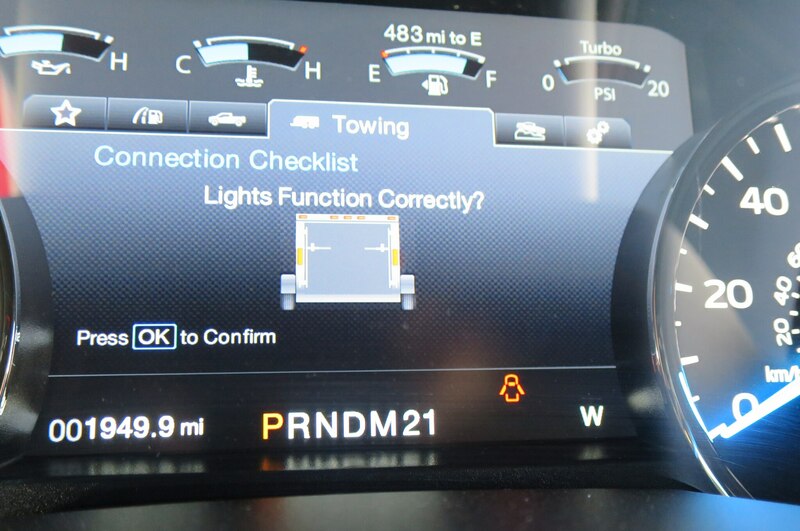 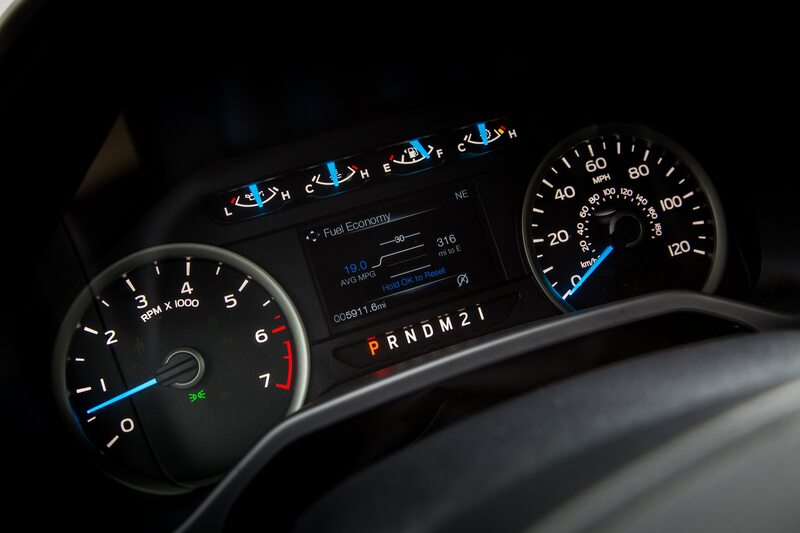 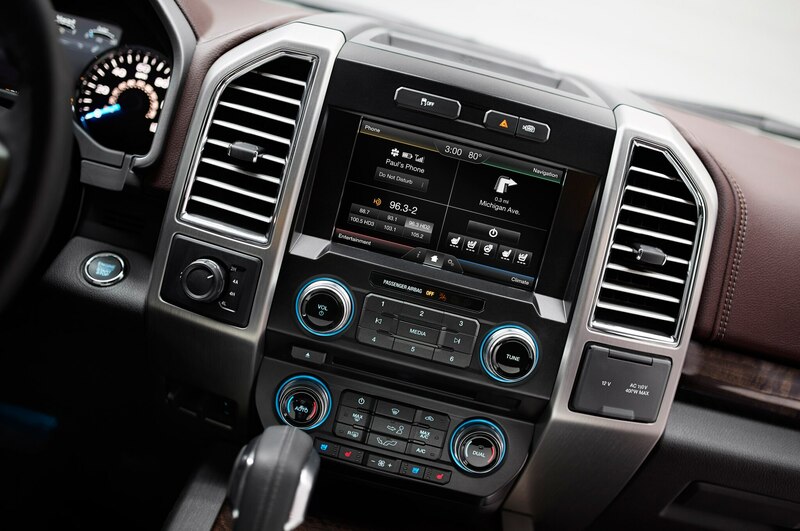 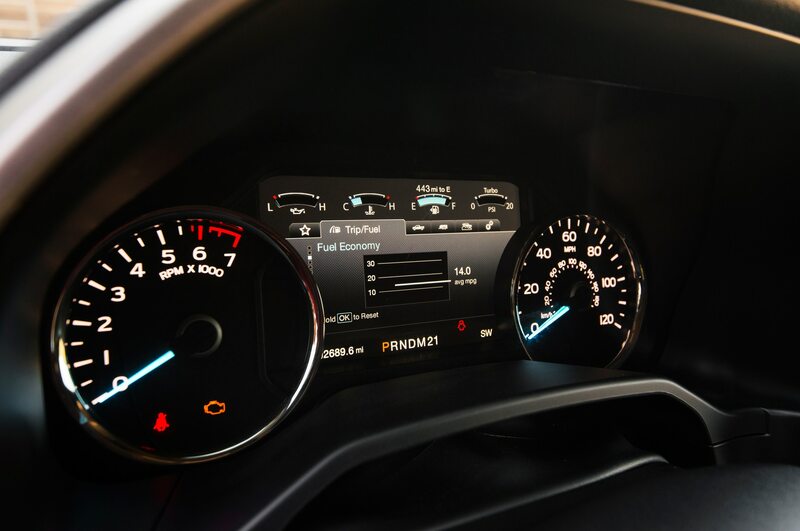 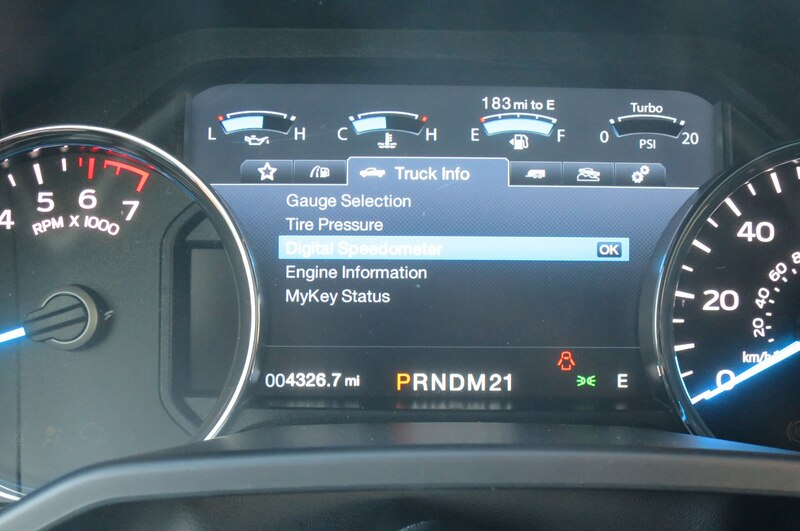 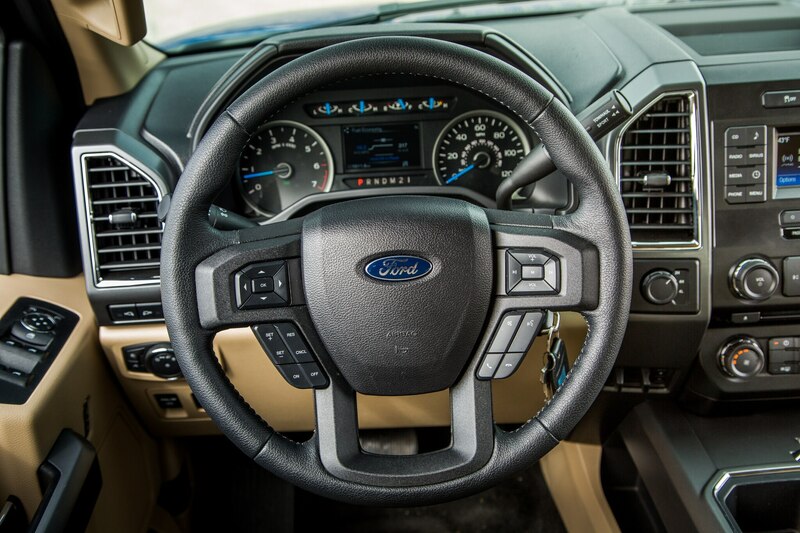 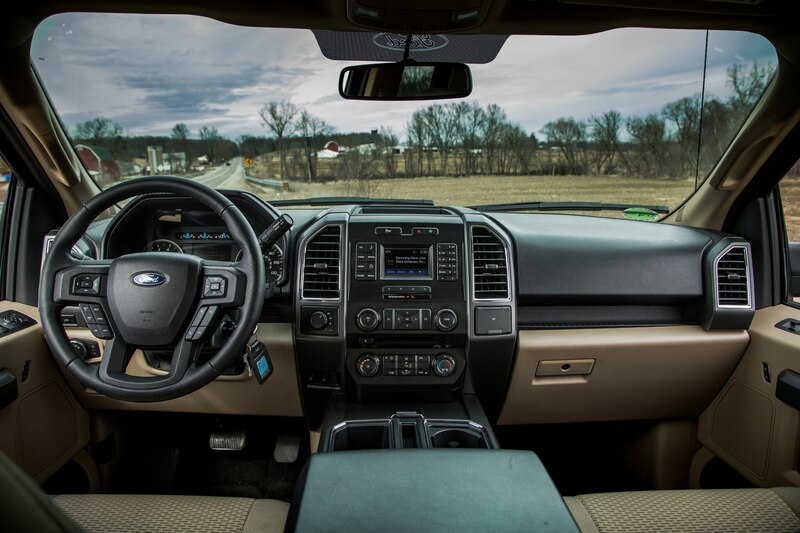 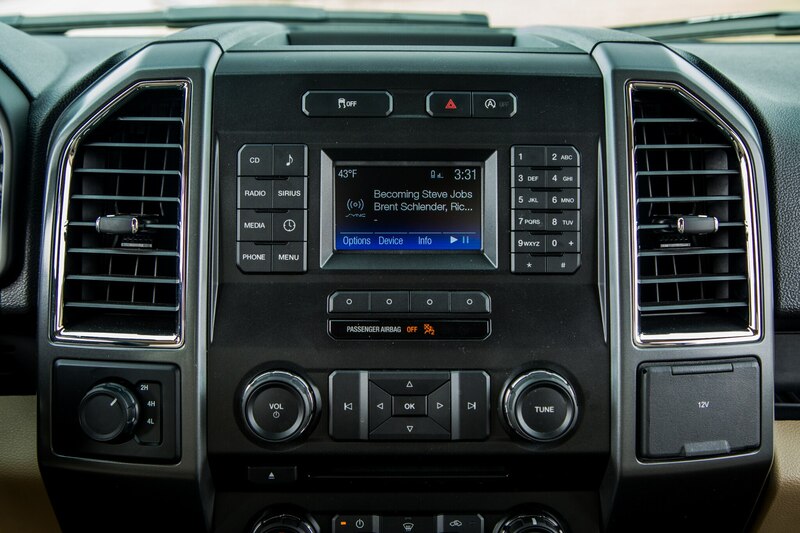 Our dashboard mpg readout for the 2015 Ford F-150 never got above 17.5 mpg. 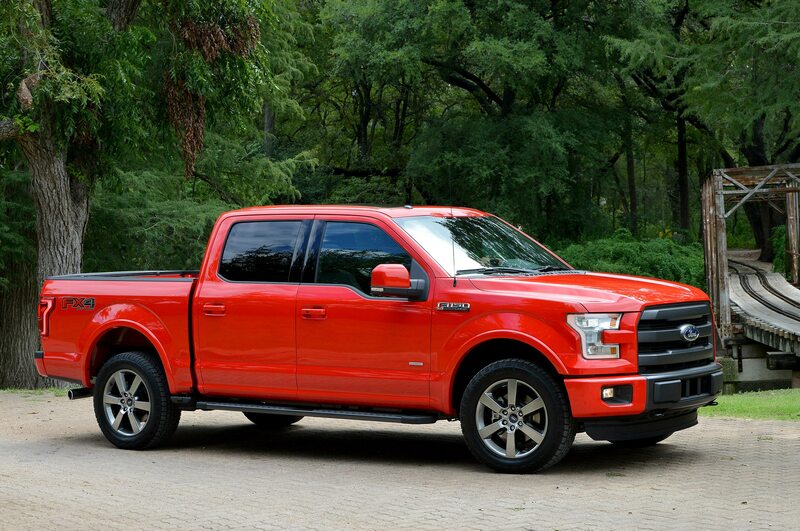 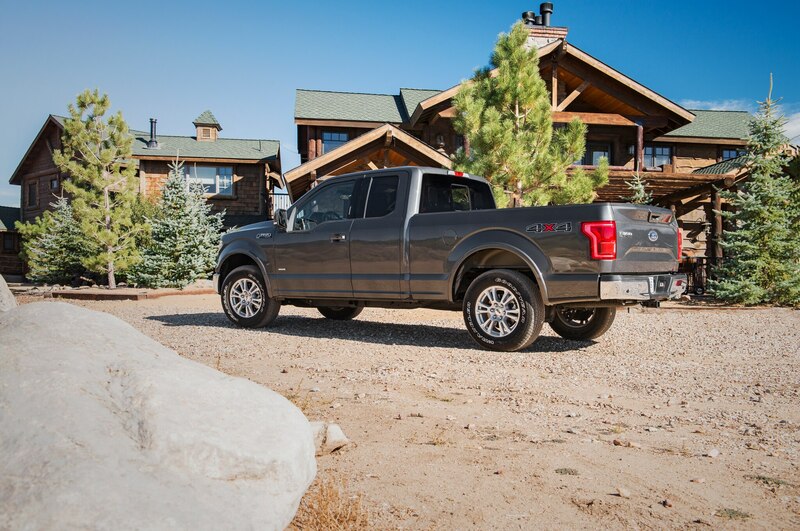 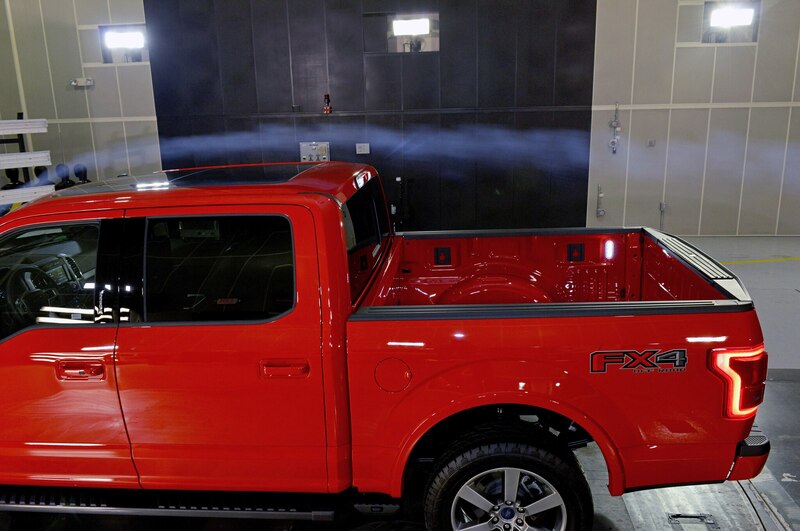 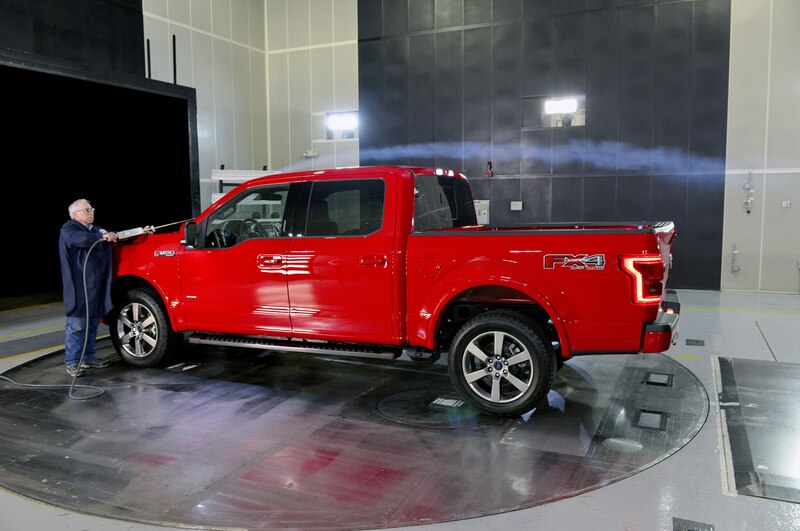 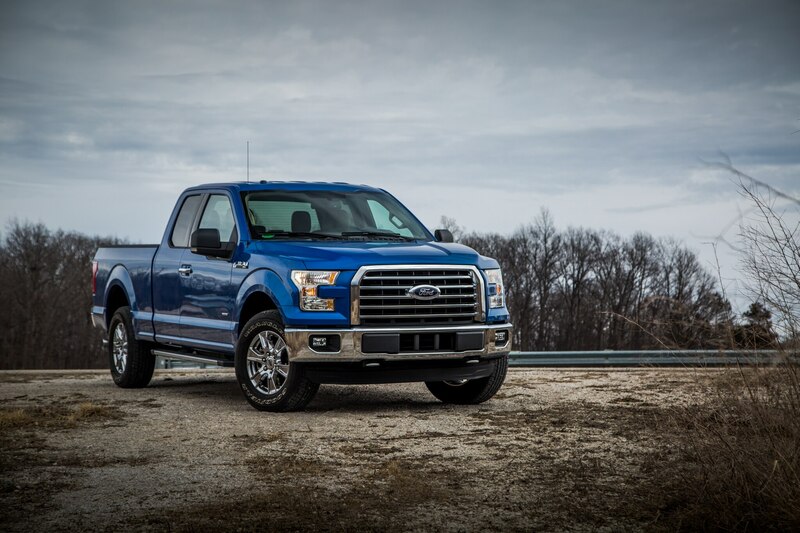 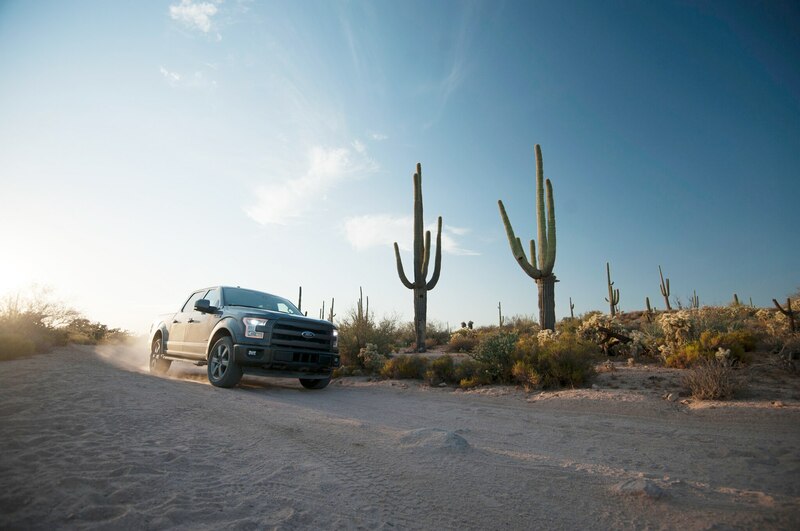 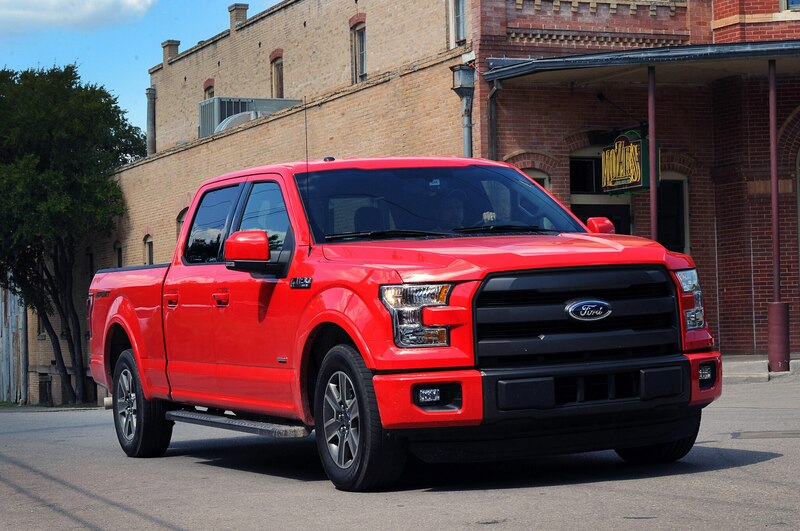 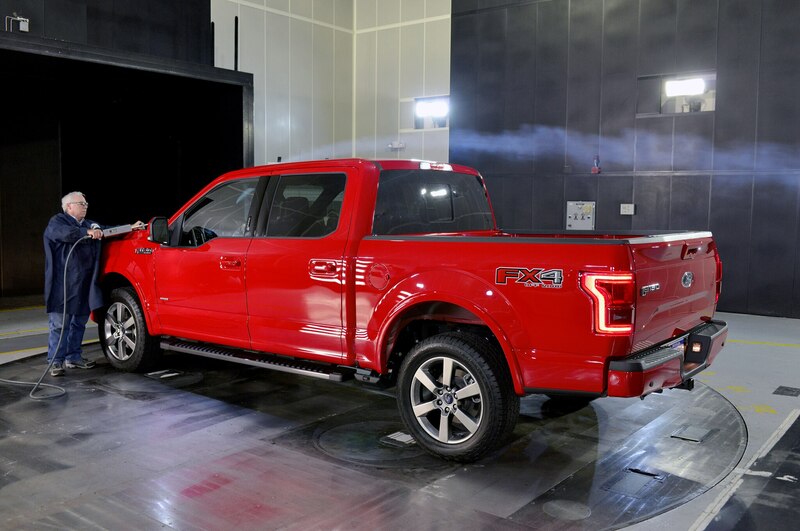 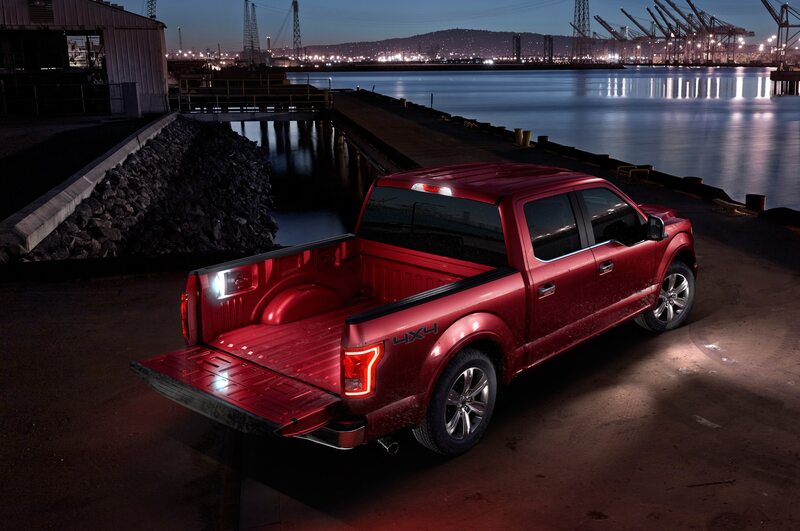 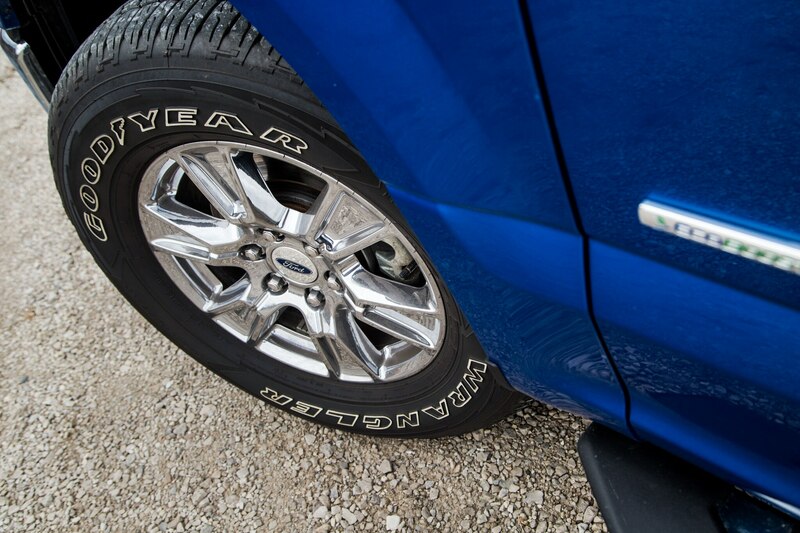 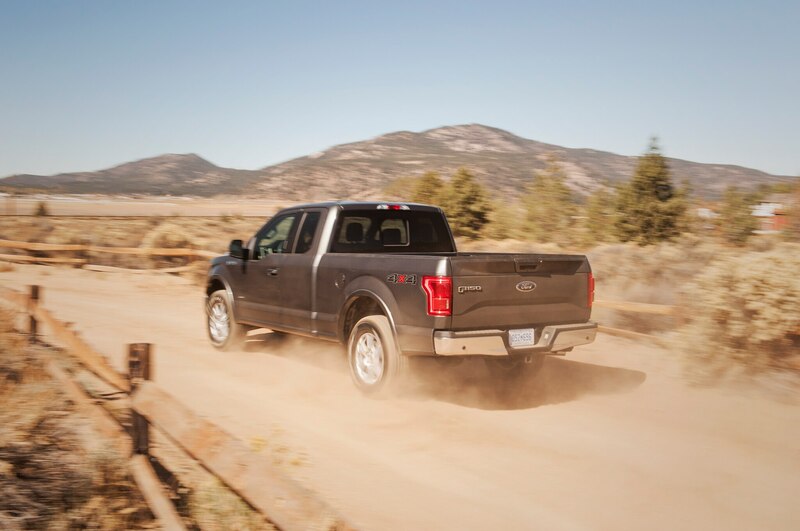 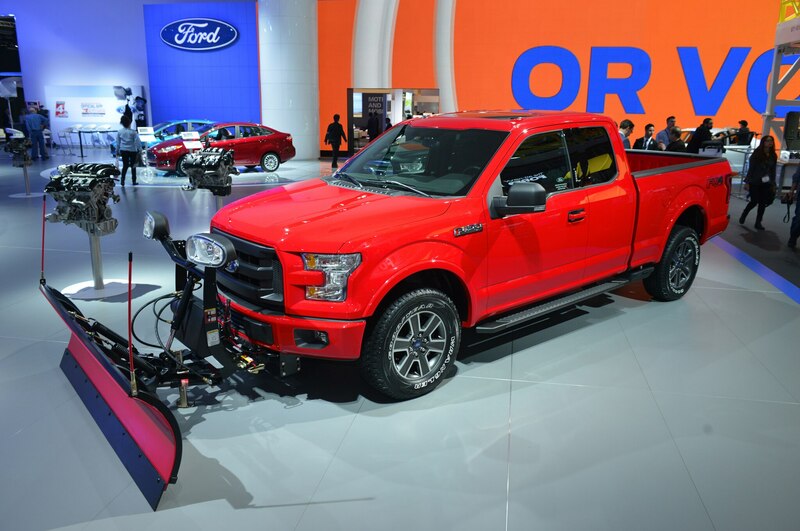 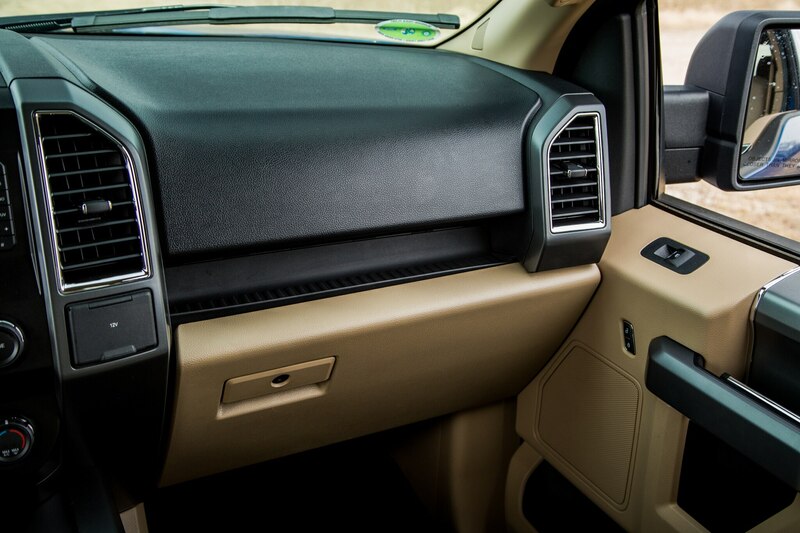 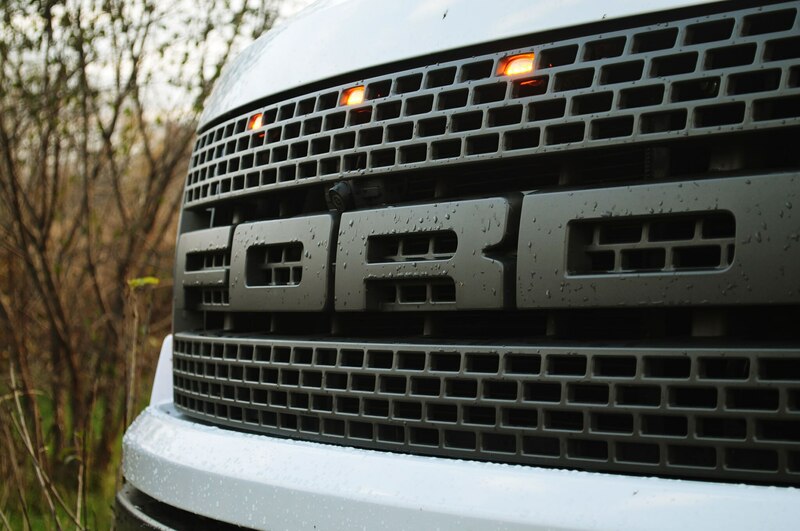 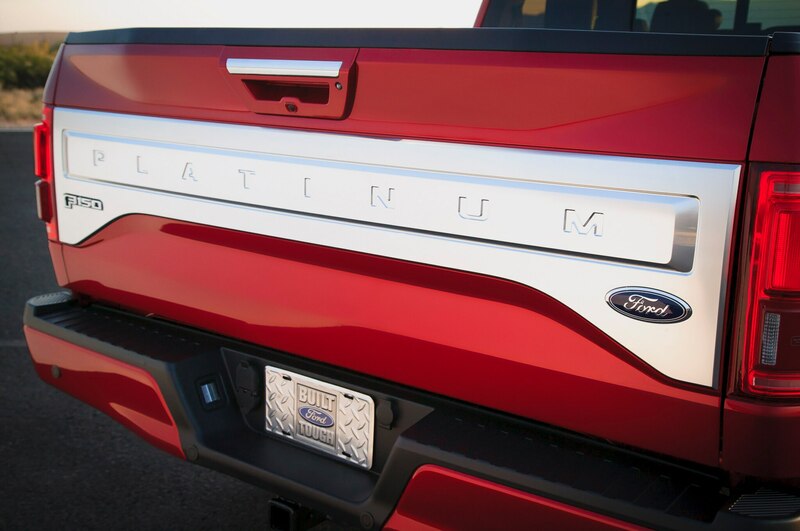 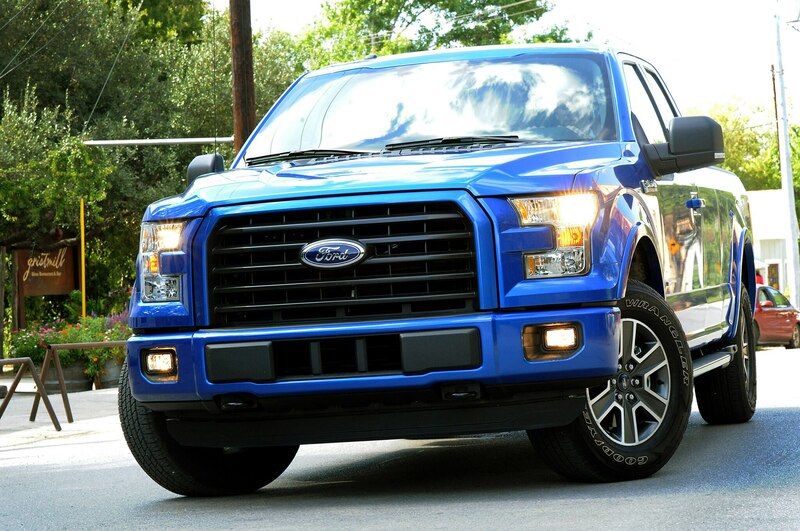 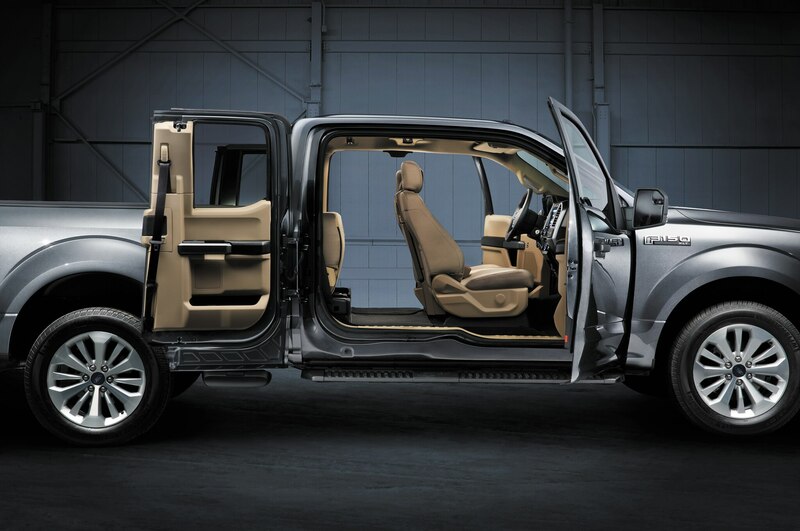 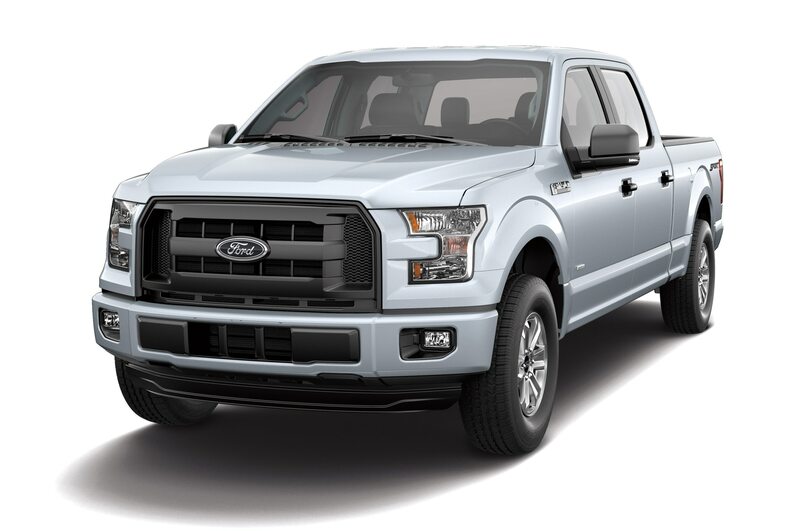 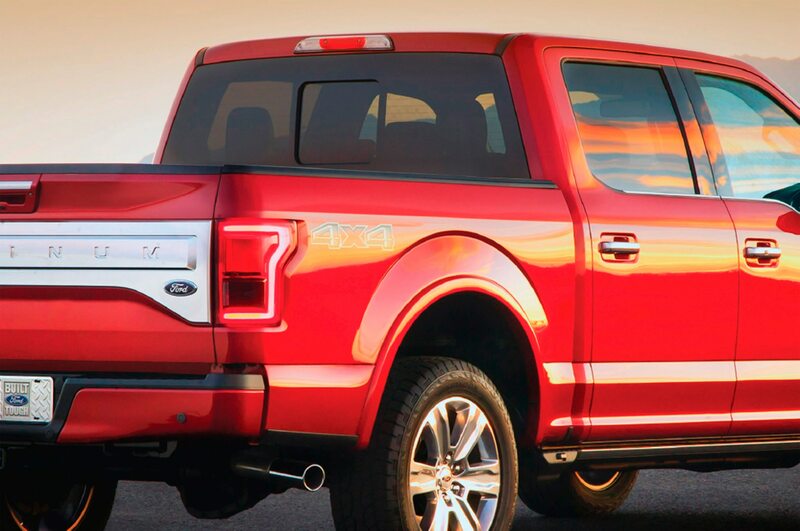 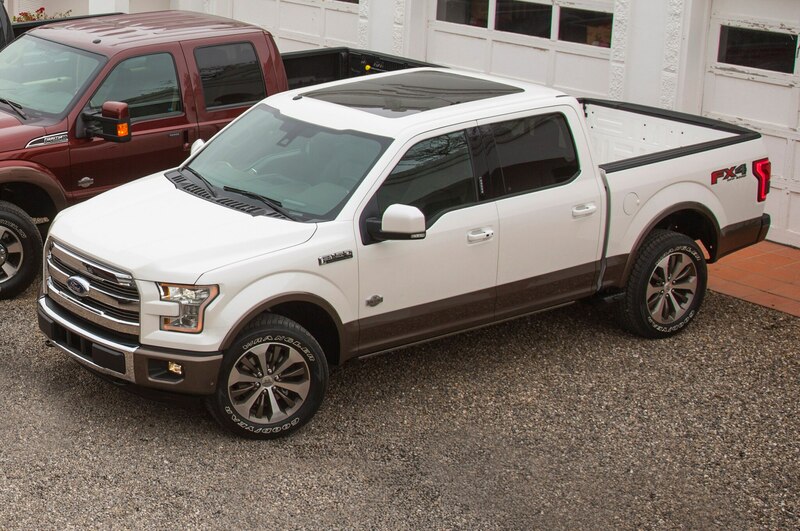 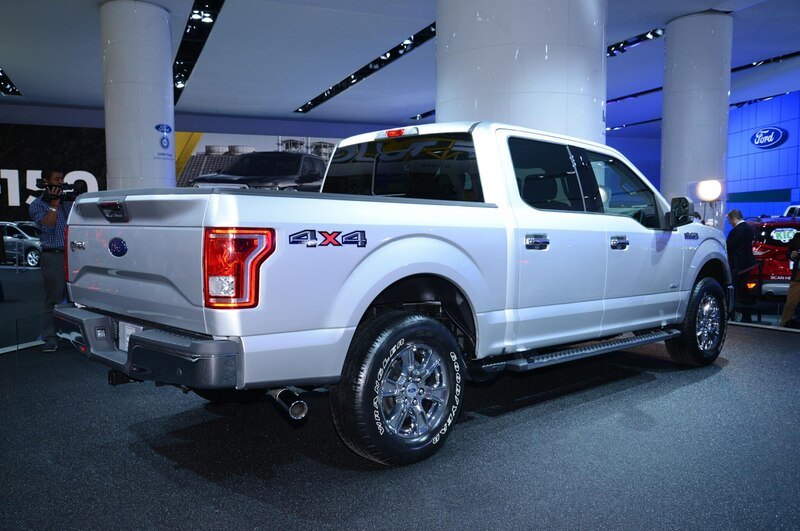 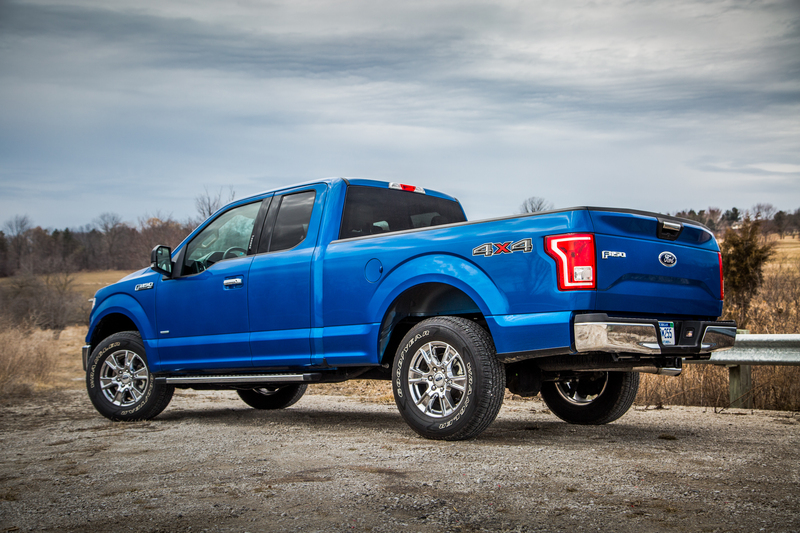 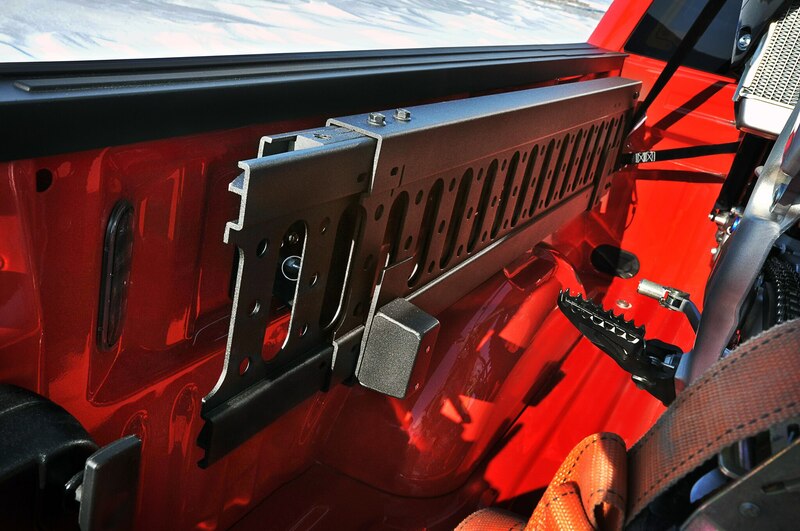 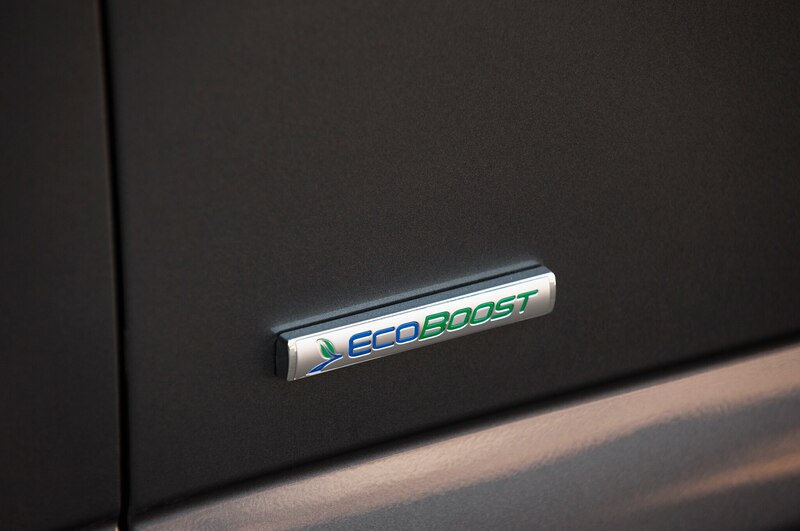 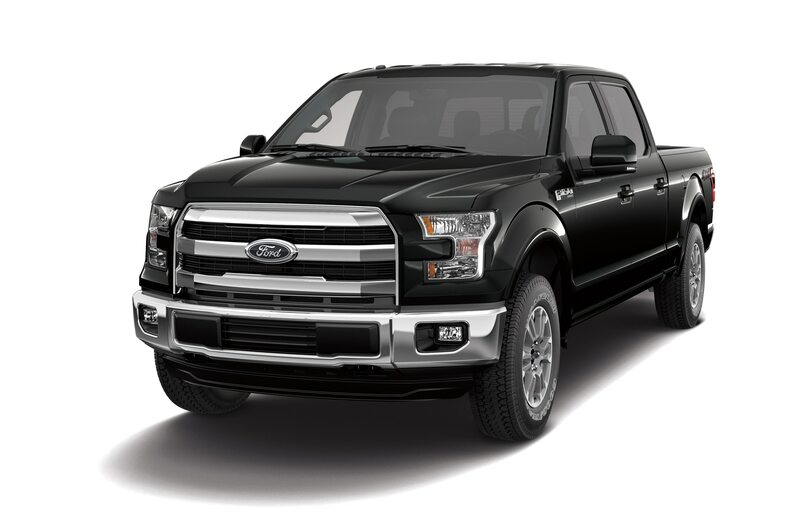 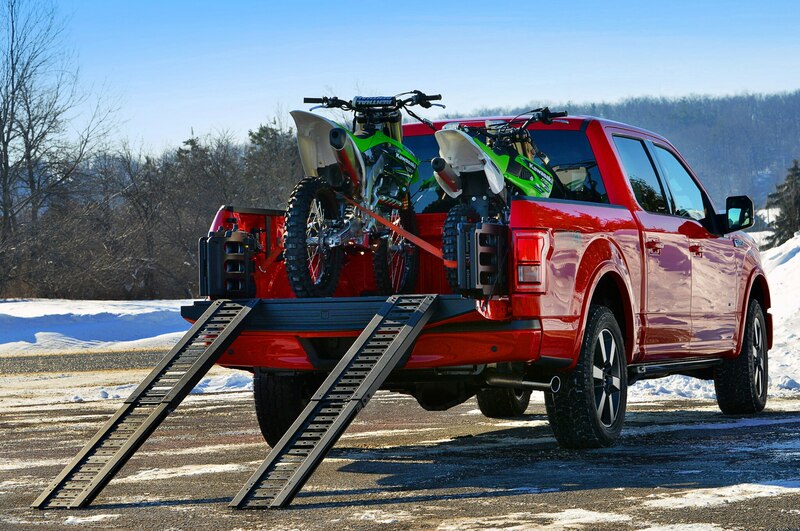 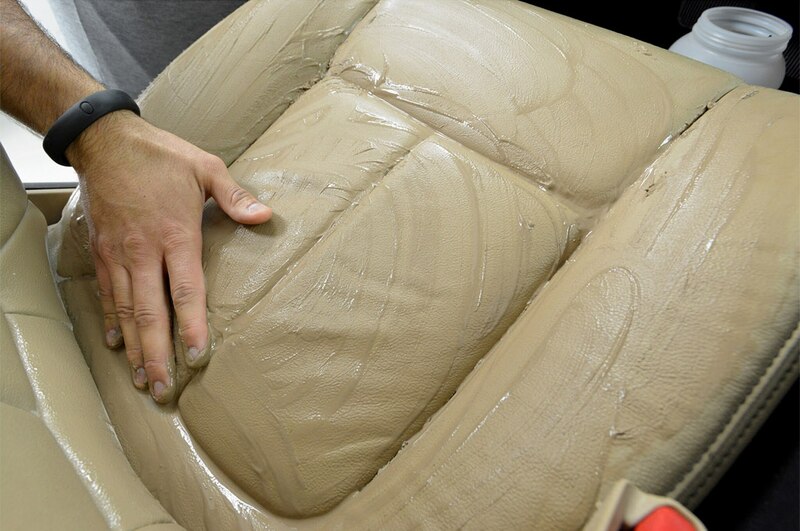 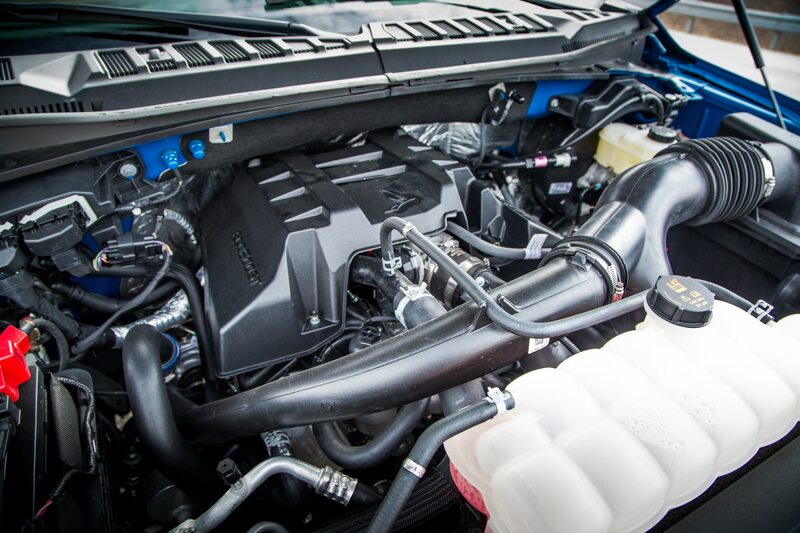 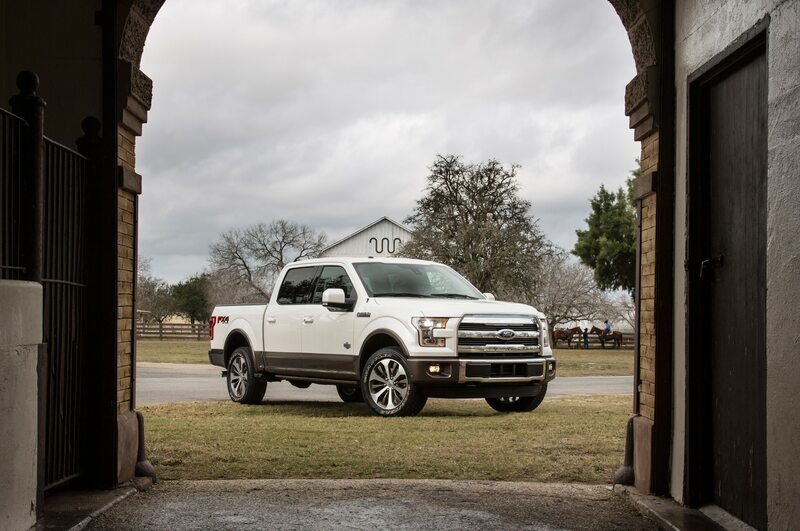 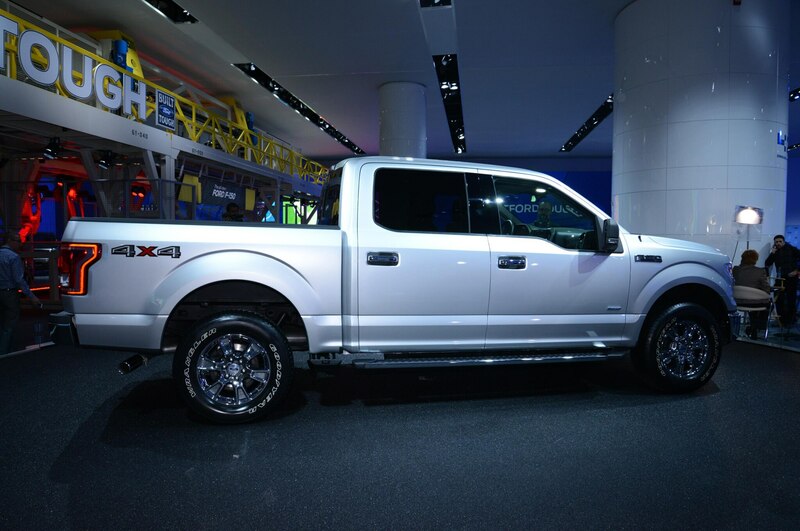 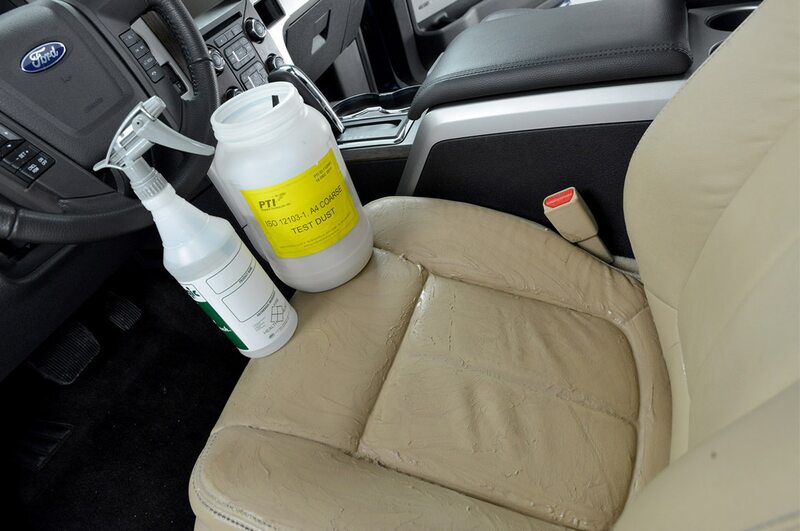 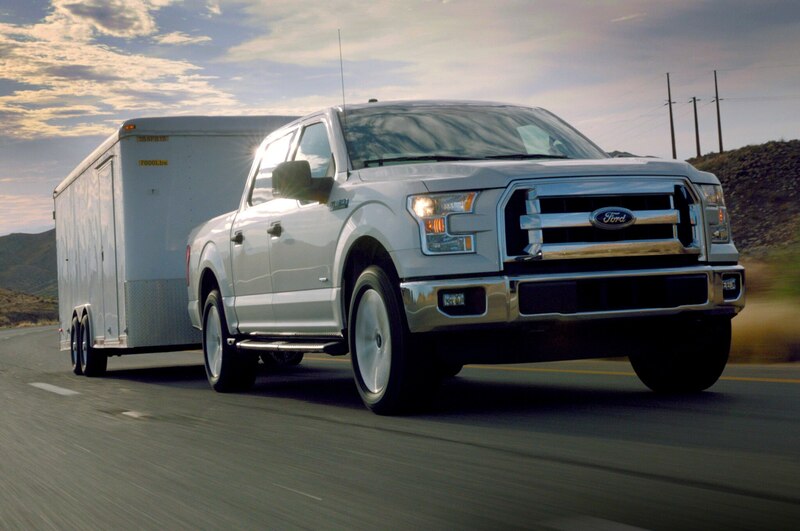 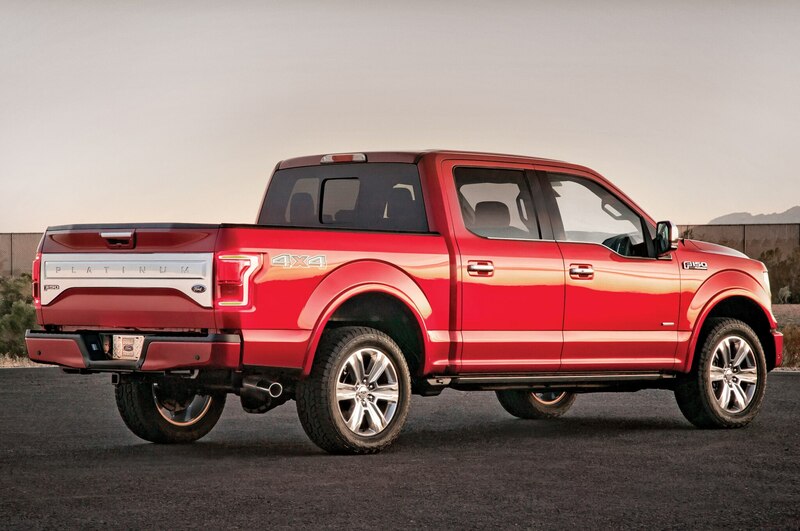 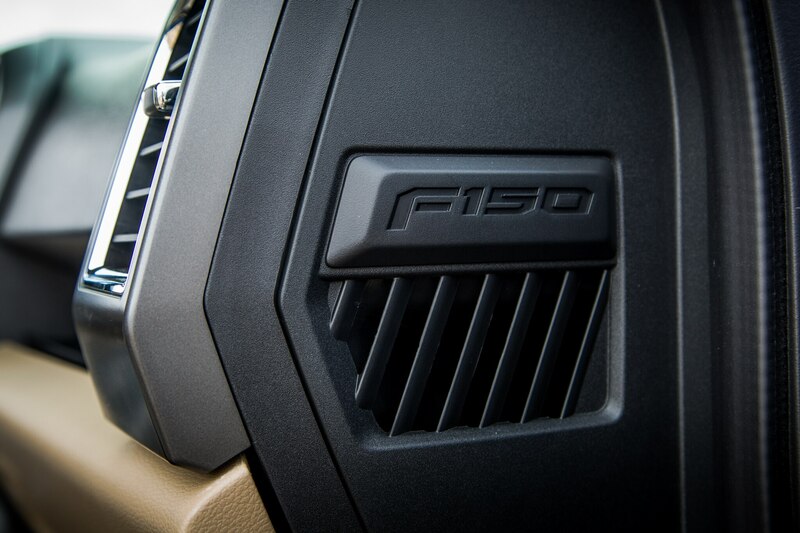 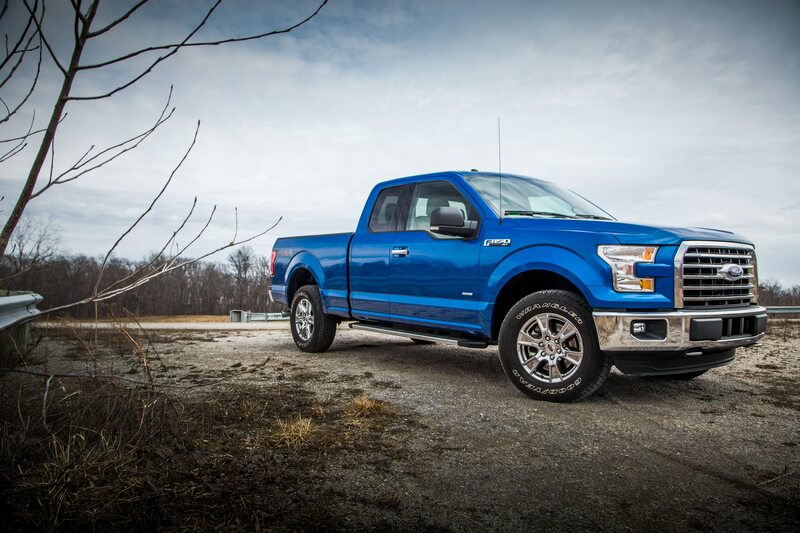 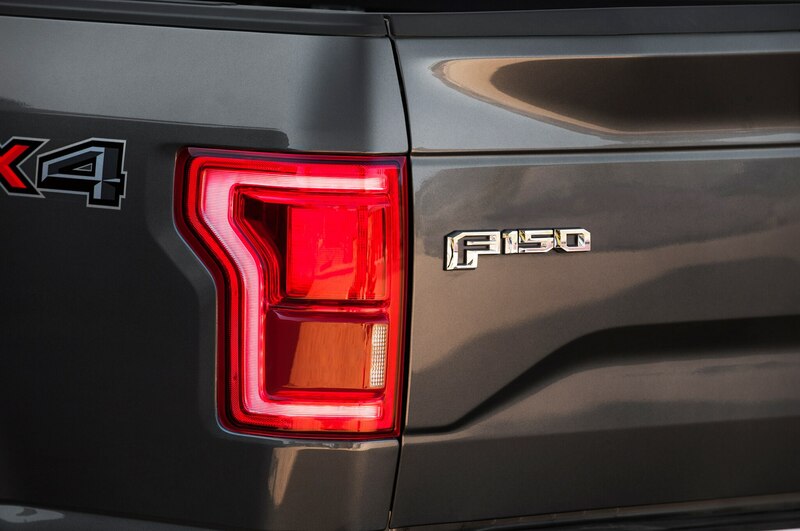 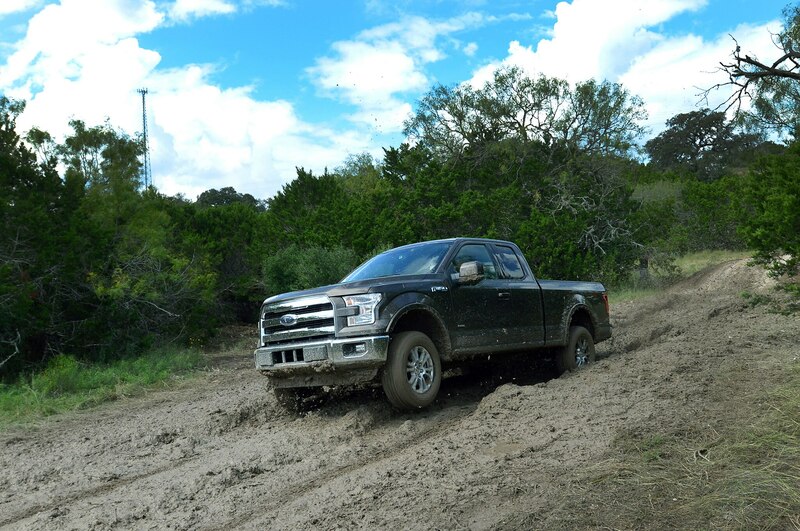 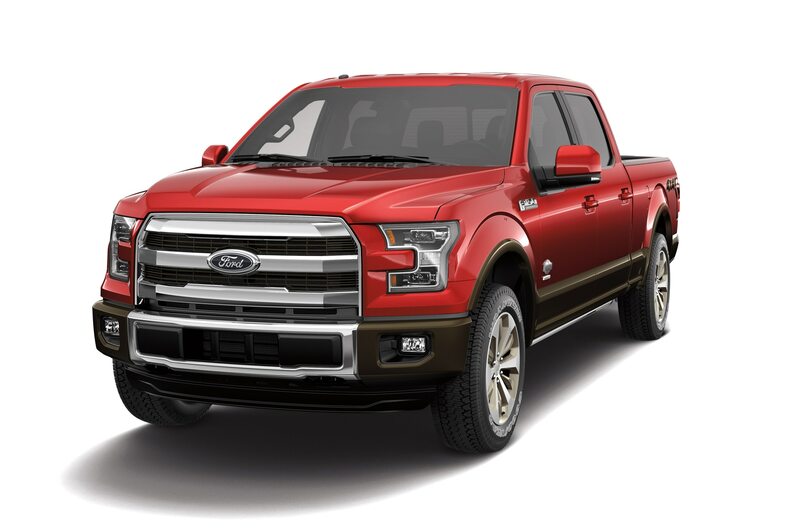 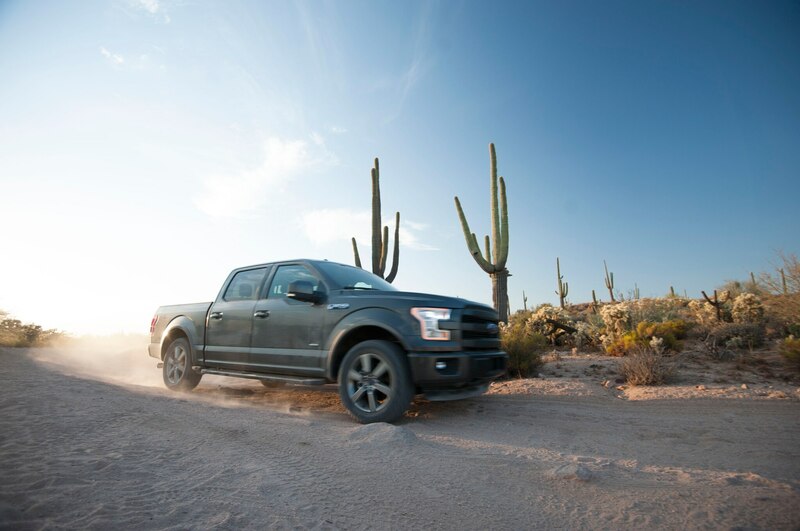 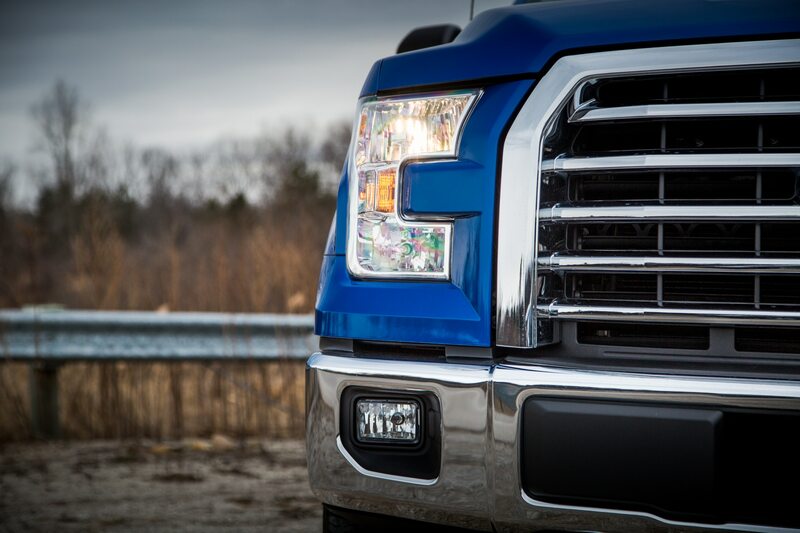 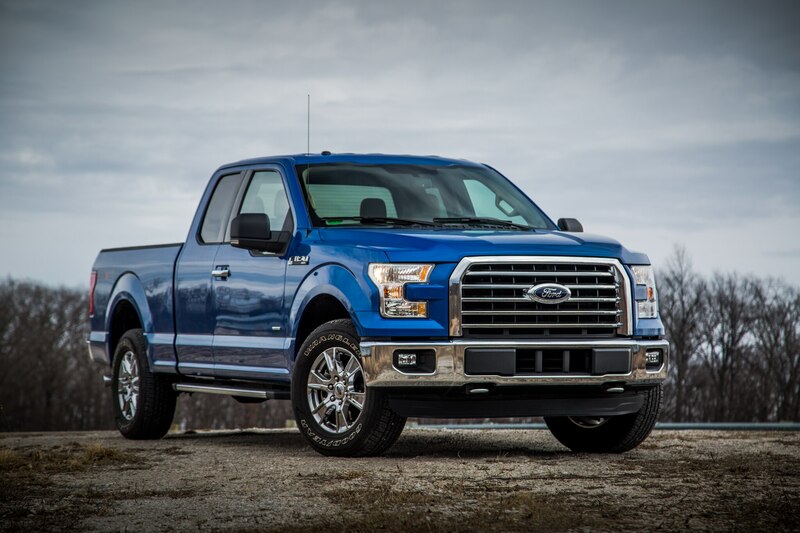 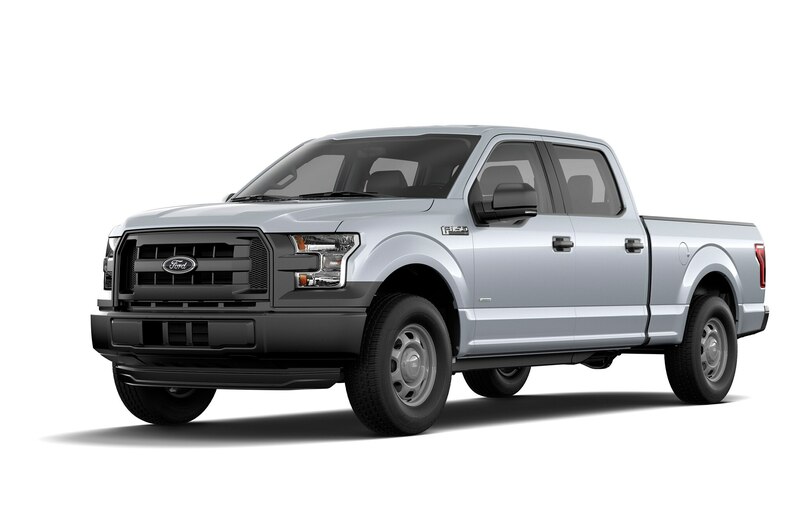 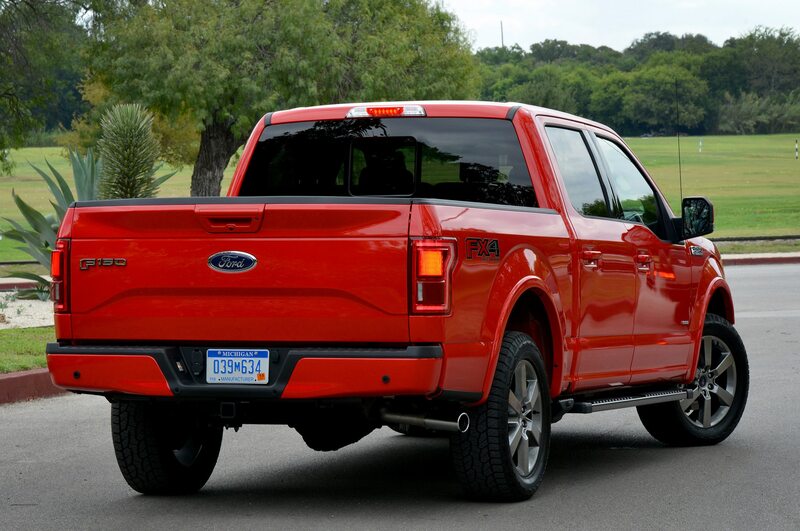 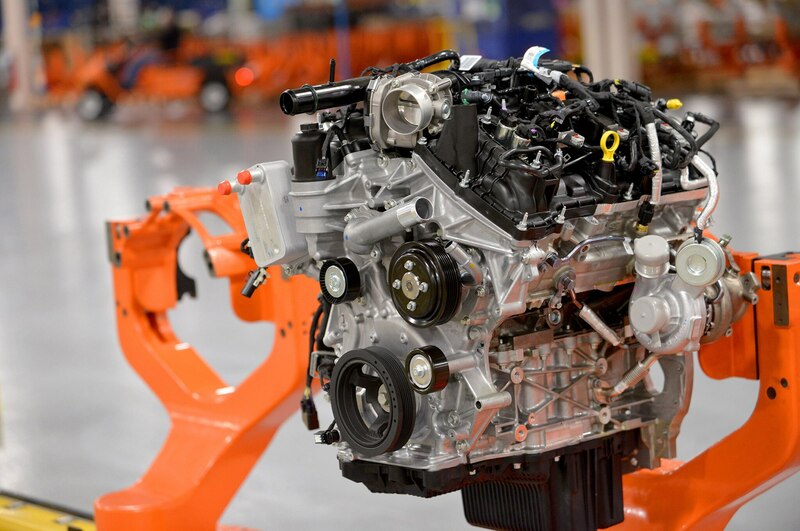 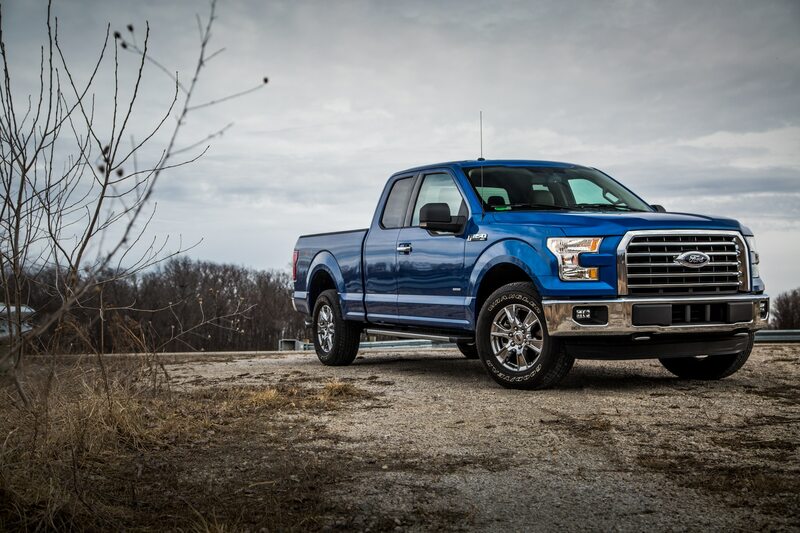 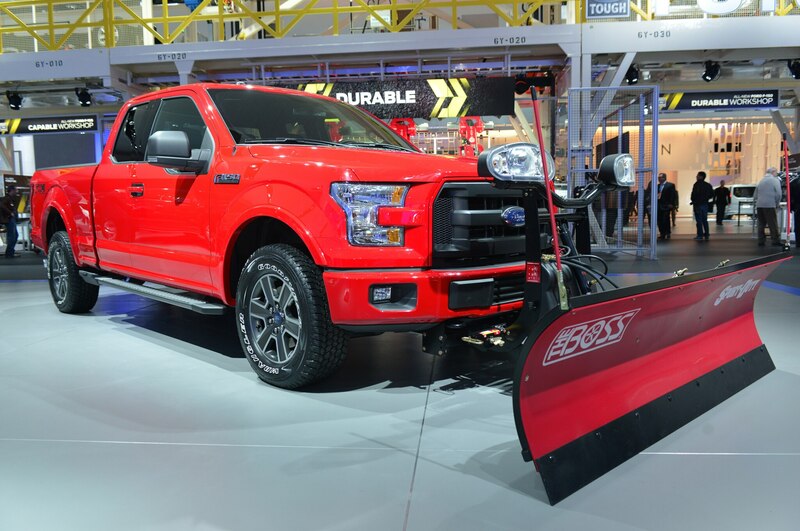 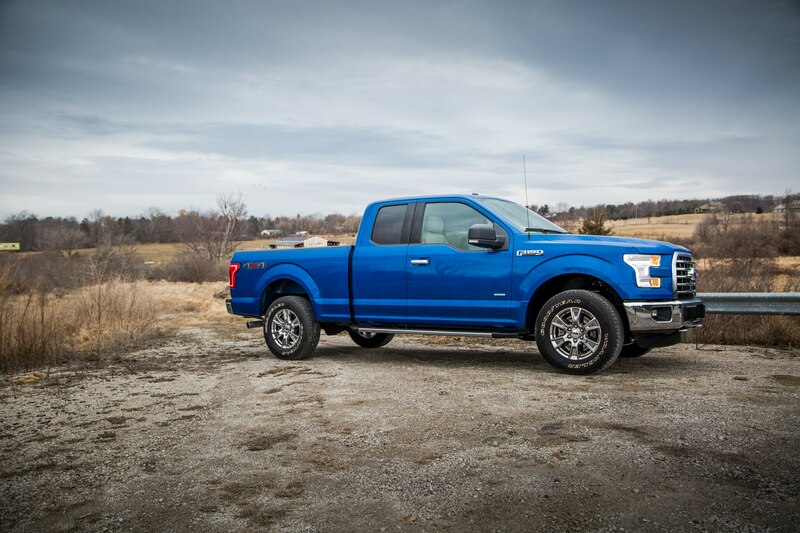 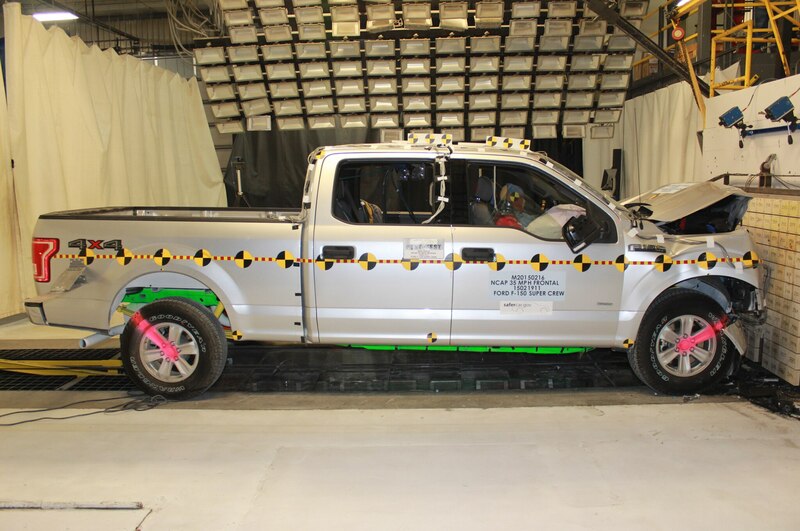 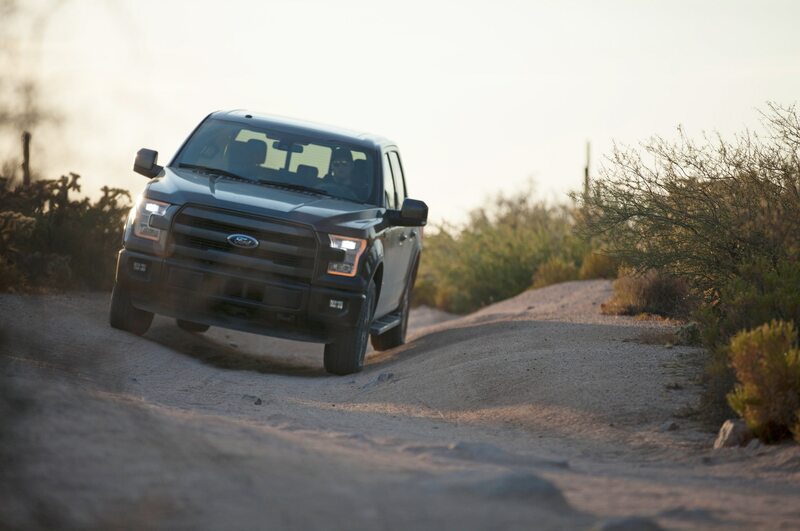 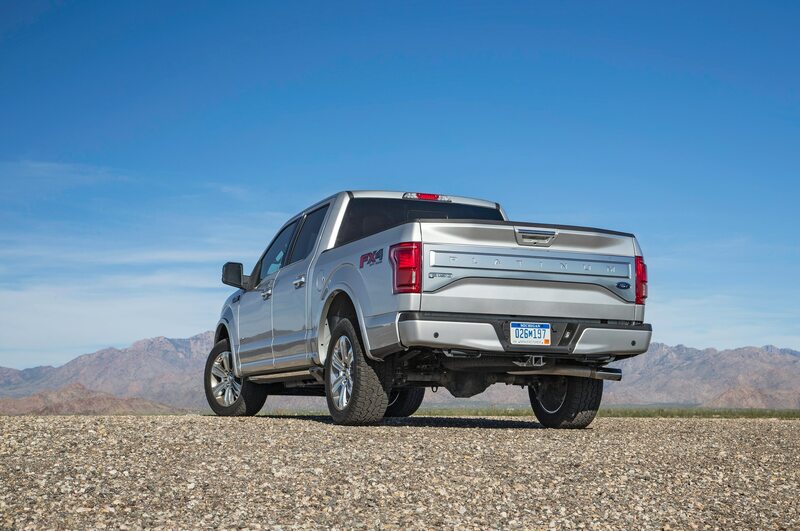 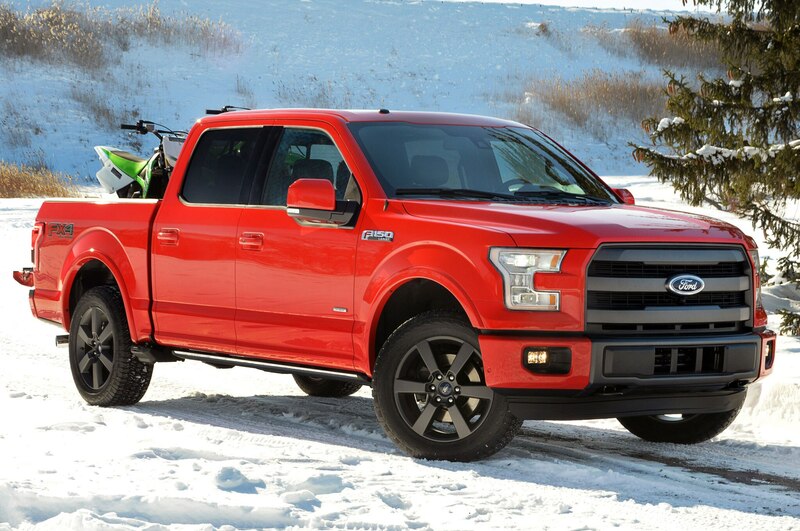 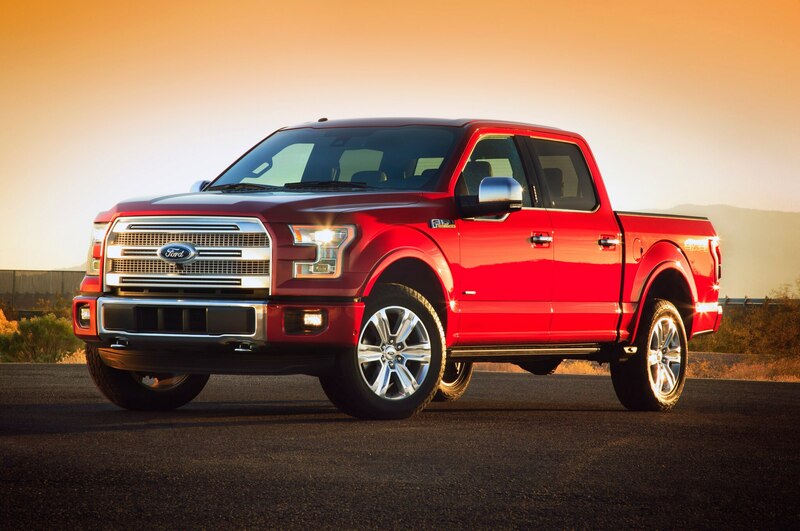 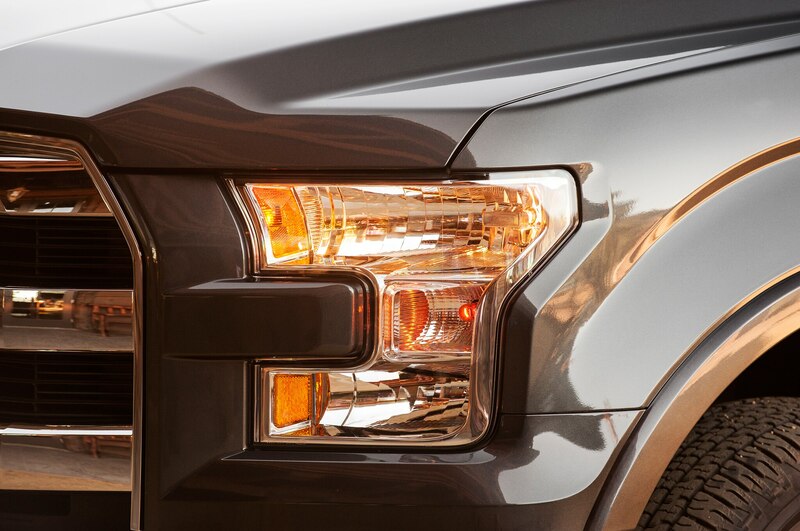 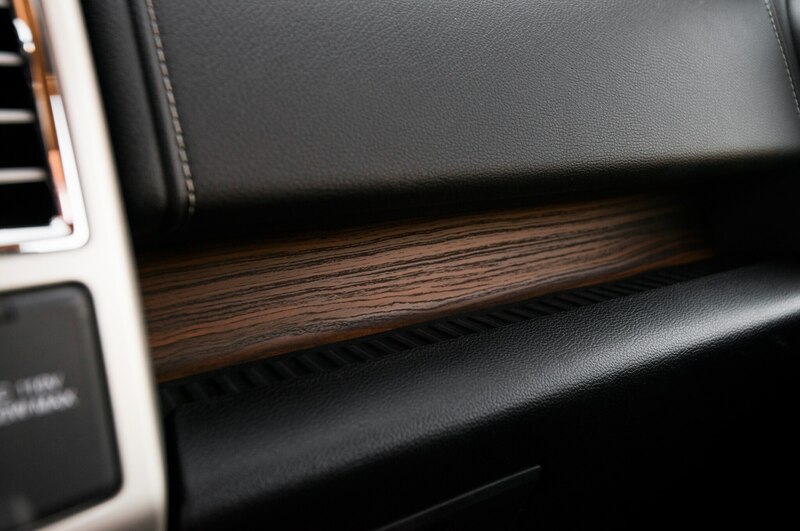 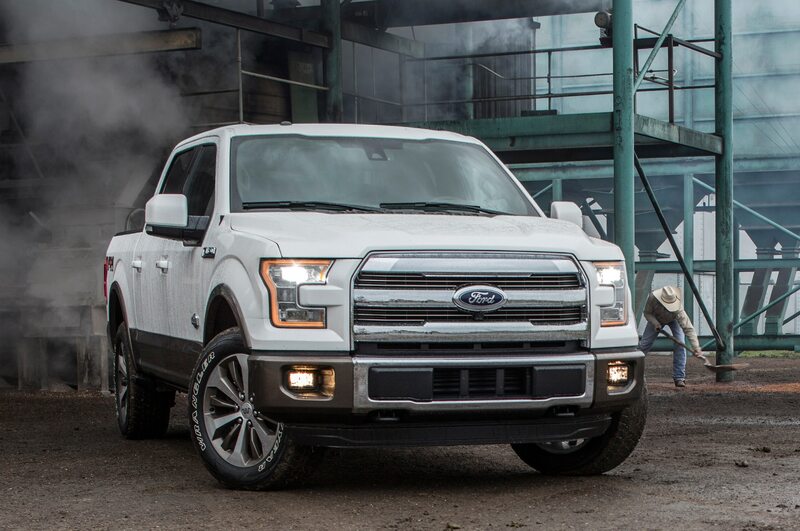 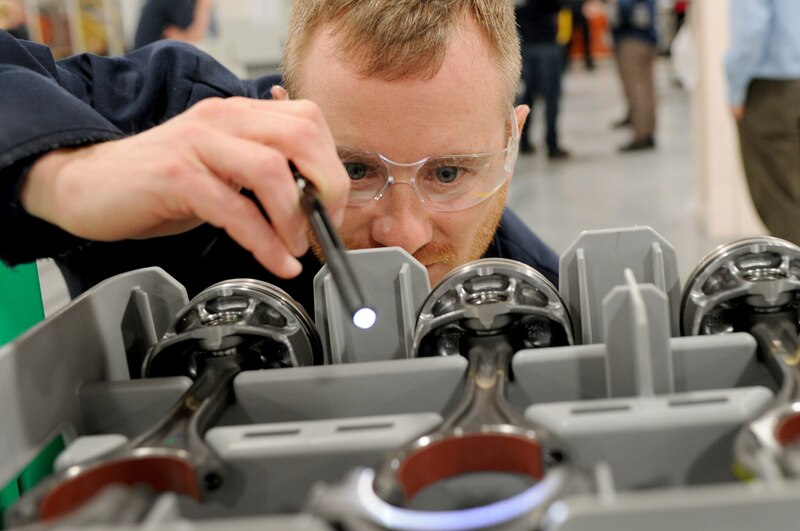 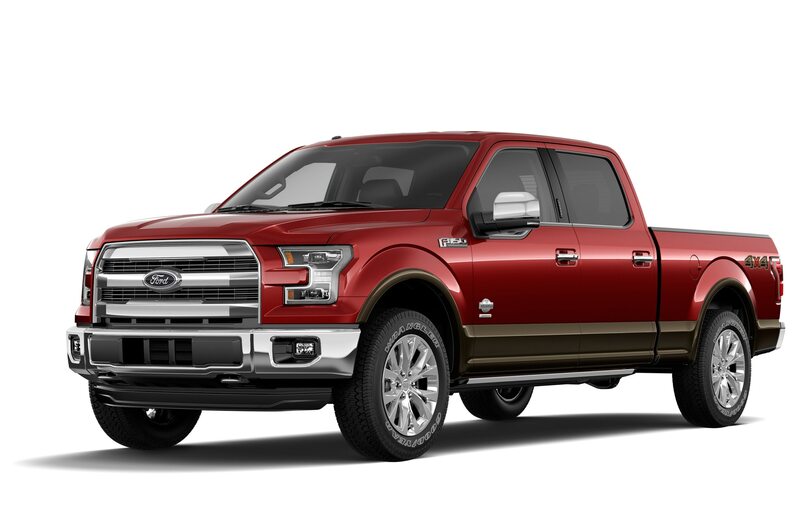 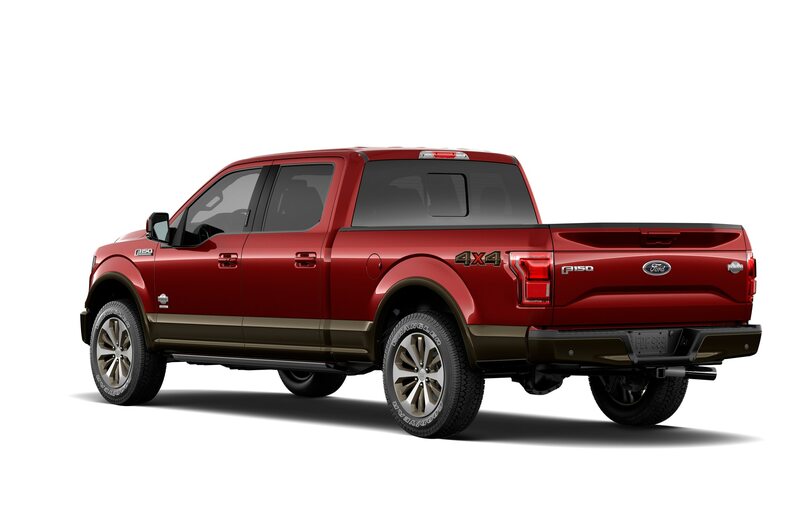 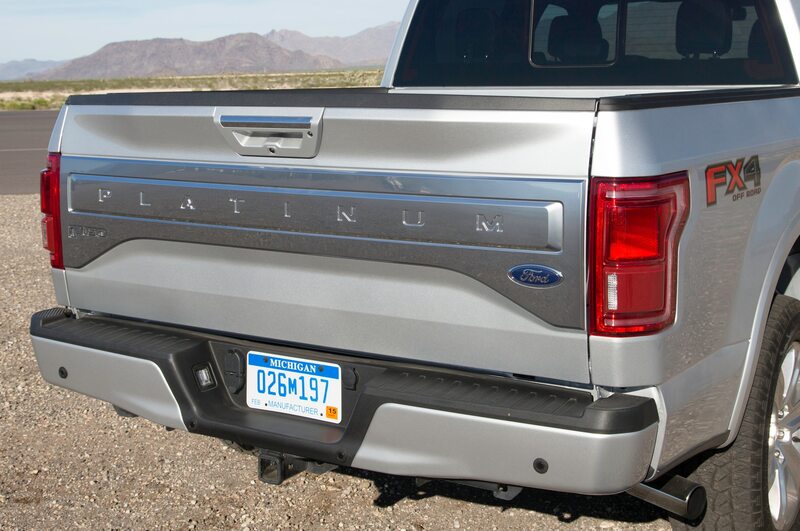 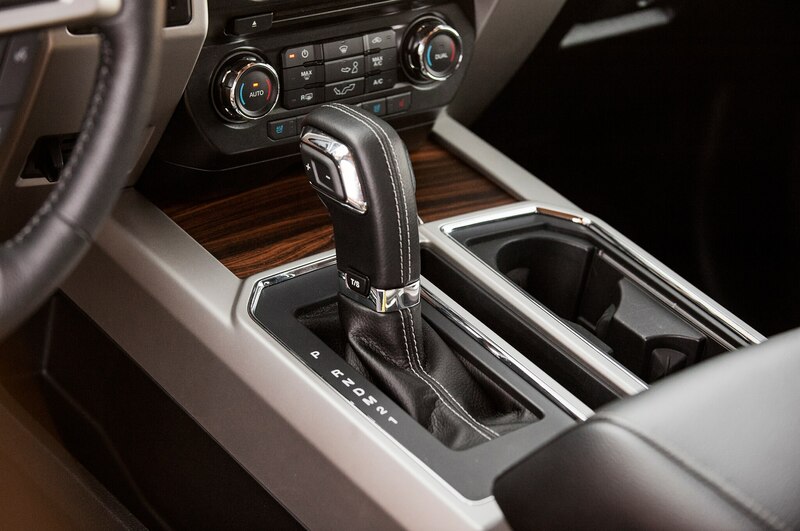 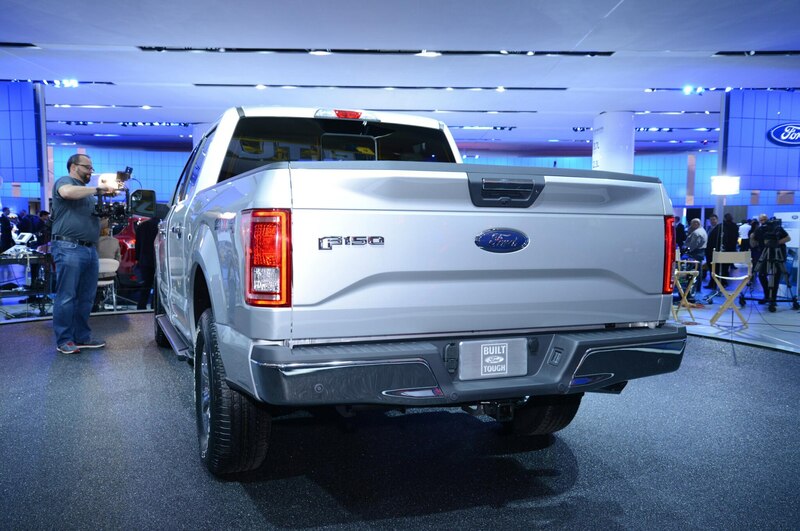 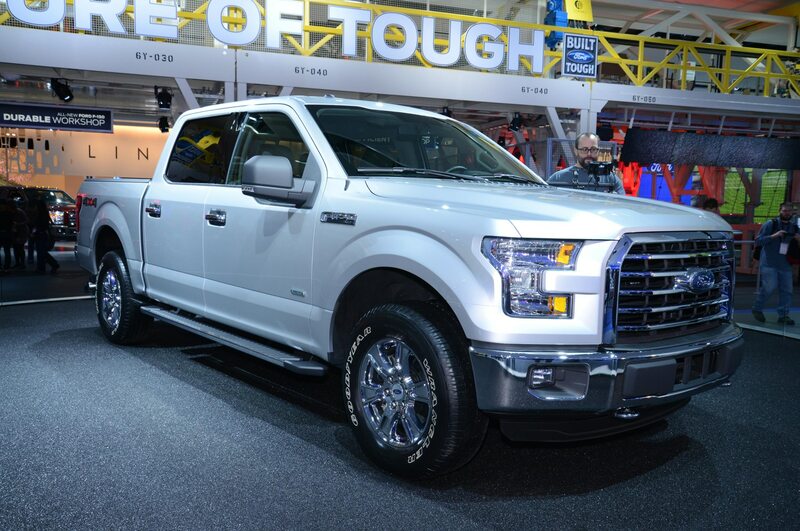 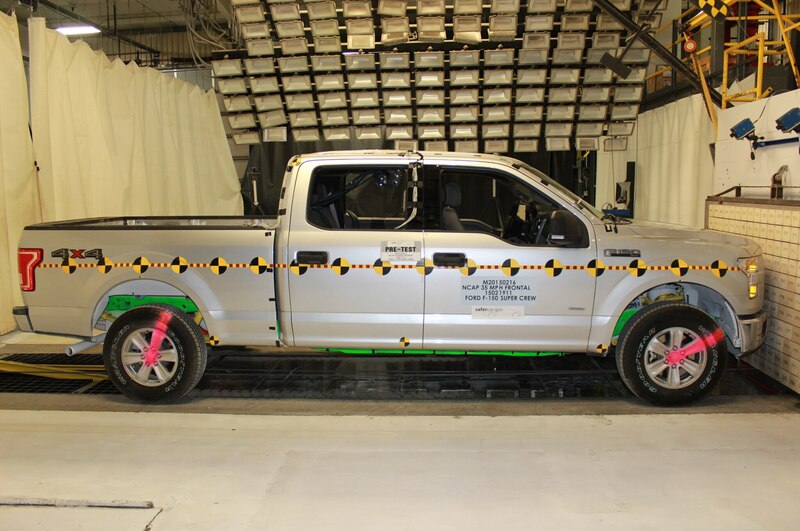 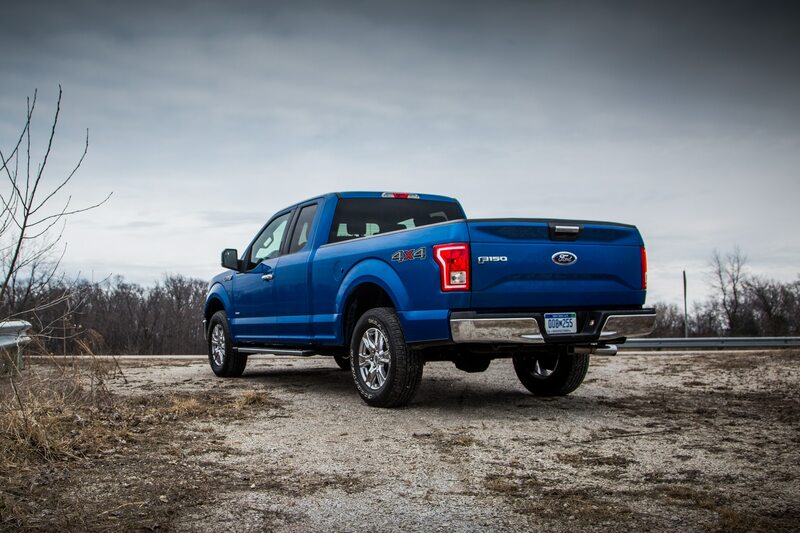 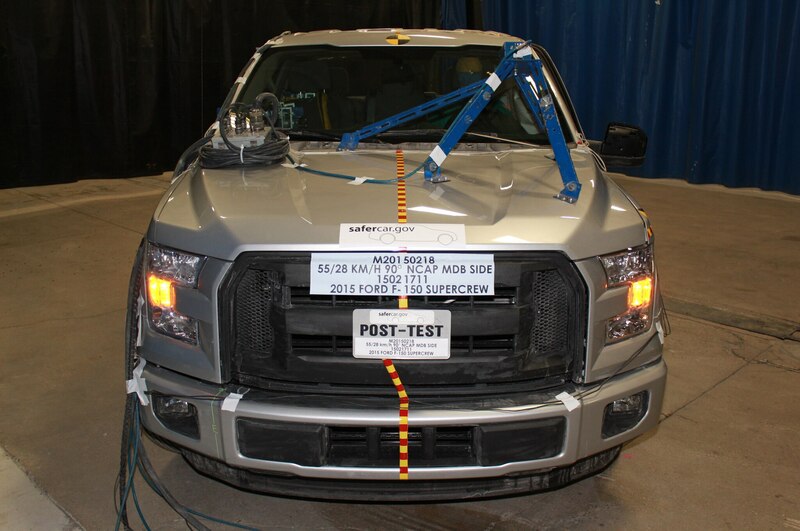 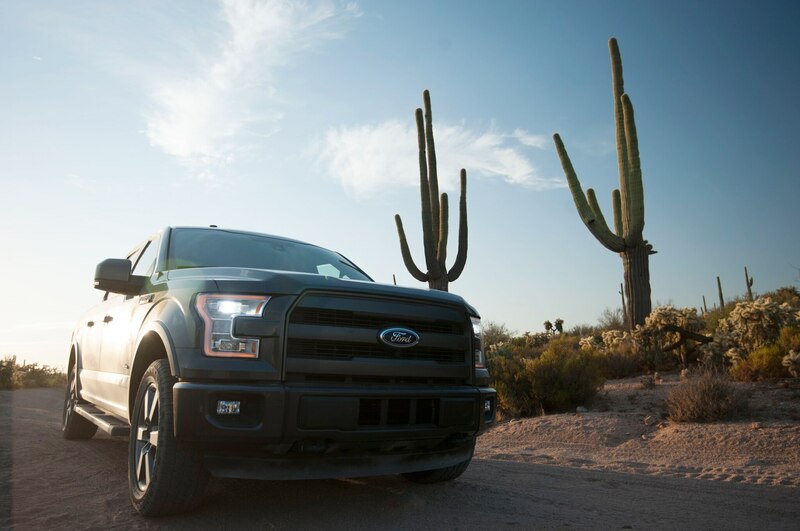 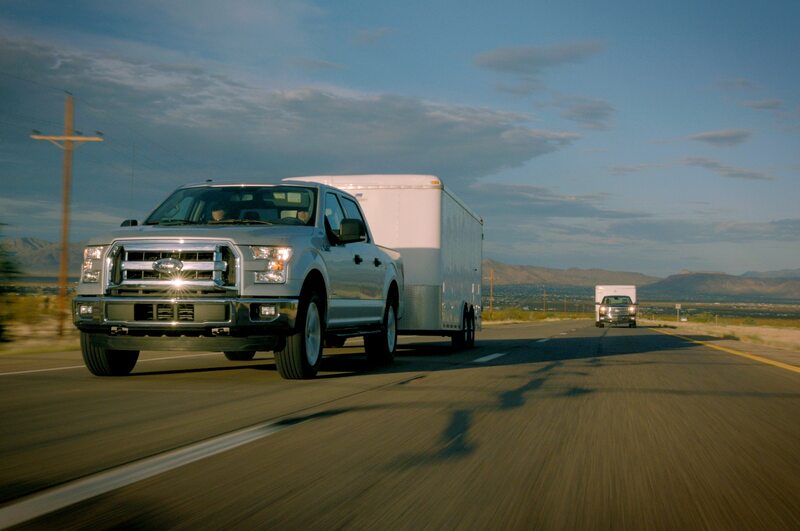 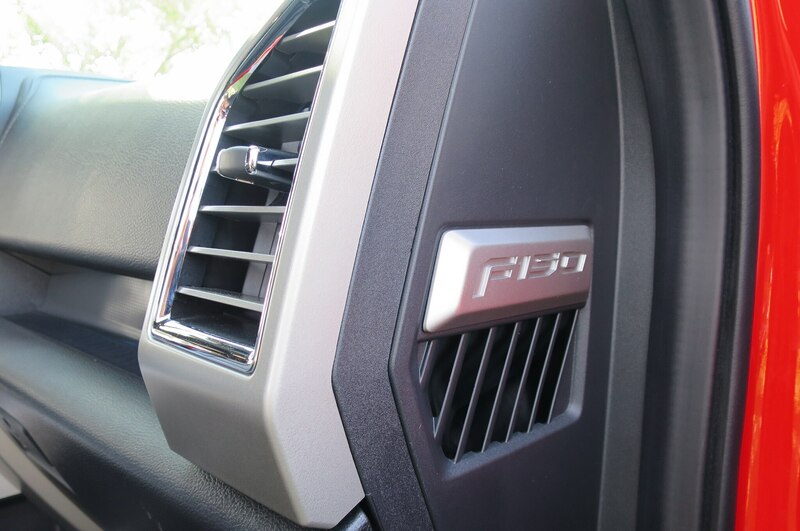 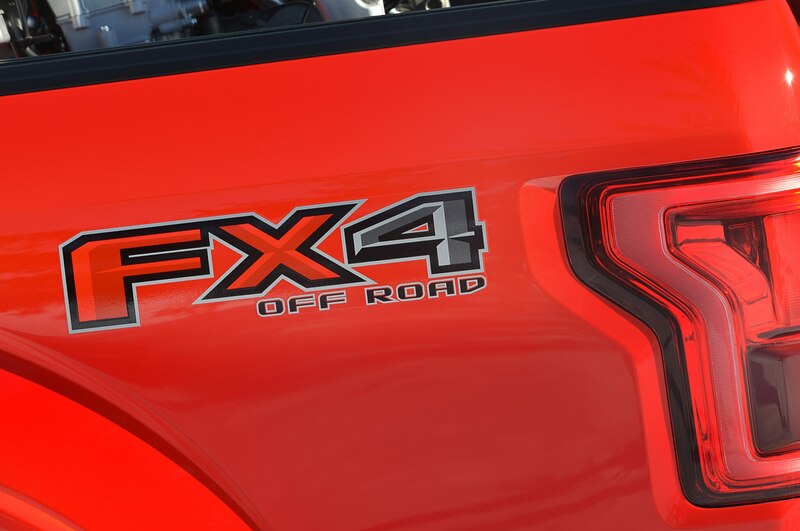 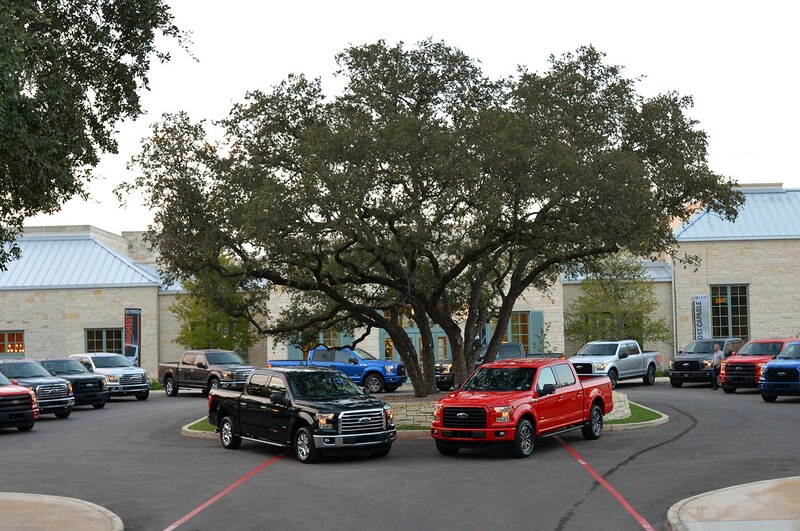 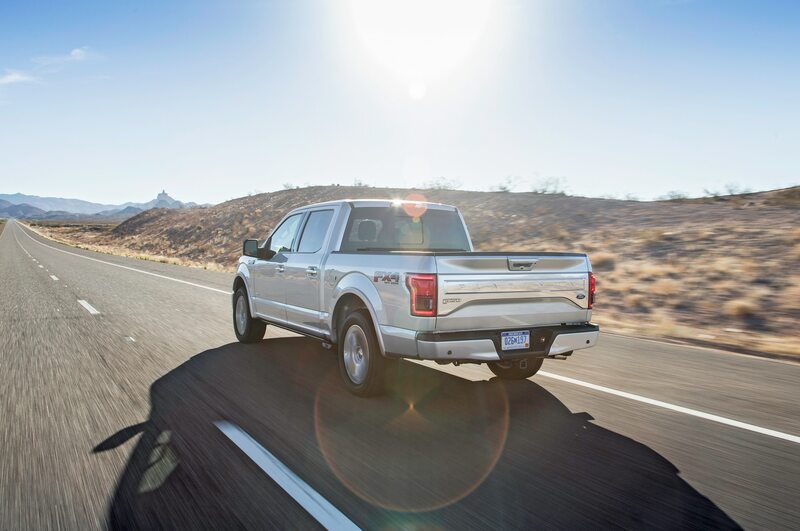 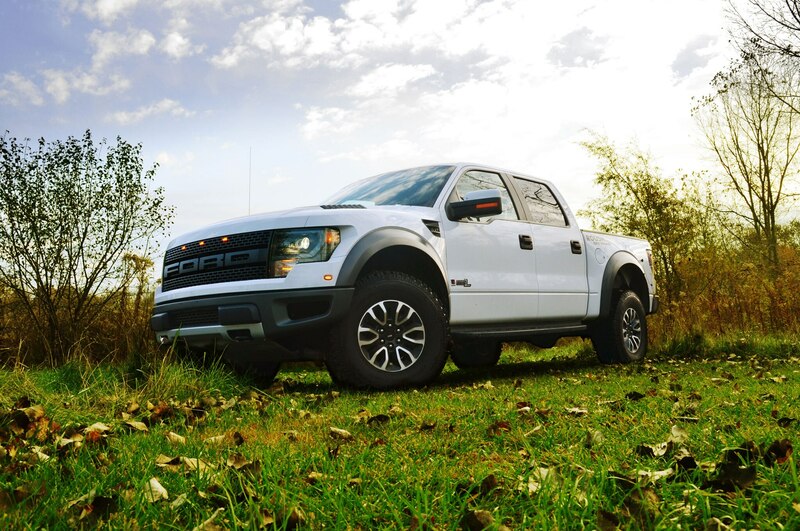 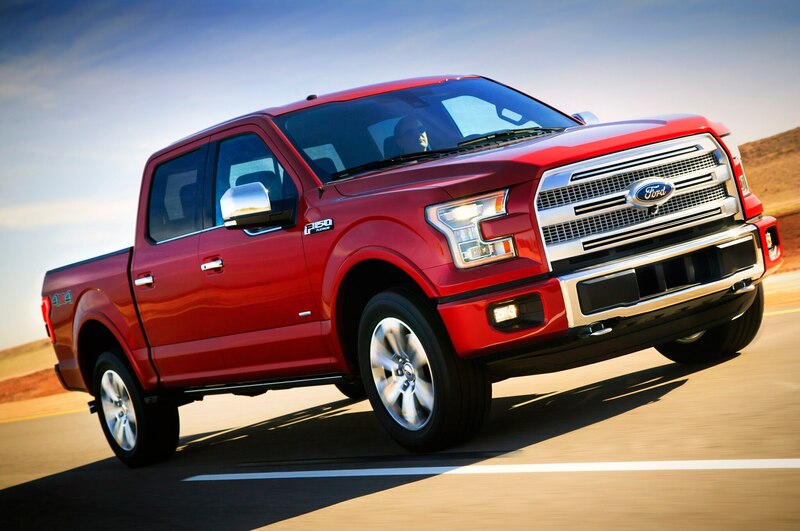 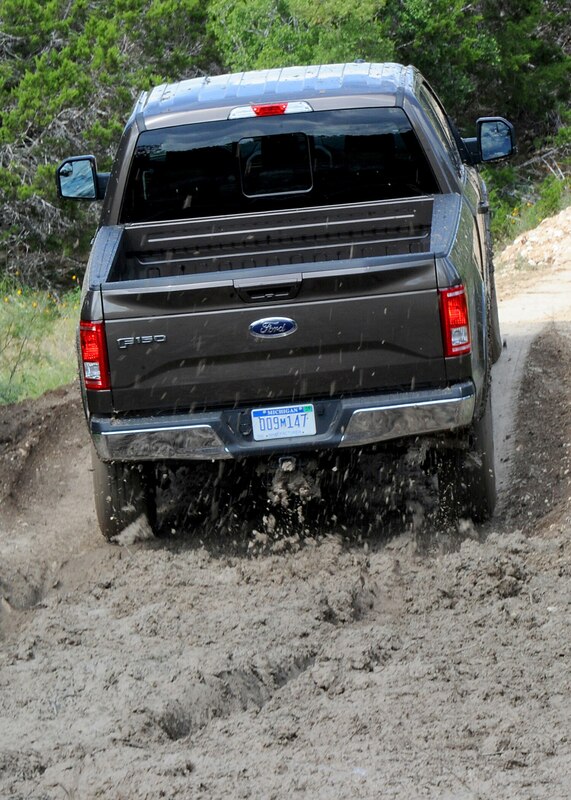 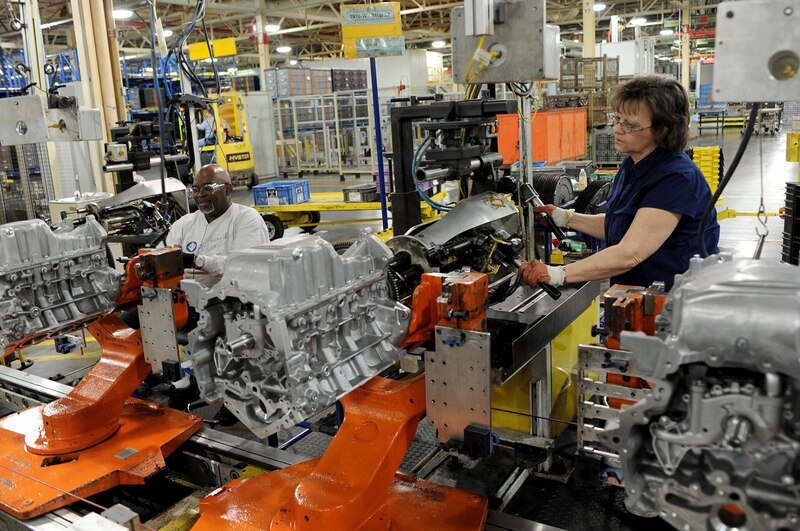 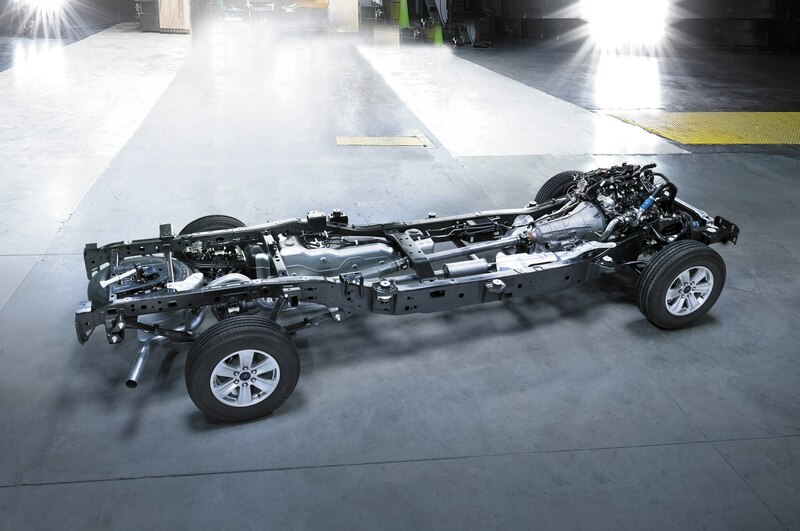 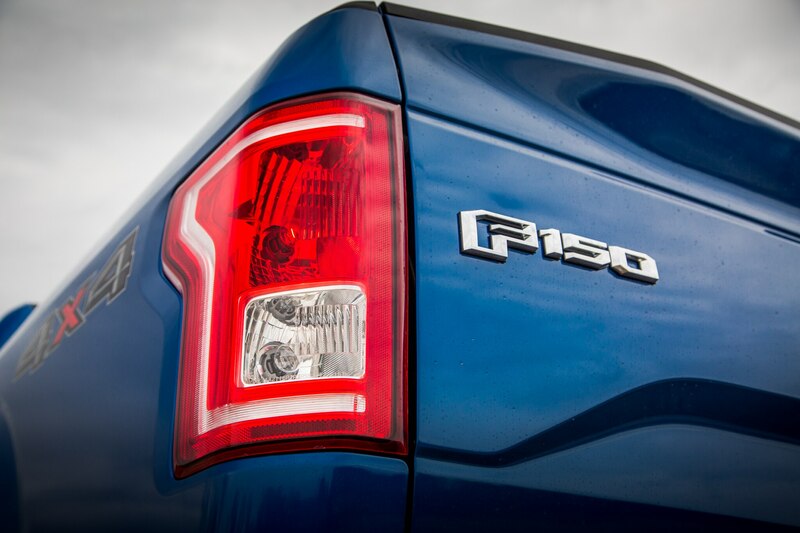 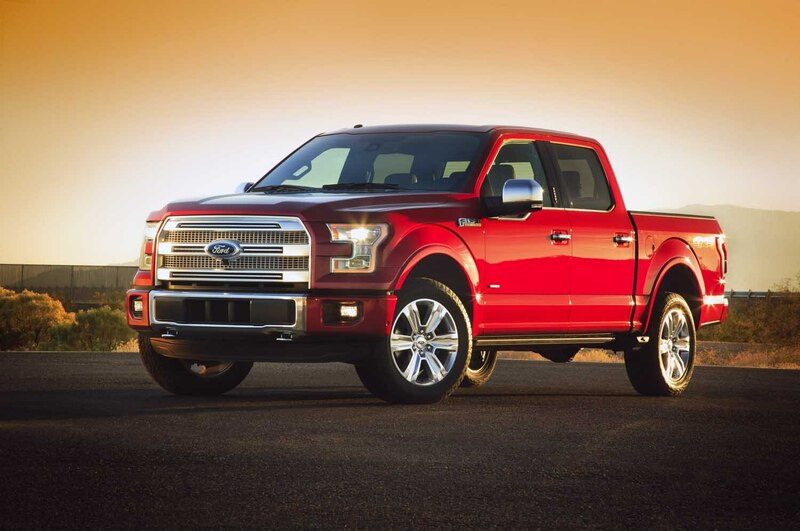 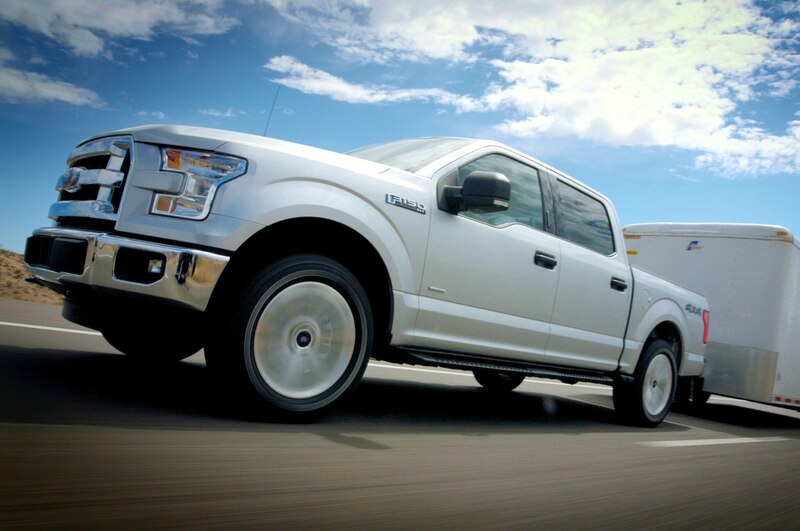 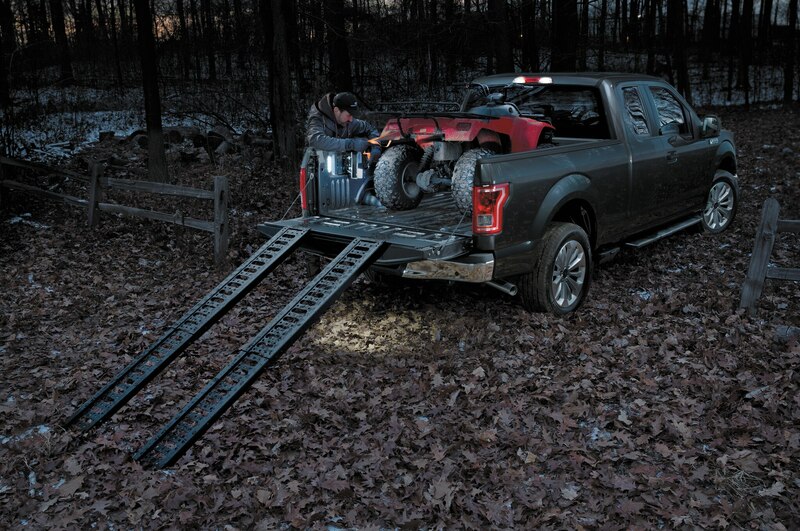 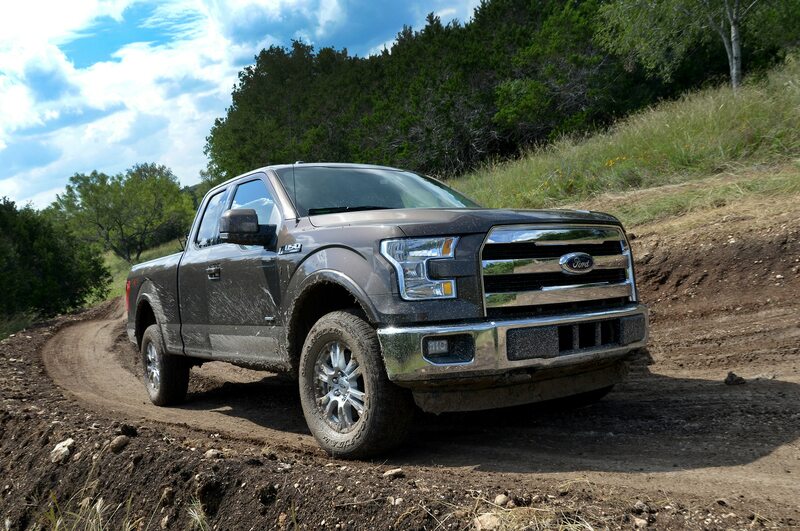 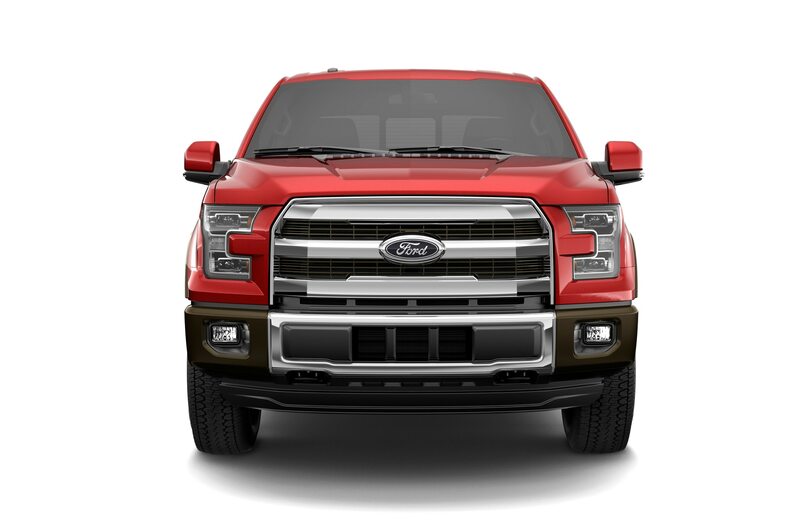 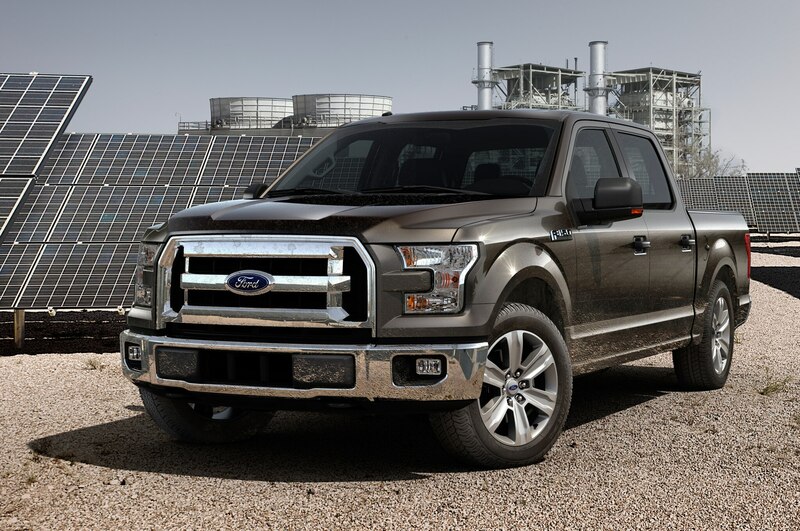 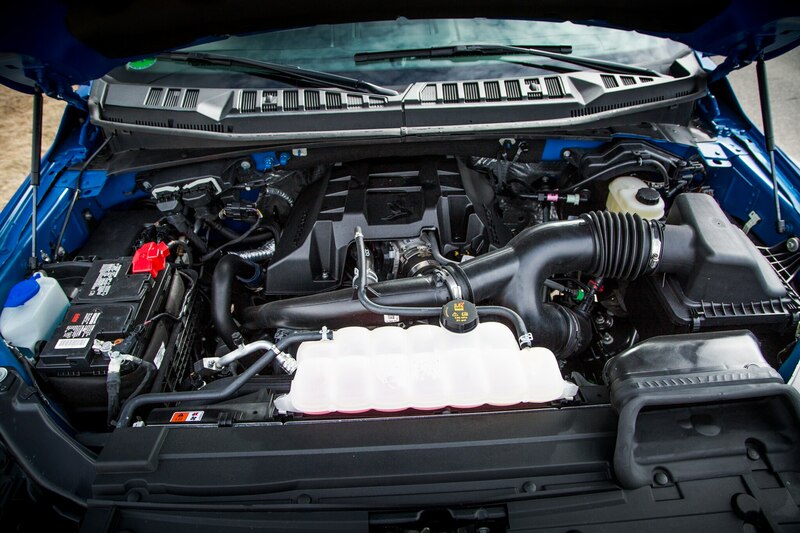 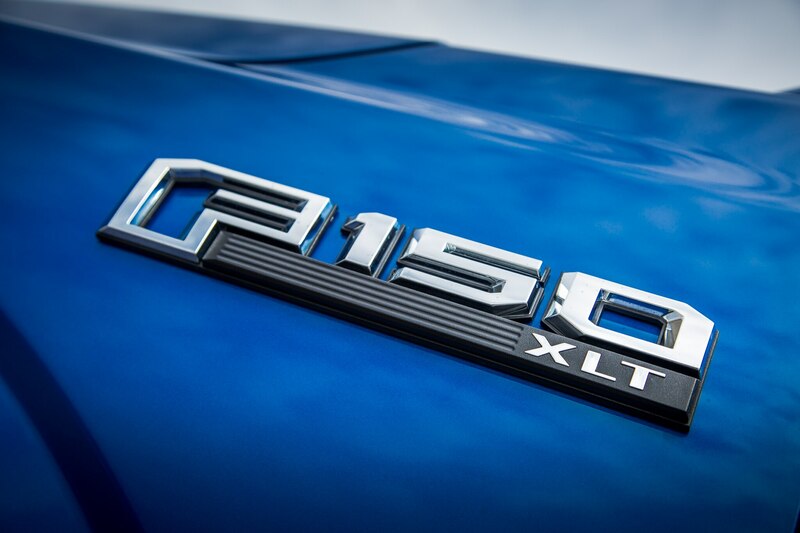 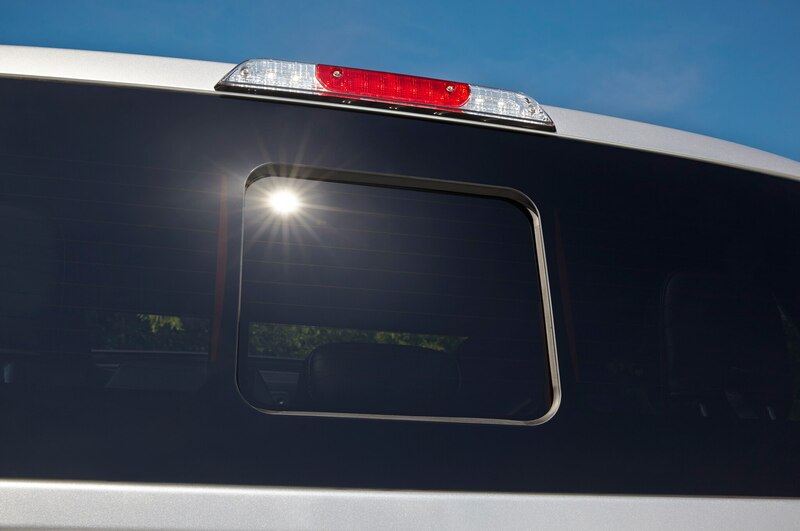 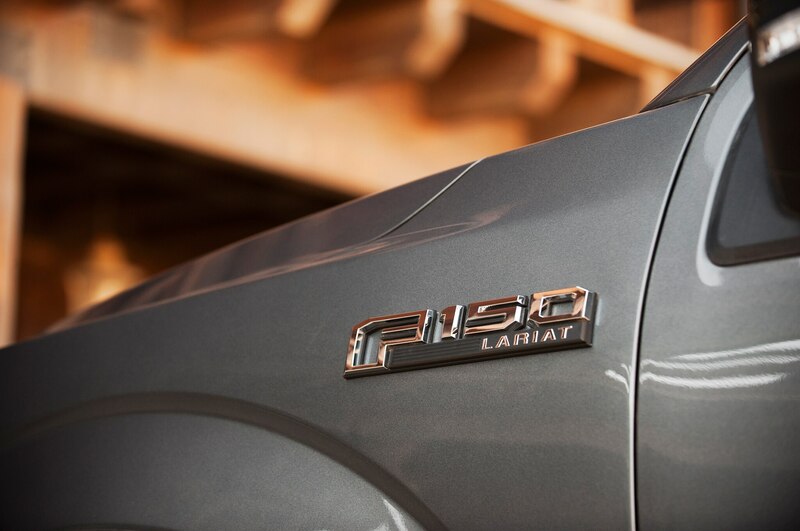 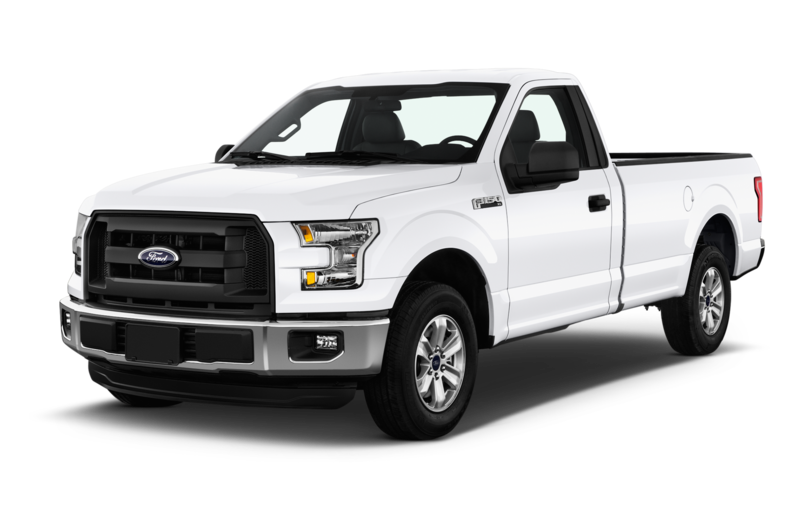 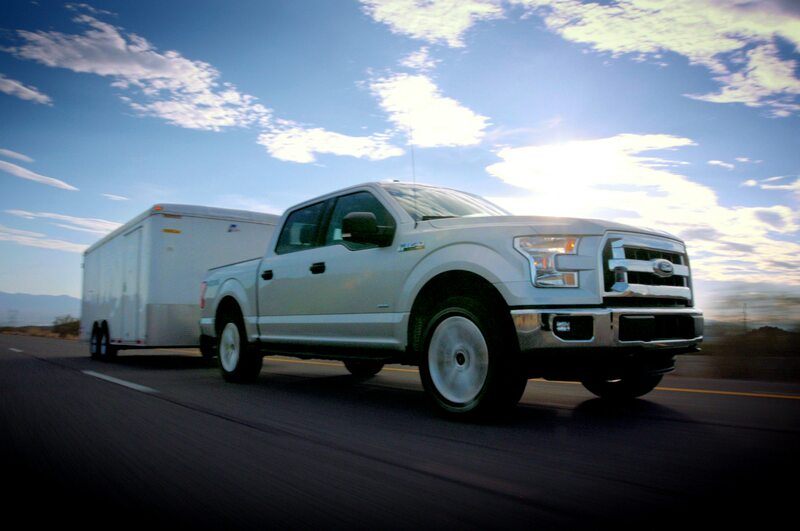 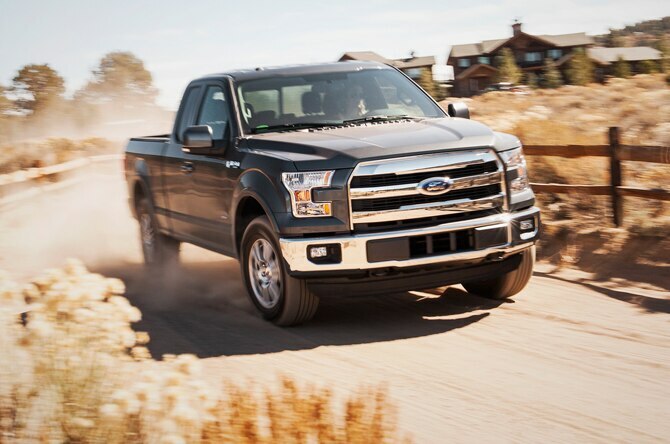 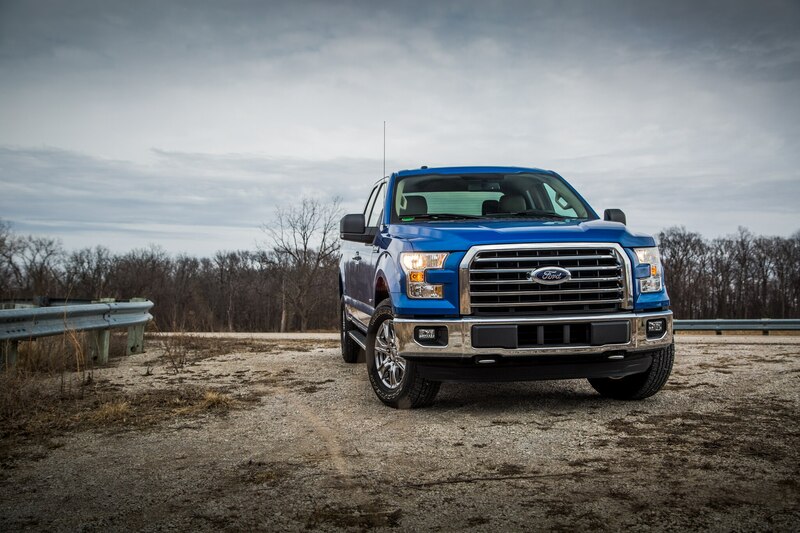 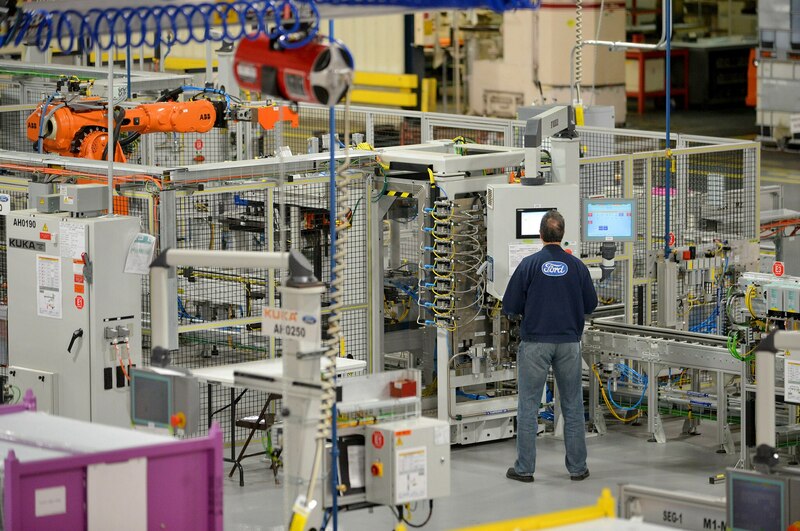 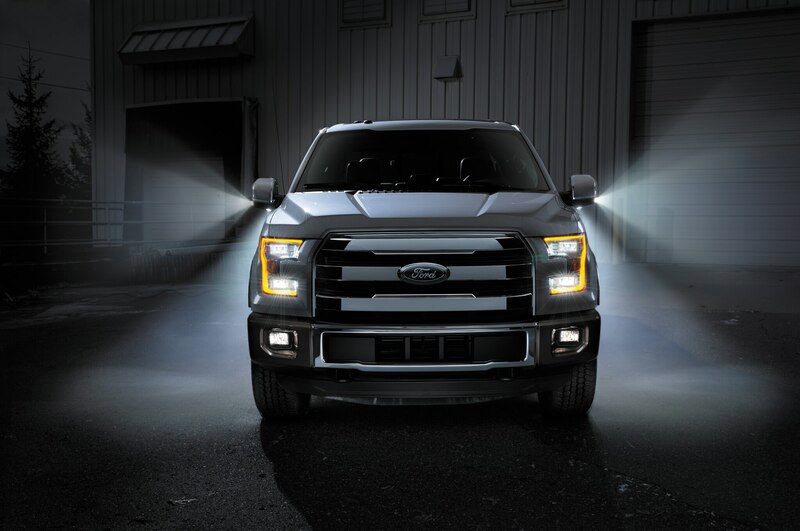 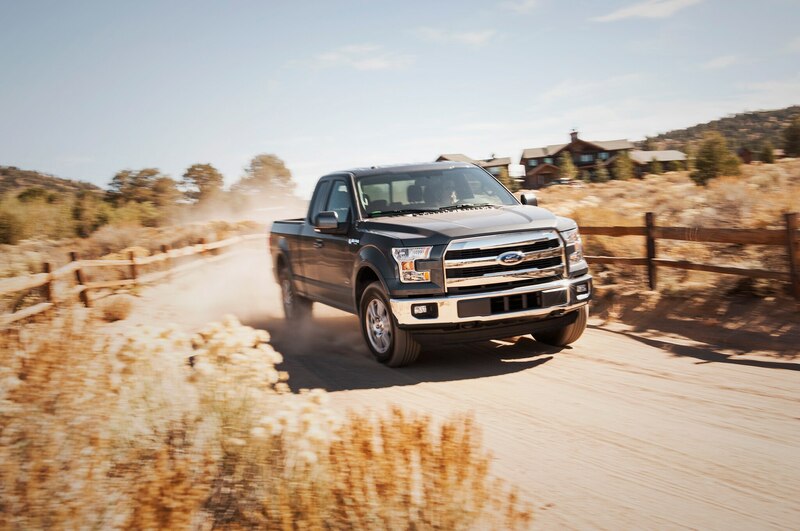 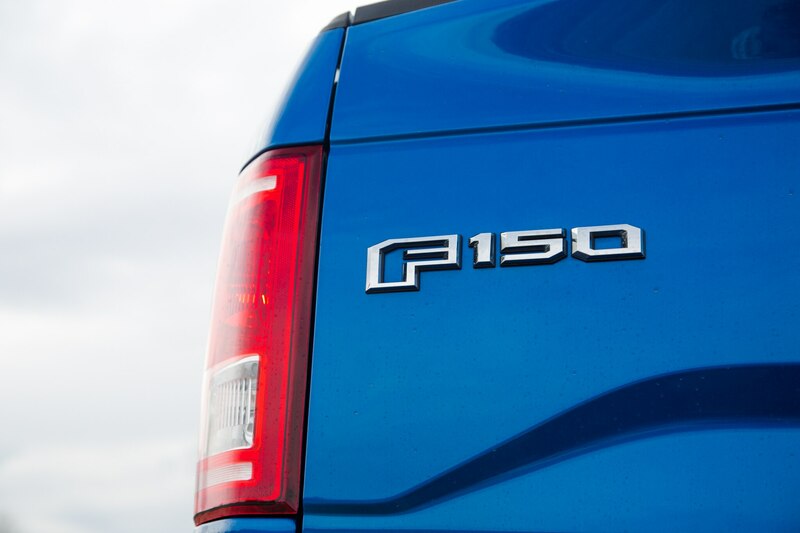 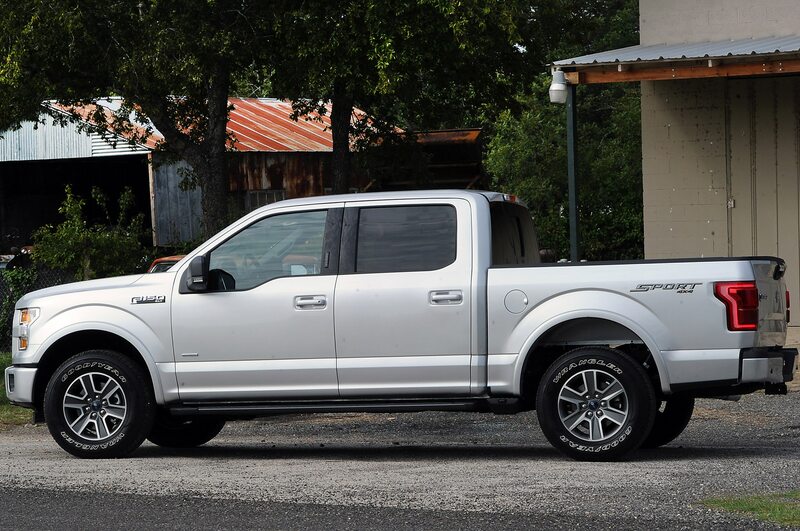 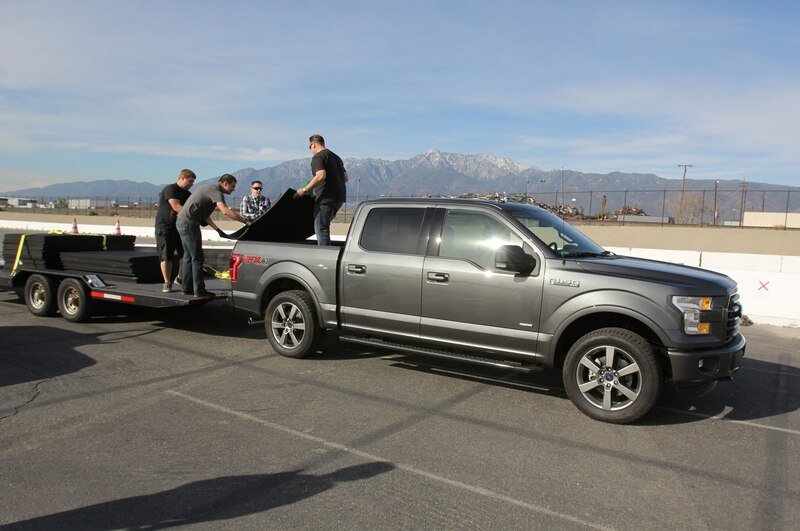 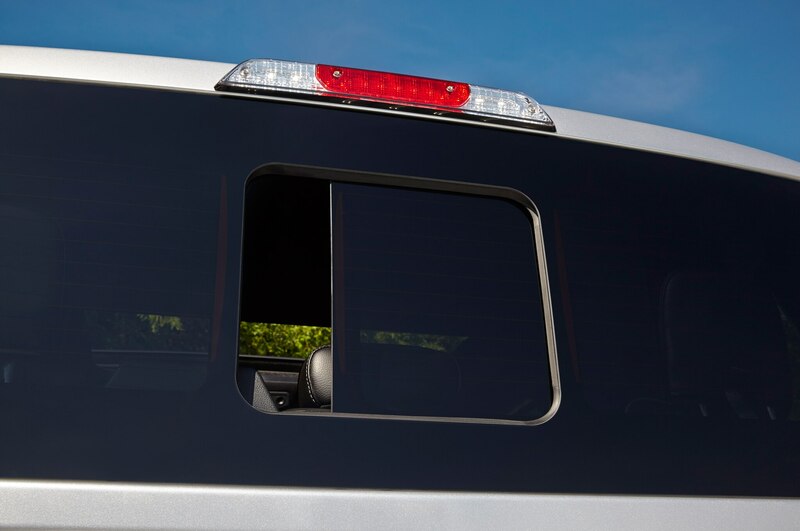 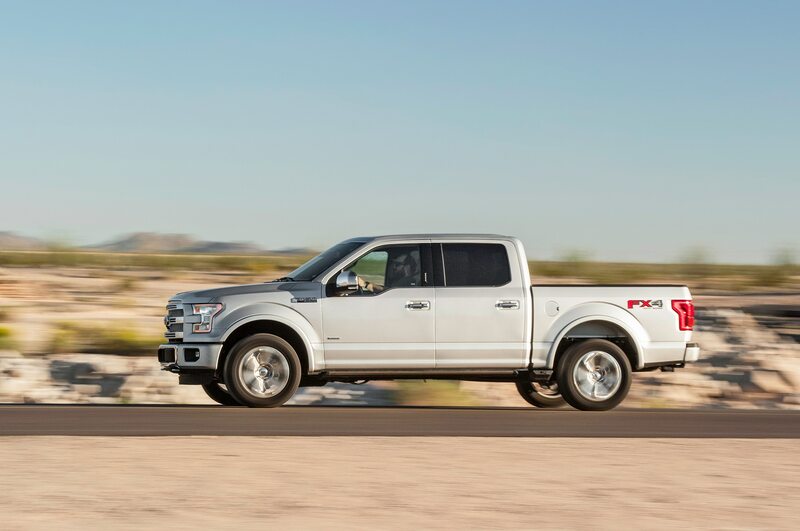 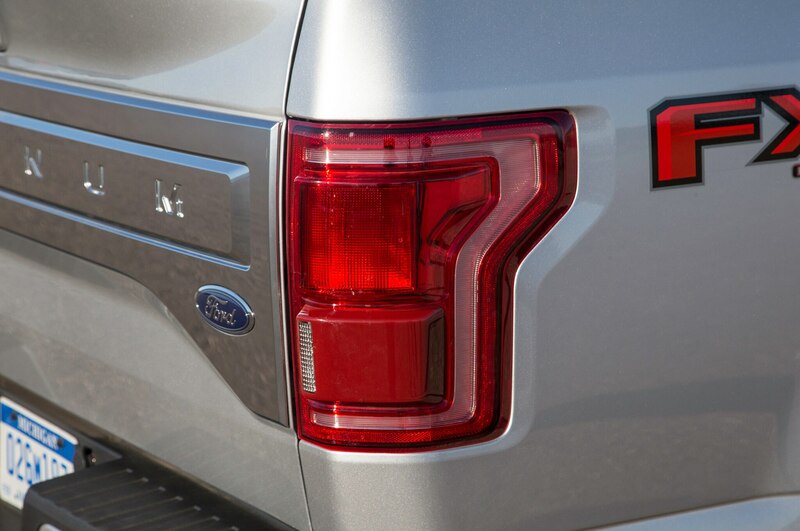 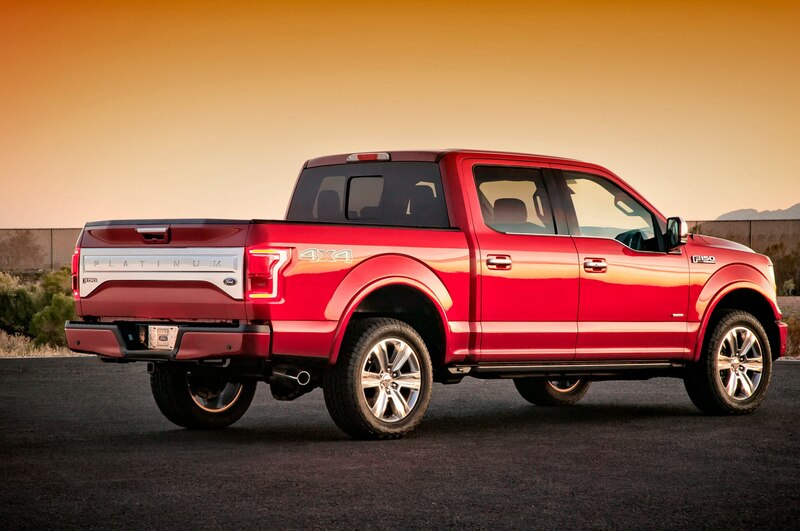 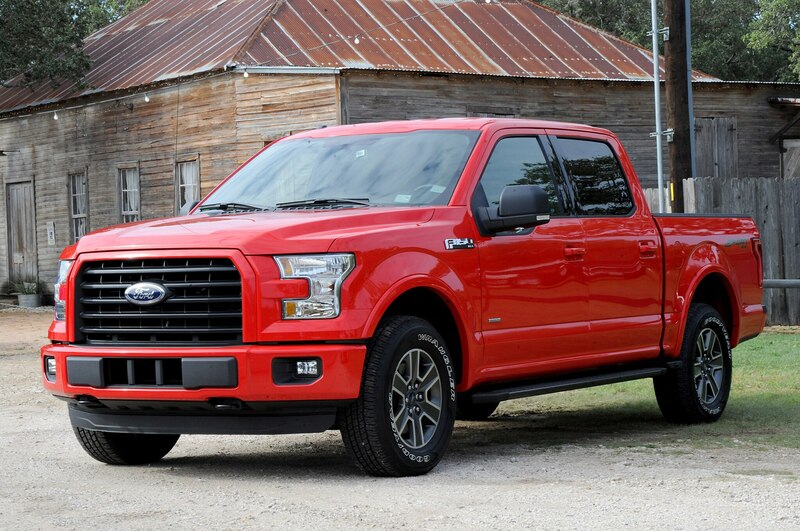 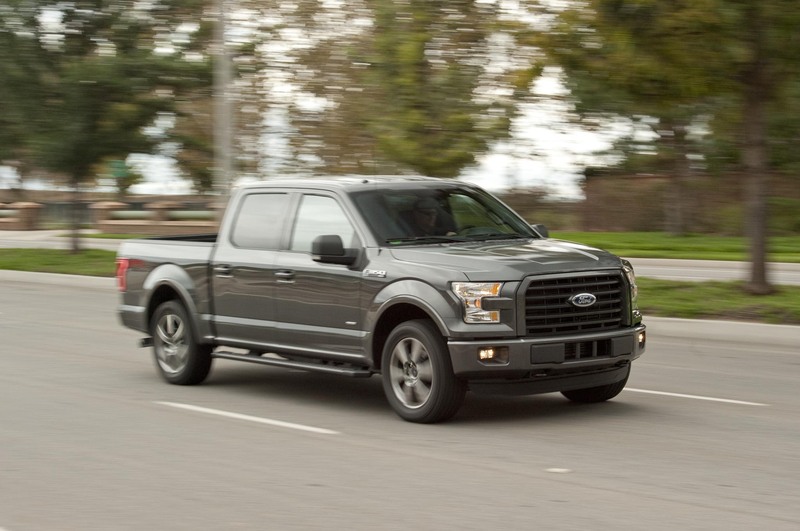 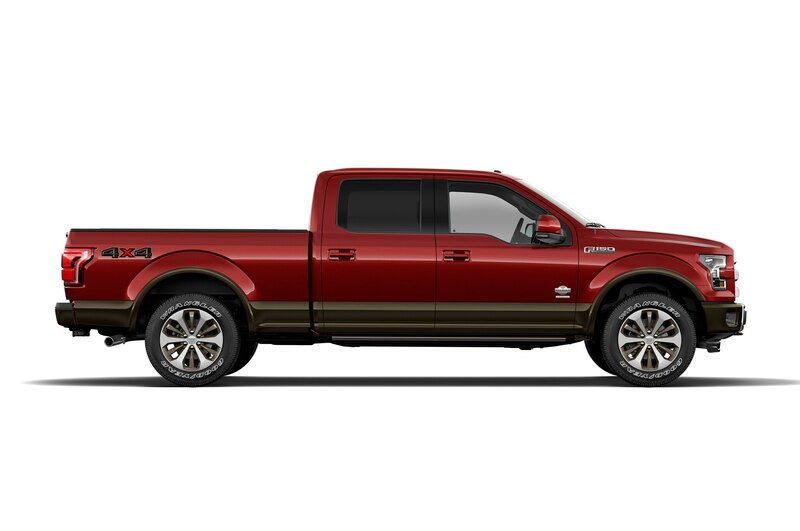 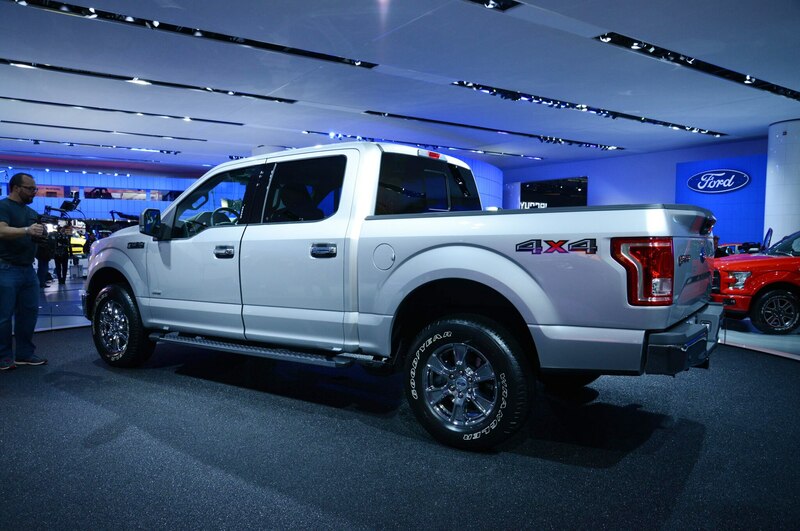 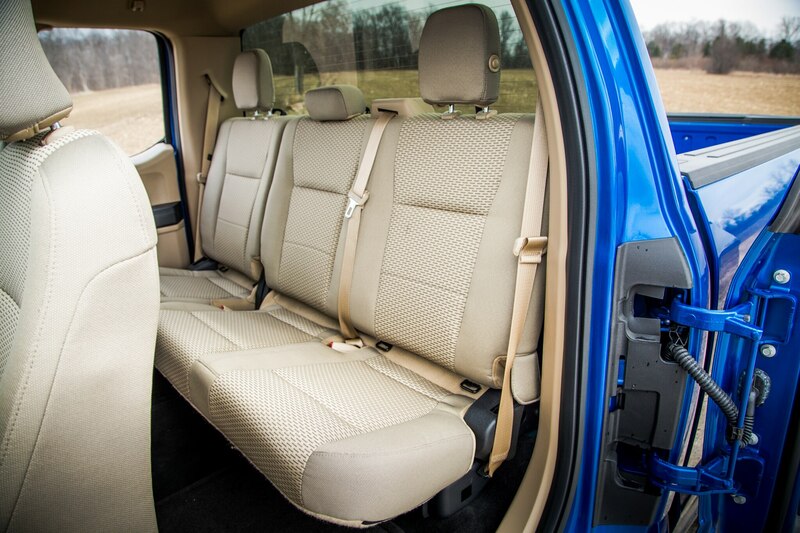 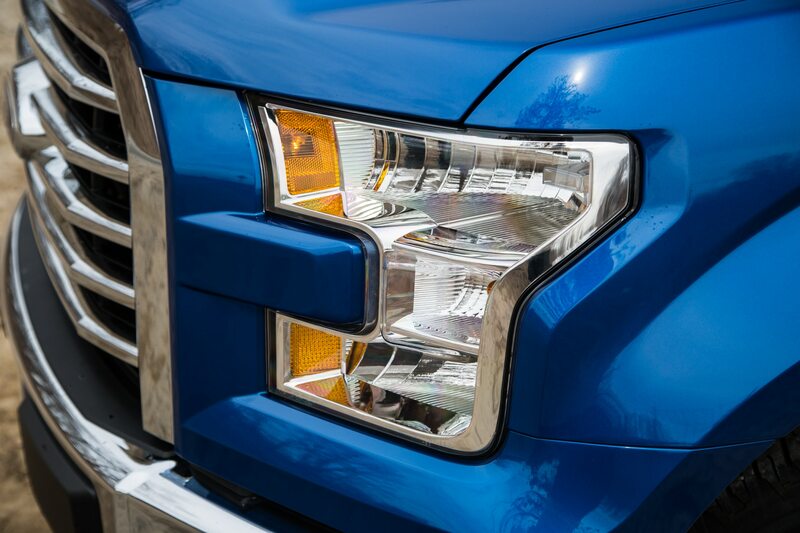 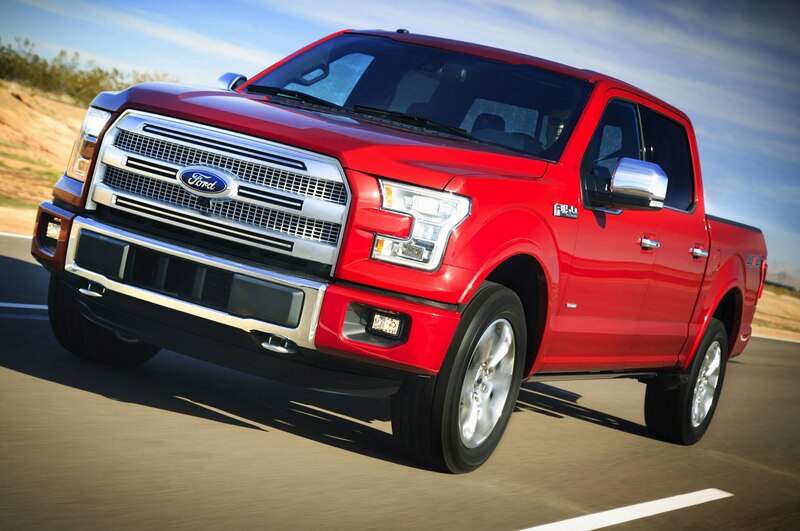 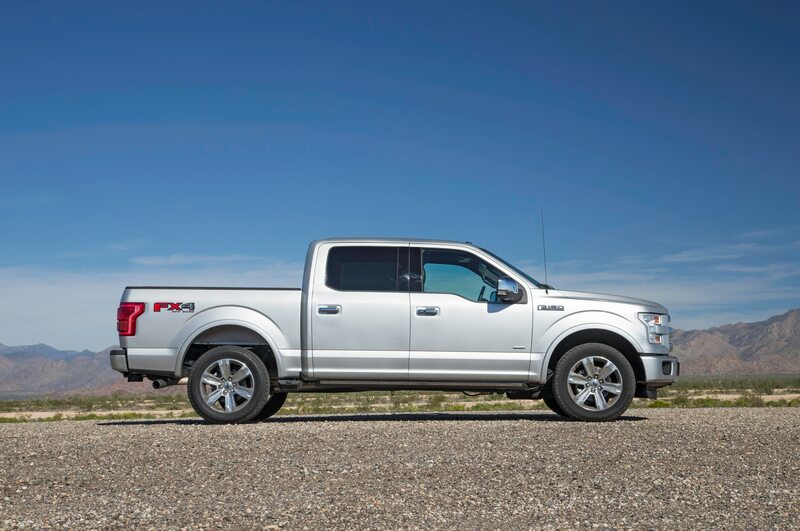 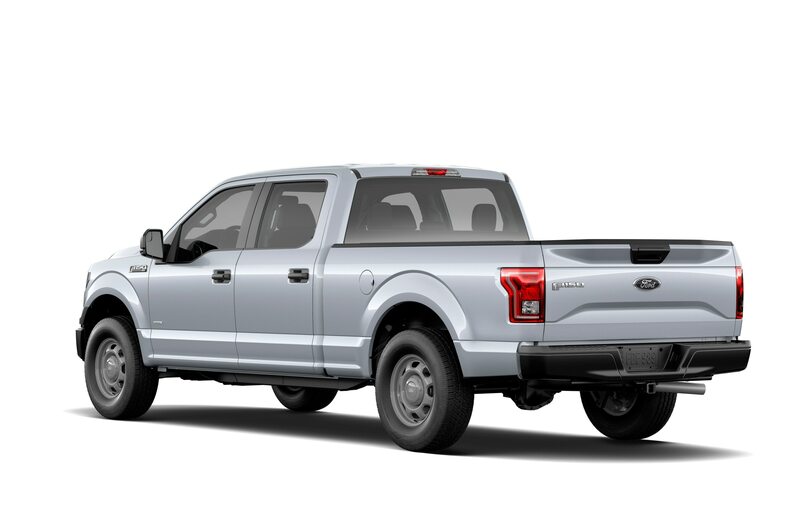 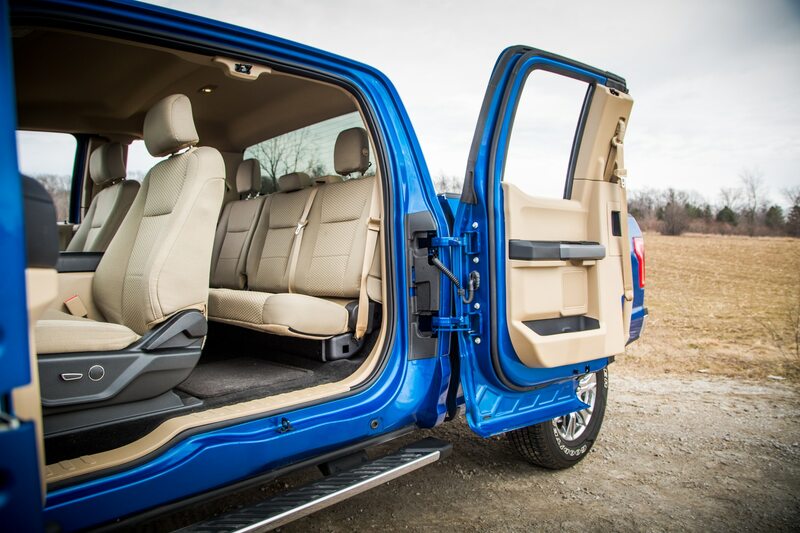 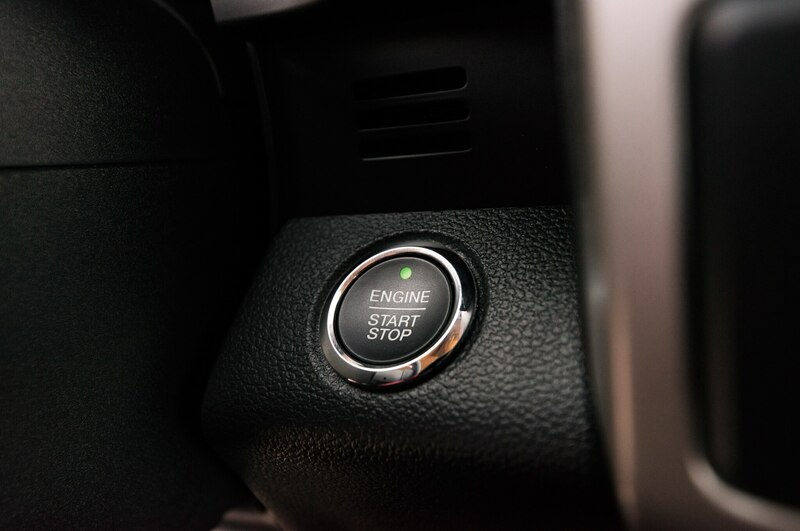 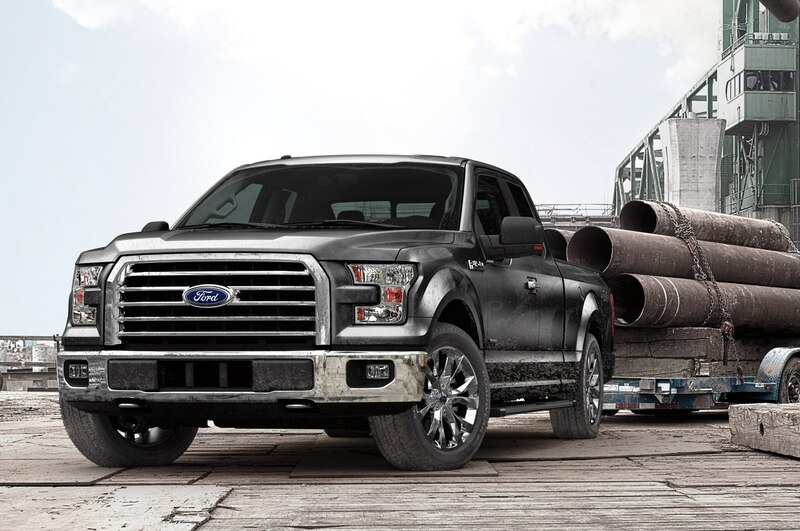 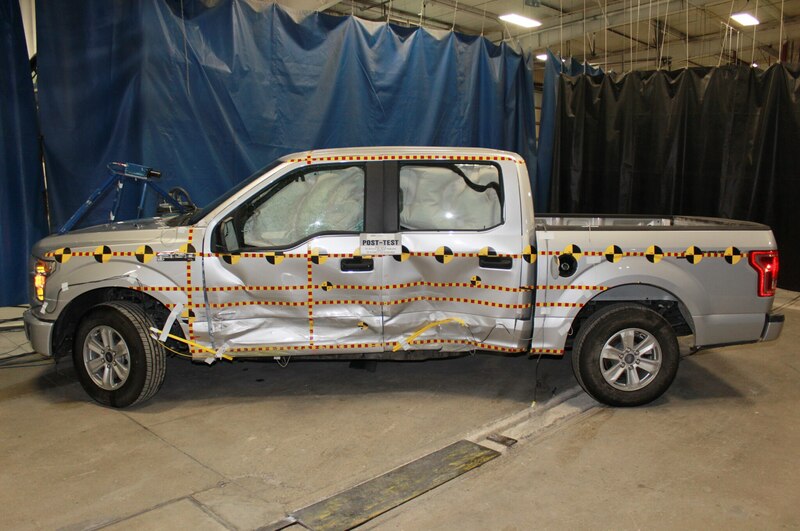 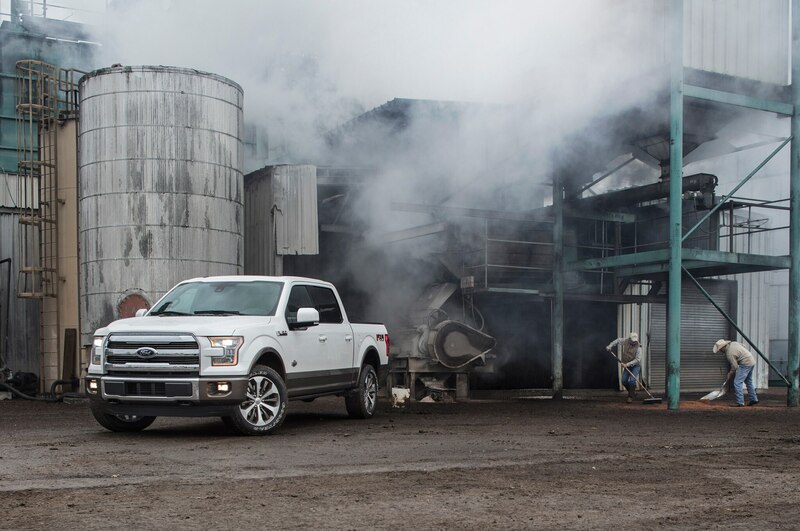 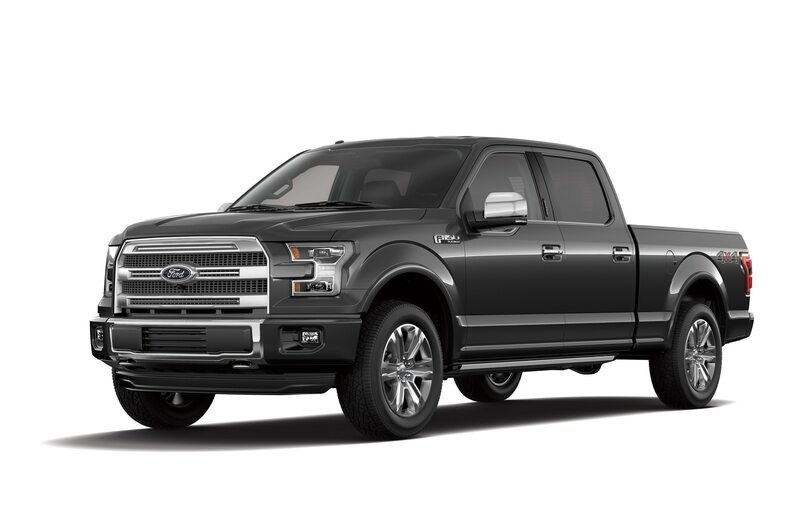 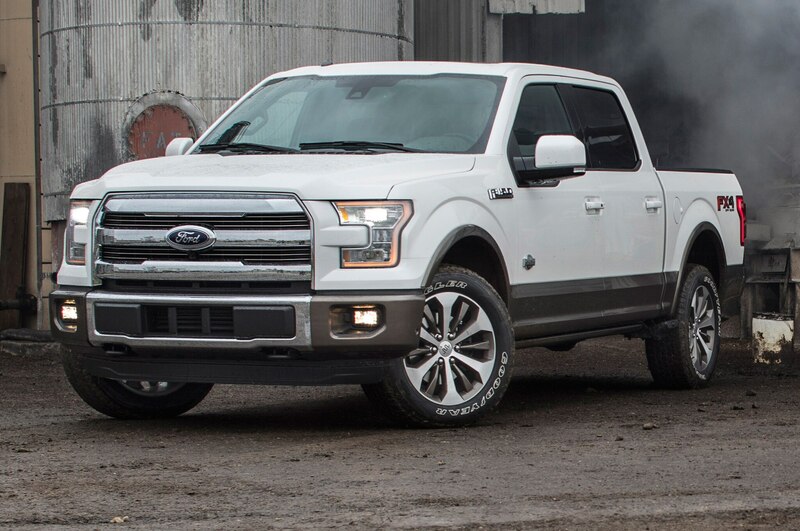 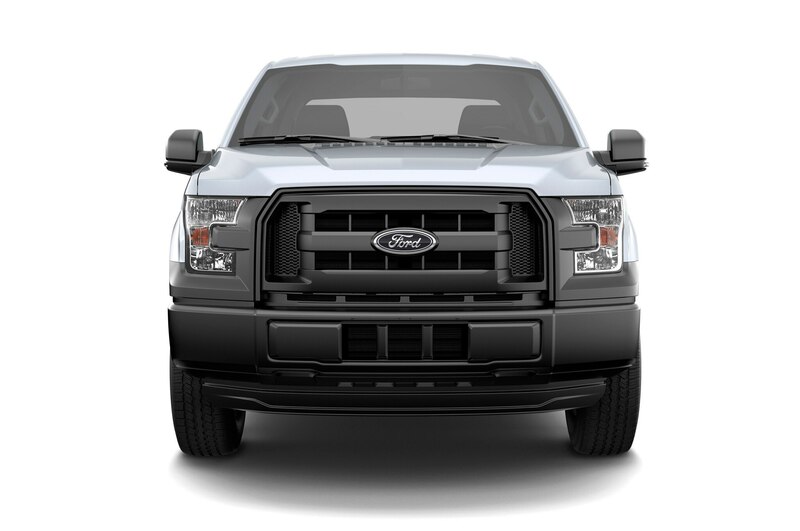 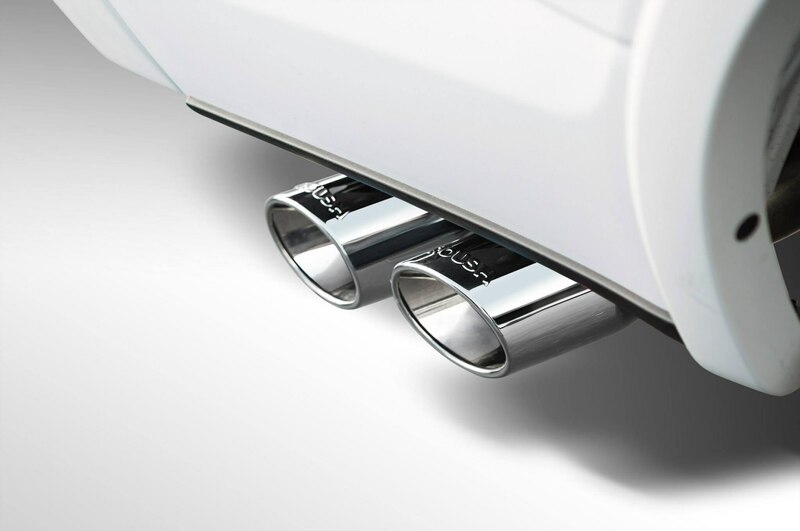 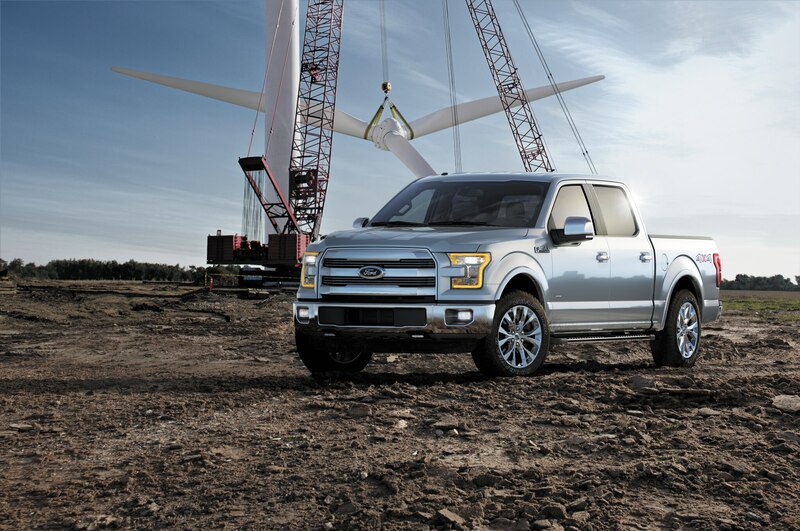 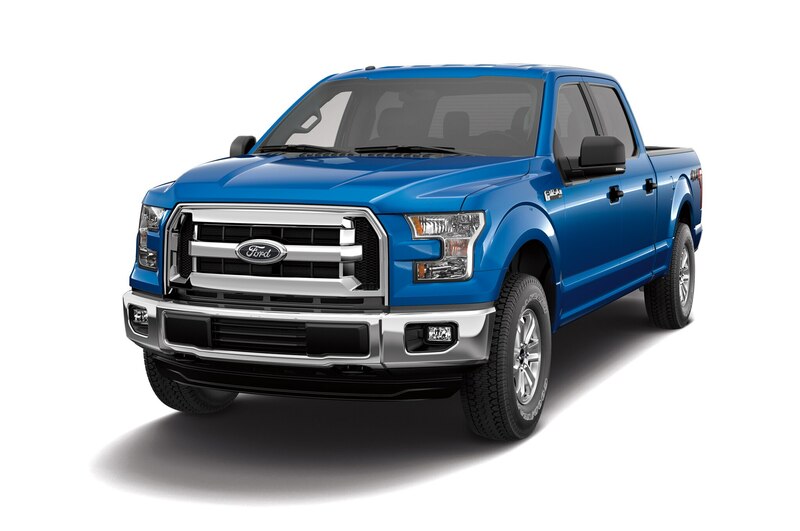 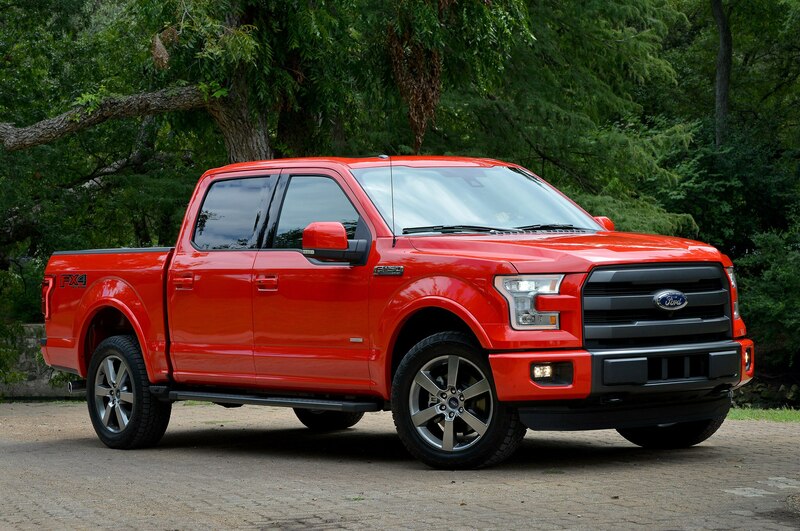 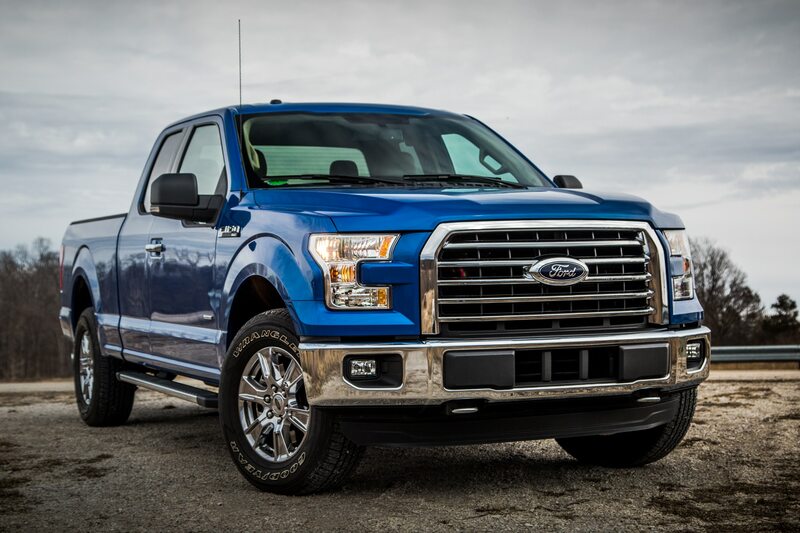 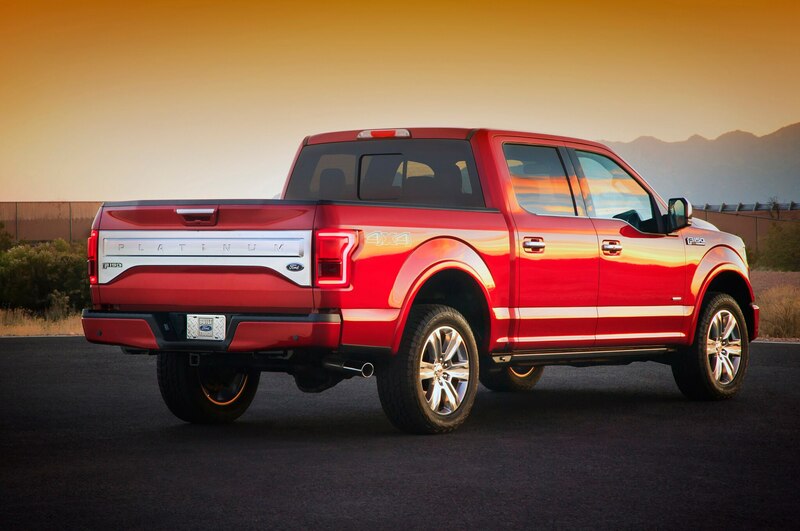 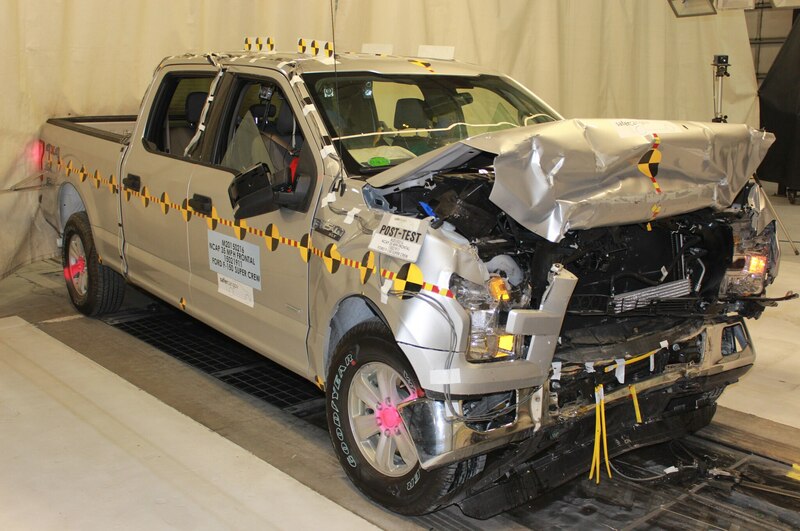 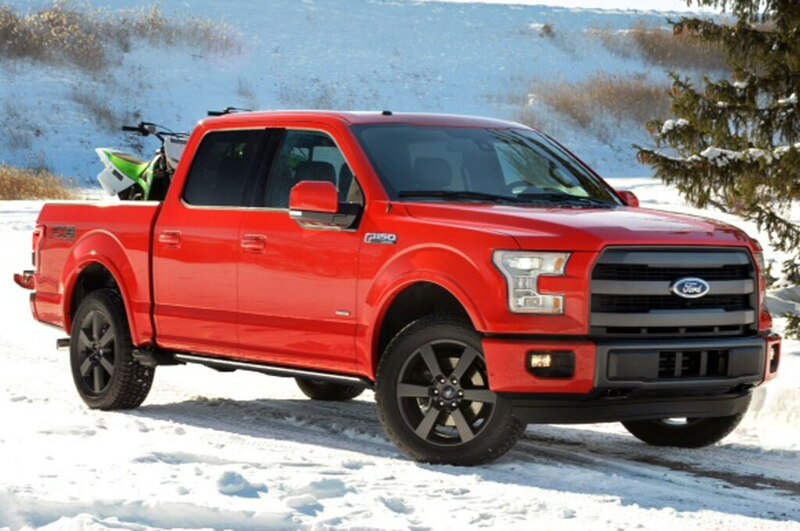 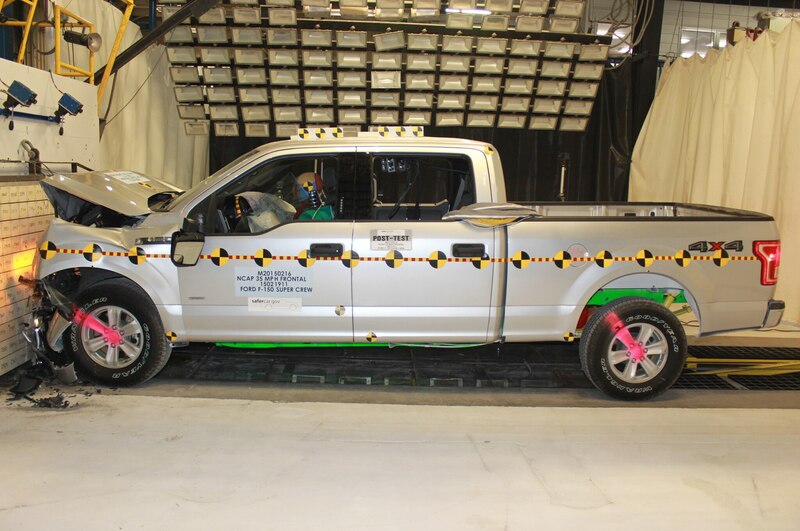 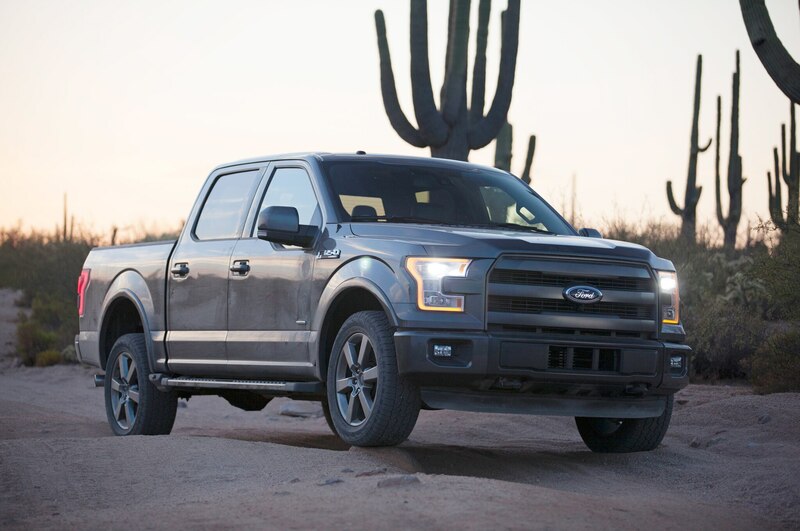 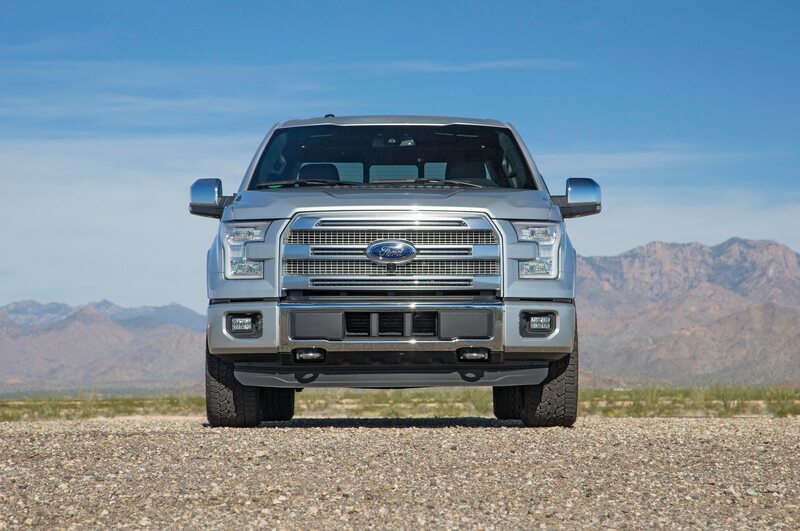 We have a deep appreciation of the technology behind the 2015 Ford F-150’s aluminum construction and the way the diet allows for smaller, more efficient engines. 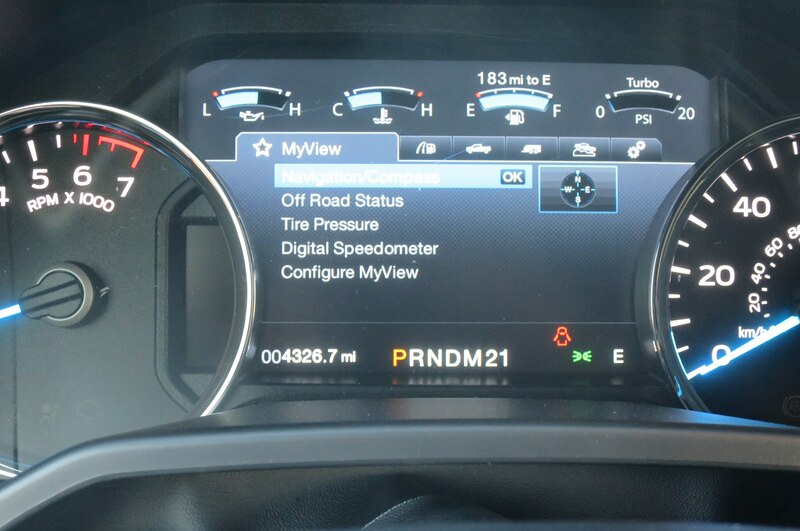 But we’re disappointed in the conservative execution. 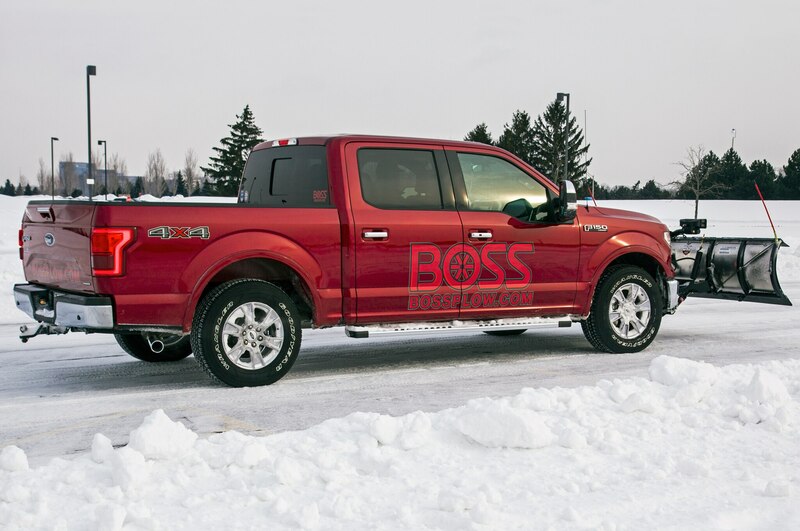 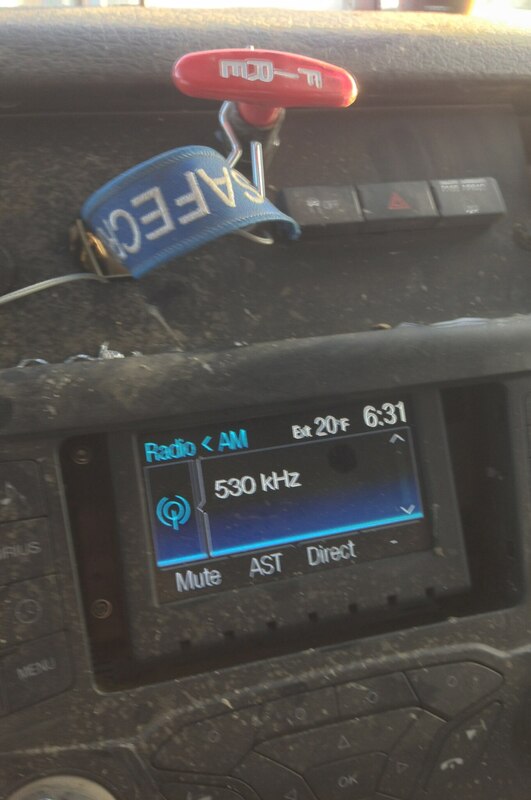 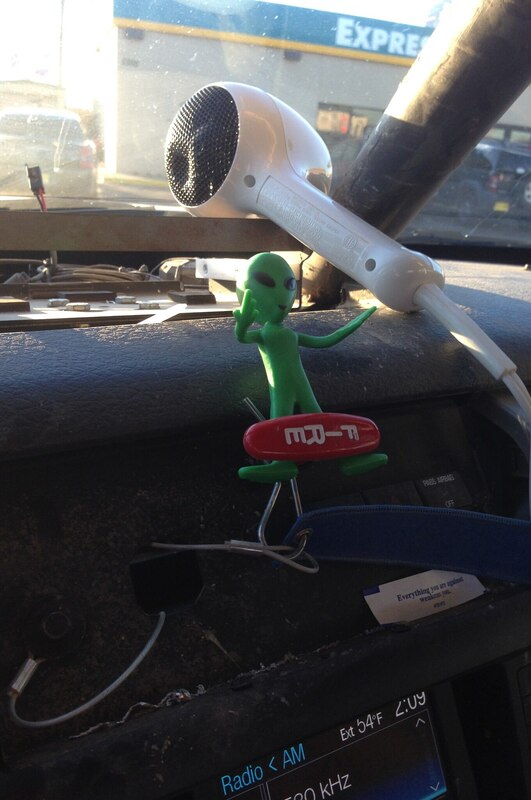 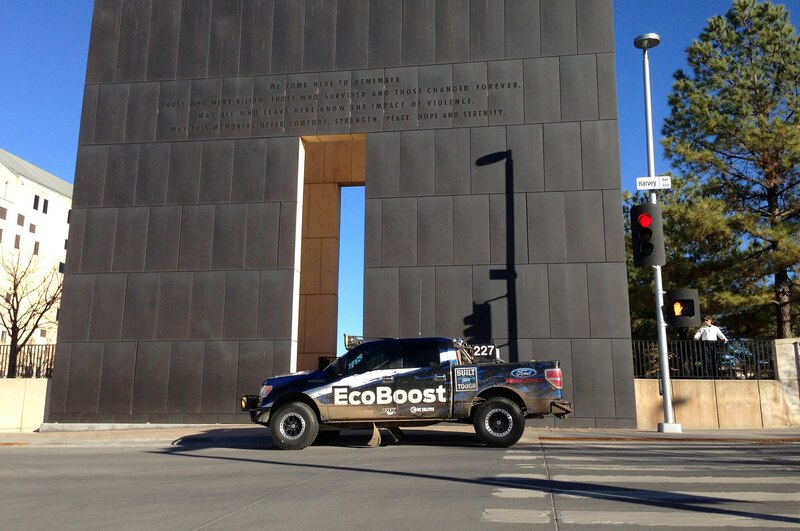 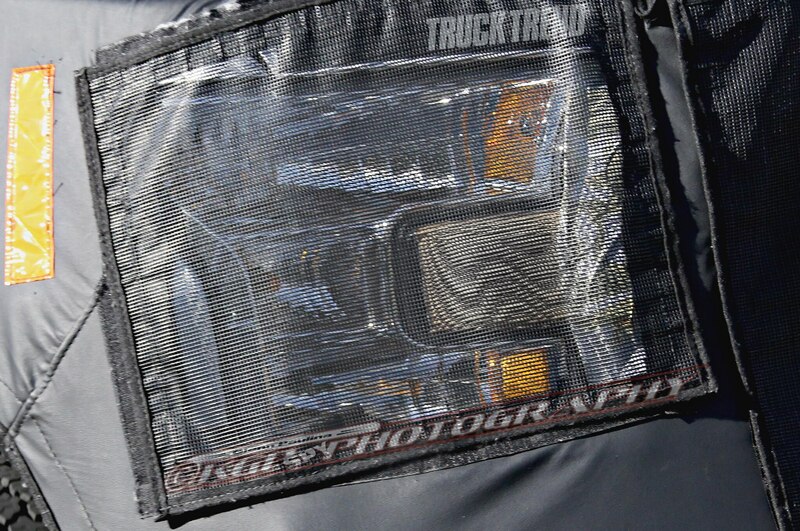 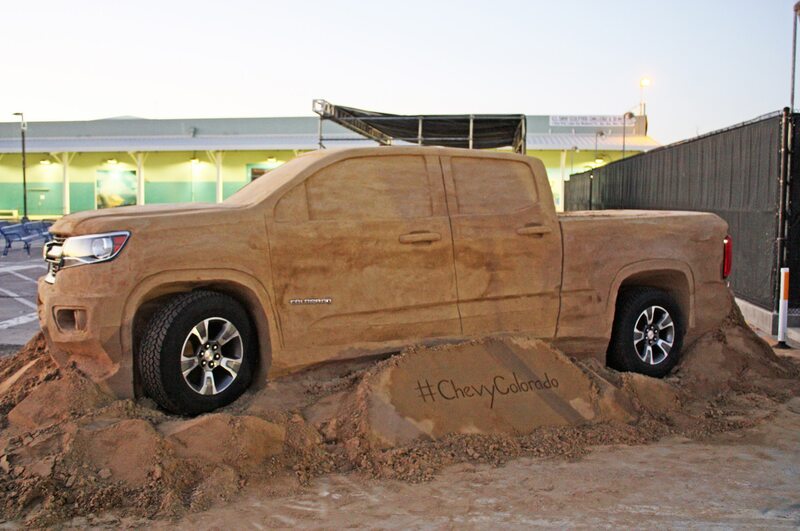 Is it a good thing or a bad thing if no one notices how revolutionary this truck is?